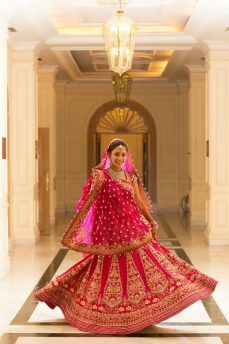 The fragrance of varieties in the clothing of Indians, Indian Punjabi suit is spread from Kashmir to Kanyakumari and Gujarat to West Bengal. 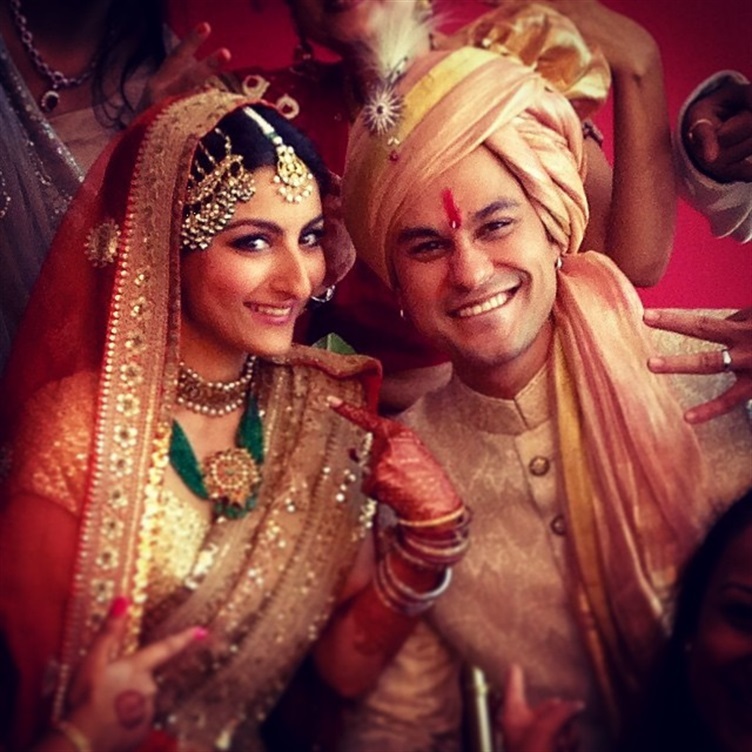 In India, every state has its identity by its food, clothing, rituals, and customs. 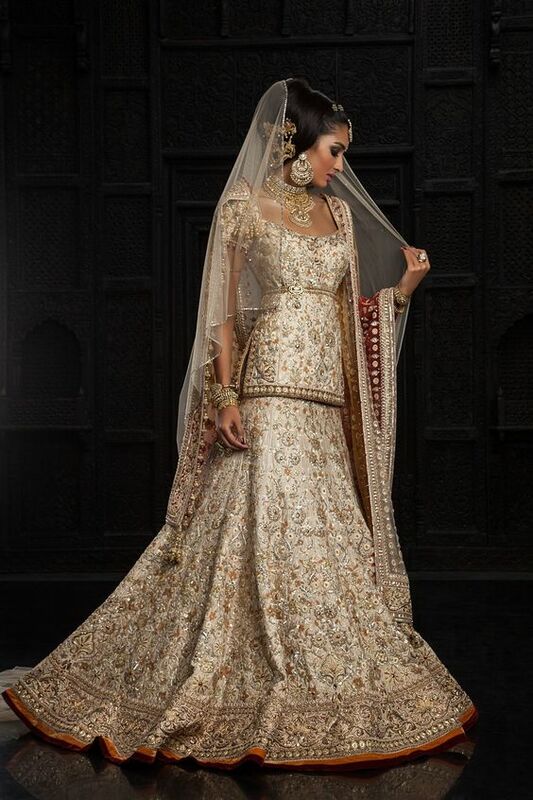 The bridal dressing styles get changed within a mile just as the density of air changes with height. 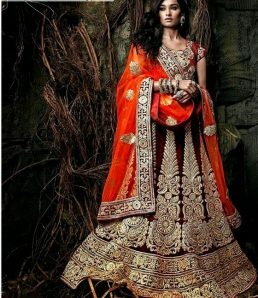 Here we are sharing the Different Cultures Indian Traditional Bridal Dresses Trends that are worn all over India. 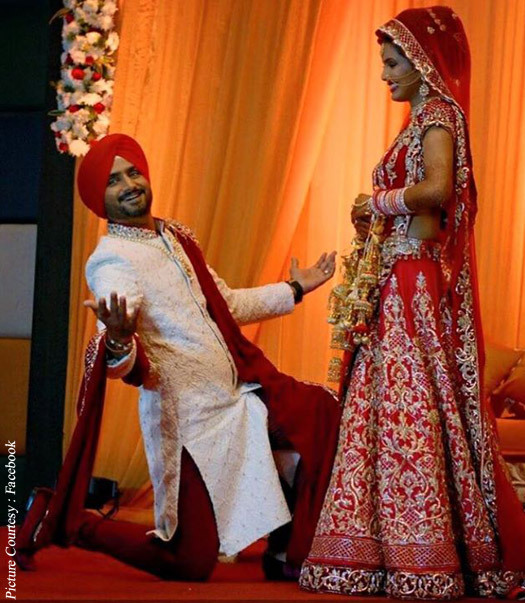 You may get wondered, but NRI people are also nuts about the Ethnic clothing of their respective origin. 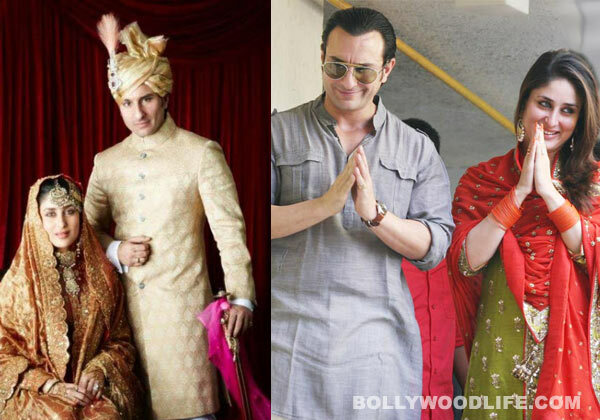 On the family functions, they prefer to go with Indian traditional only. 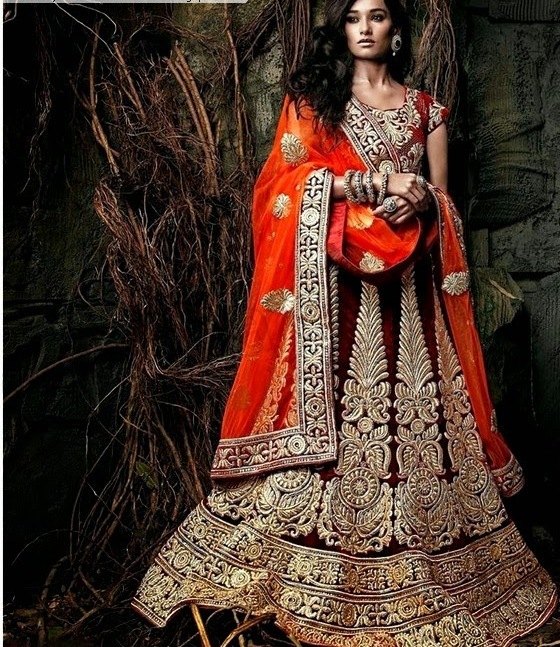 Have a look at the Different Cultures Indian Traditional Bridal Dresses Trends. 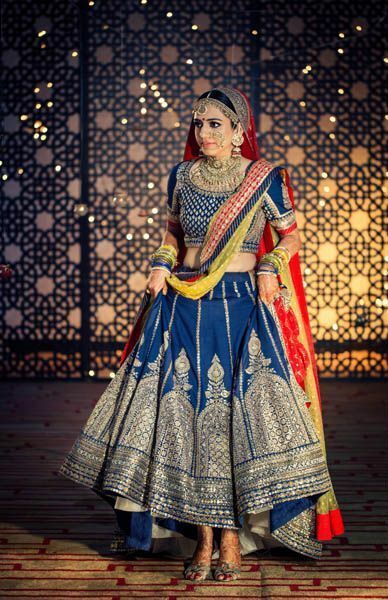 The Gujarati brides go for embroidered attires that simply hold the adorable look. 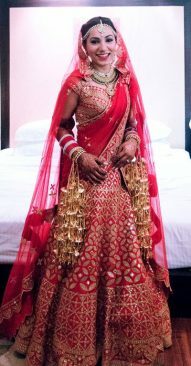 Village women are used to wearing Chania which is more akin to petticoat and adorned with glass work, the blouse called ‘choli’ and ‘odhni’ which is a piece of fabric cloth that covers the body and back side of the head. 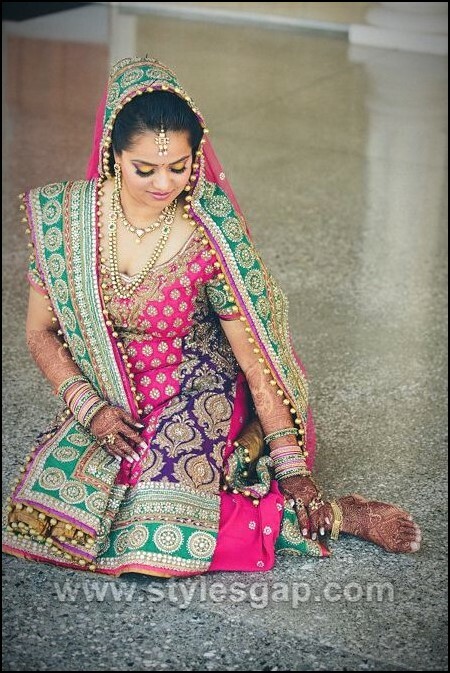 ‘Bandhani Saree’ and ‘Patolas” are the identities of Gujarat. 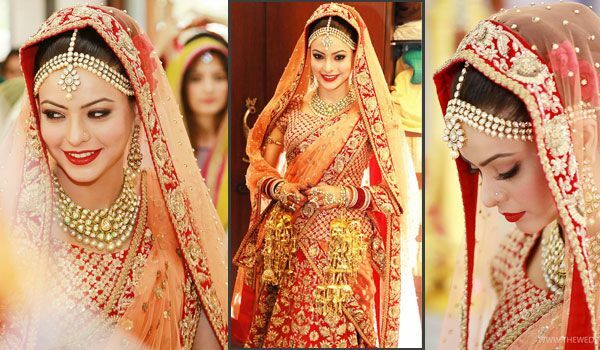 The regional dressing of Rajasthani brides is just similar to the Gujarati outfits. 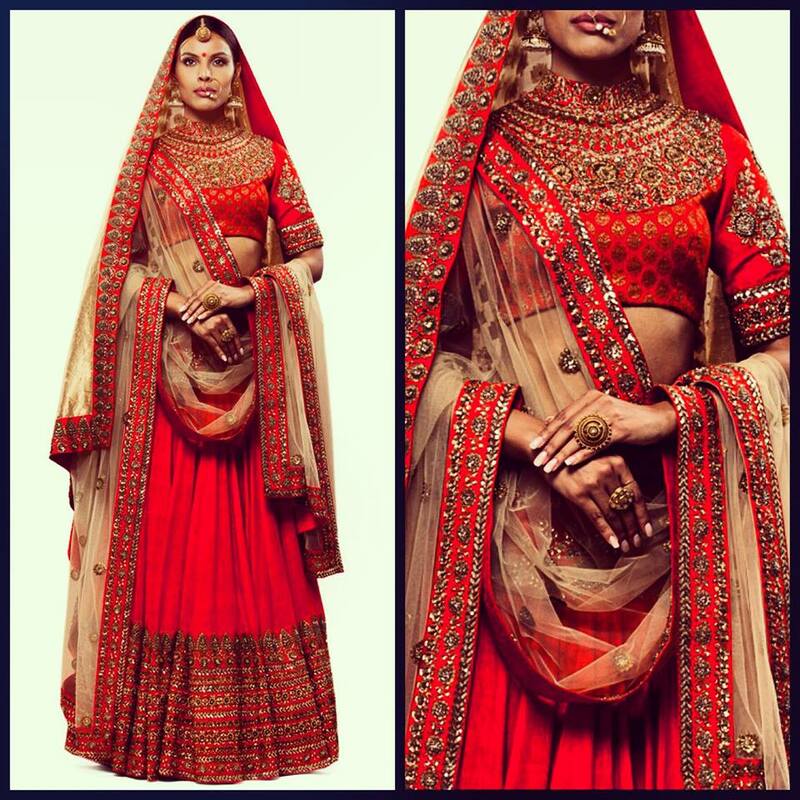 They wear Ghaghara, choli which has a greater length than Gujarati choli and odhani. 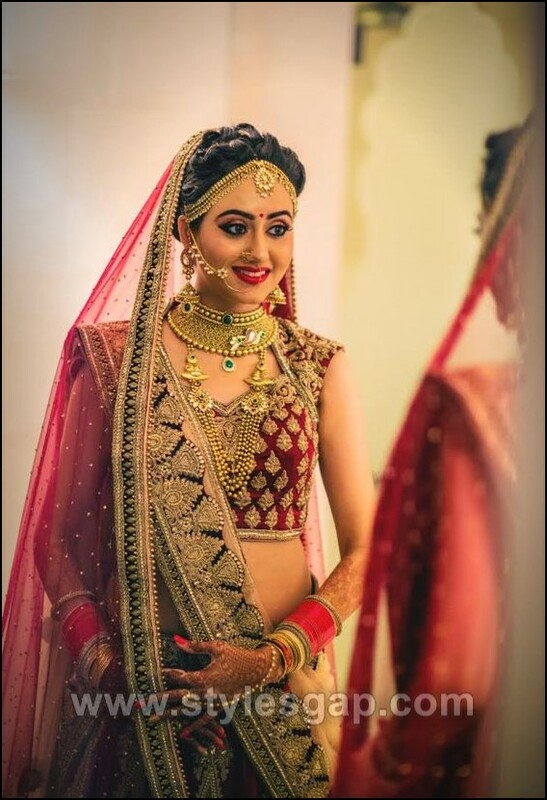 But if we take a look at royal dressing style of ladies which is known as ‘Rajasthani Poshak’ then it is indeed heart throbbing. It mirrors the culture and uniqueness of Rajasthan. 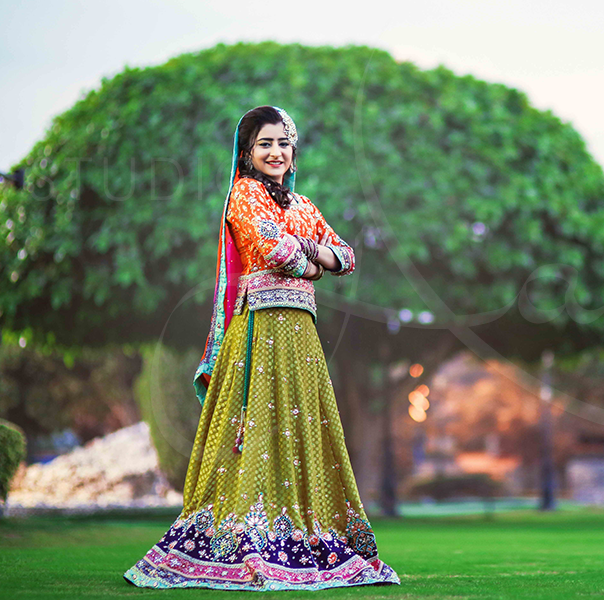 ‘Phulkari’ is the traditional clothing of women of Punjab. 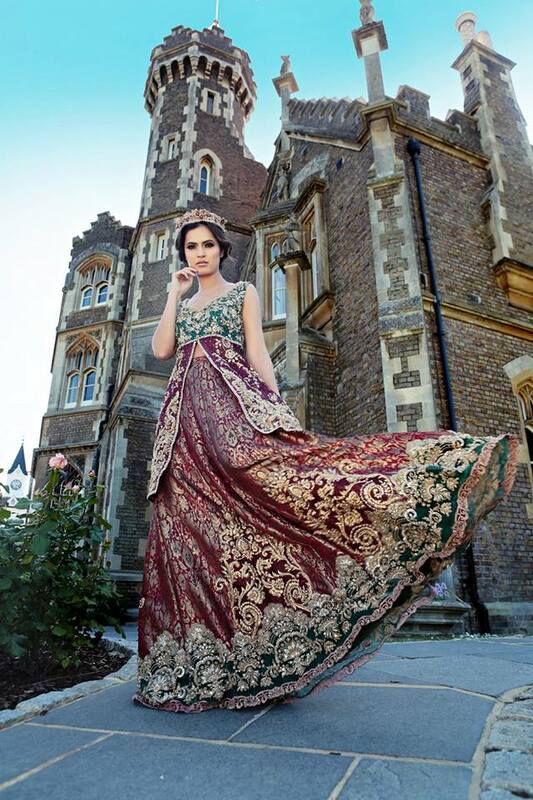 It is also known as ‘Bagh’ which is decorated with heavy embroidery and vivid patterns. 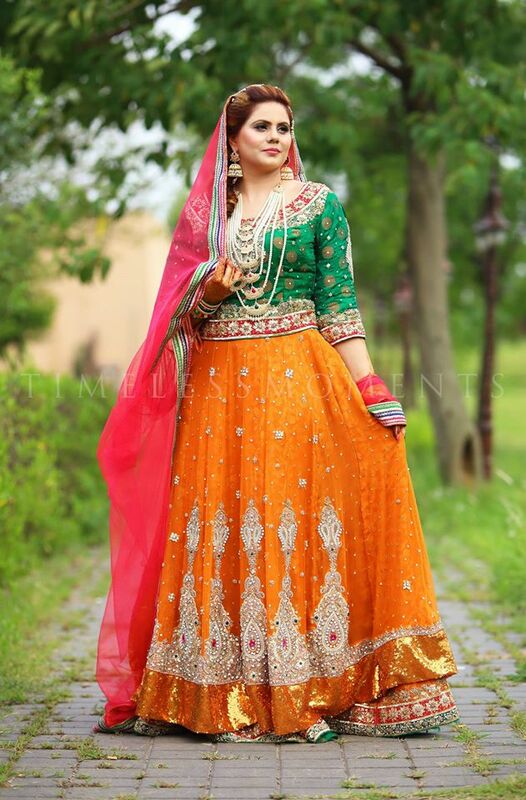 Moreover, its designer Patiala Suits and dresses are the trademarks of Punjabi women dressing designs. 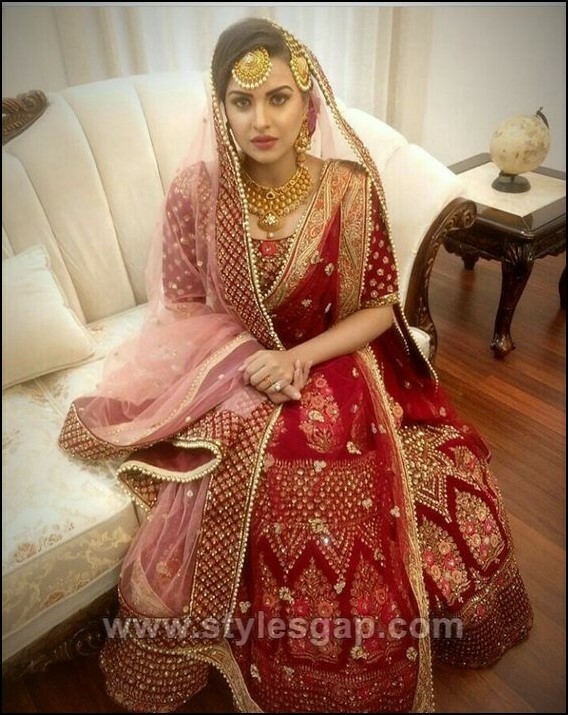 This wearing style is not only limited to Punjab but all over India; the women prefer to wear them either we talk about work or parties, family functions. 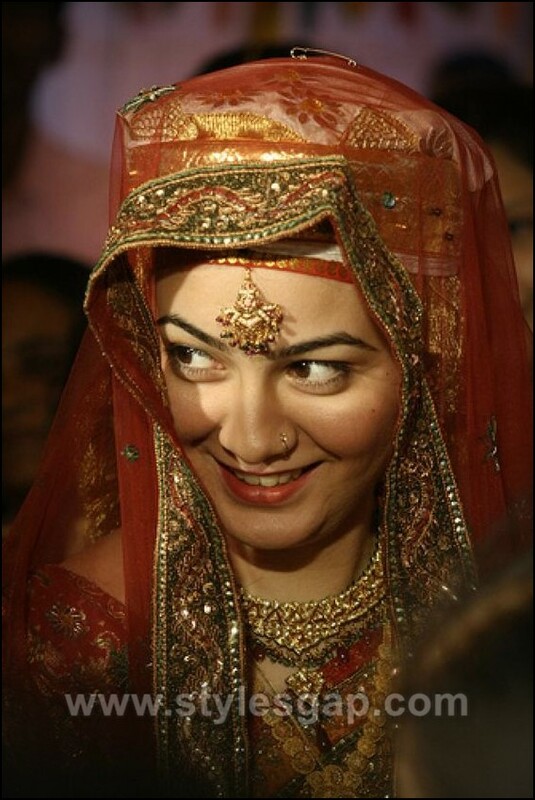 The way Maharashtrian brides own the sari, it truly reflects the culture and traditions of the state. 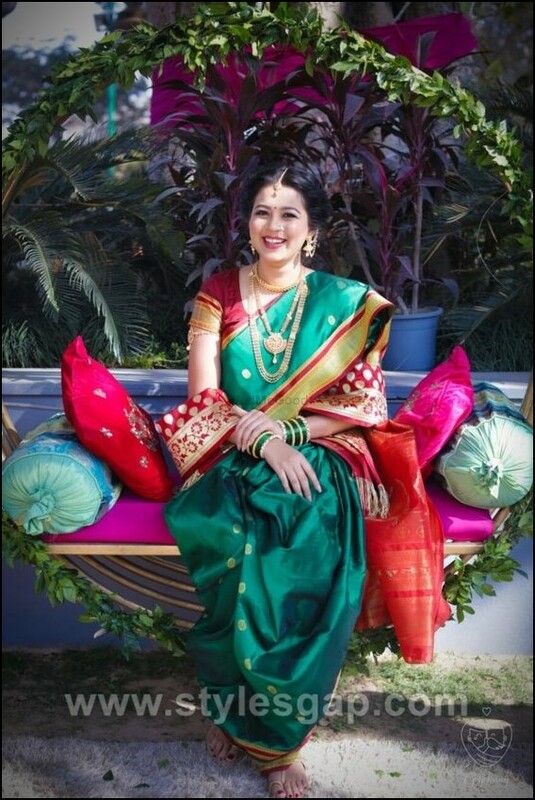 They simply wear sari and choli, but it more resembles the draping style of ‘Dhoti.’ The style is also known as ‘Kasta or Nauvari sari’ which means 9 yards. The length of the sari is 9 yards. 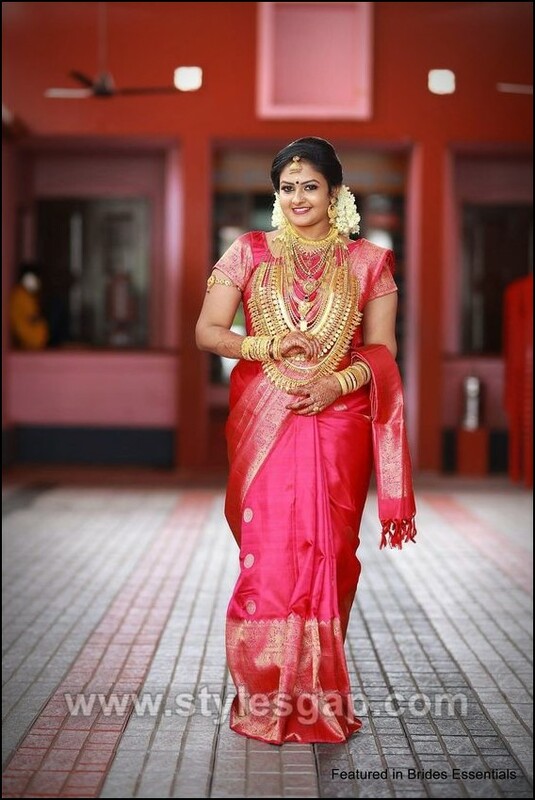 The women fold their sarees and tuck them on their back. 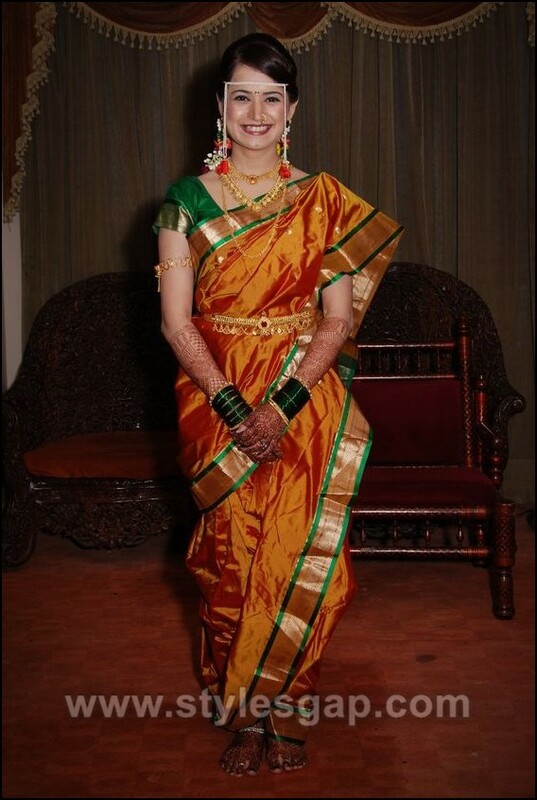 It is needless to say that ‘Kanchipuram saree’ rocks in Tamilnadu. 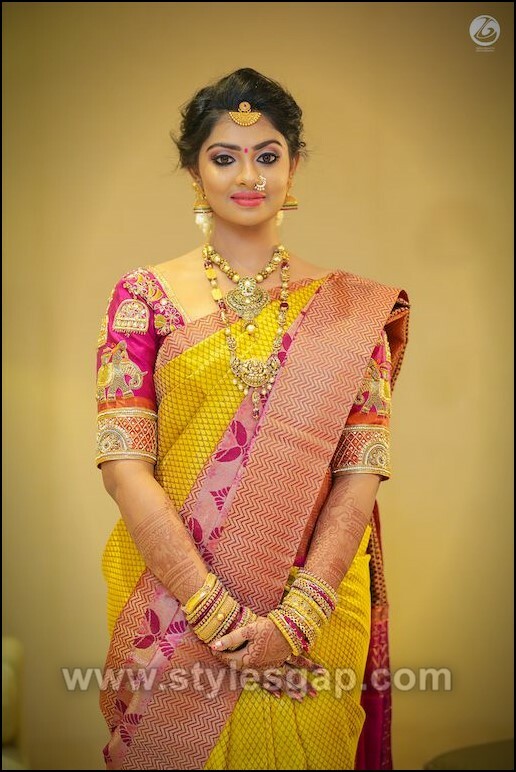 The women prefer to wear Kanchipuram in wedding occasions, family functions, and workplaces as well. 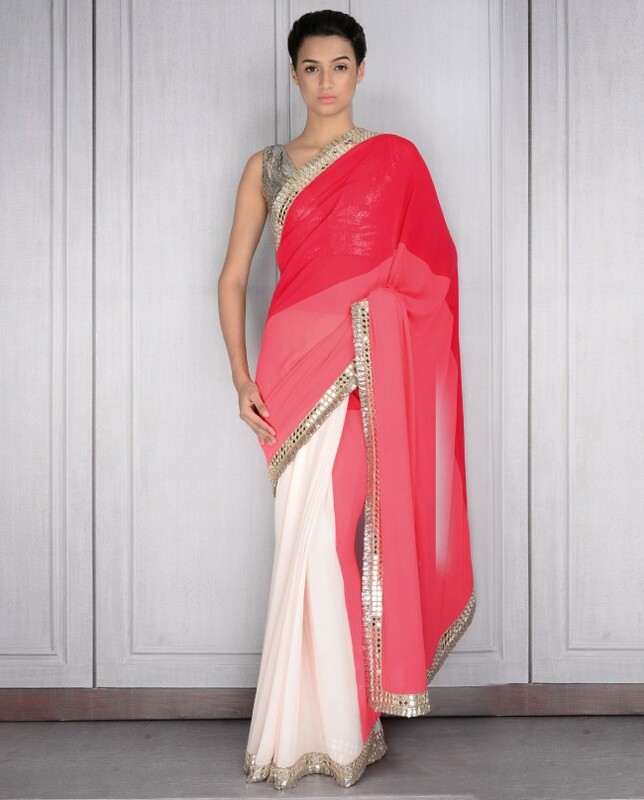 These sarees come in various colors, designs, and textures. Hence they are famous in all over the world for their unique designs. 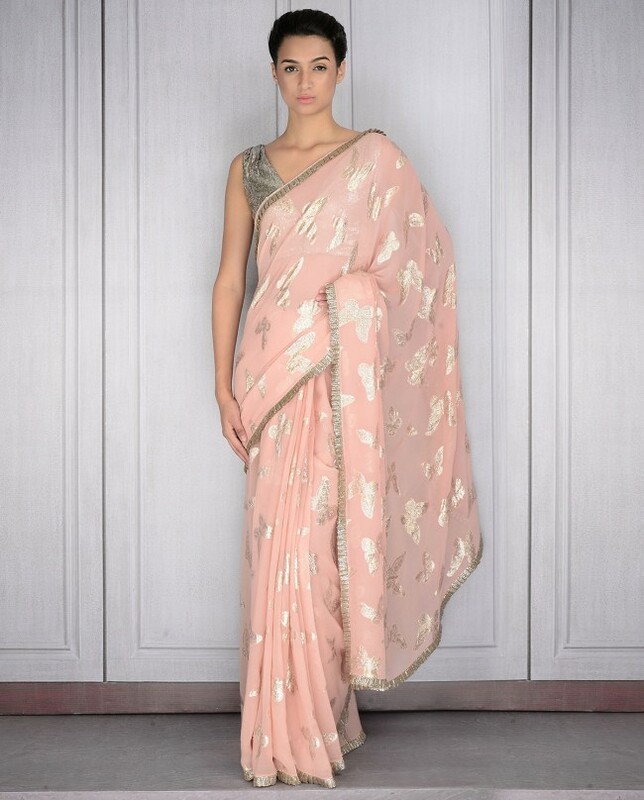 The sarees consist of silk and cotton fabric and it has a length of about 6 yards. 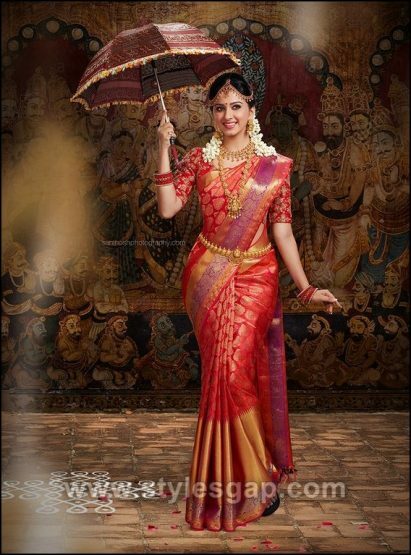 Heavy work and embellishments decorate the heavy Kanchipuram sarees. The state holds diversity in the topography but the similarity in the clothing style of men and women. 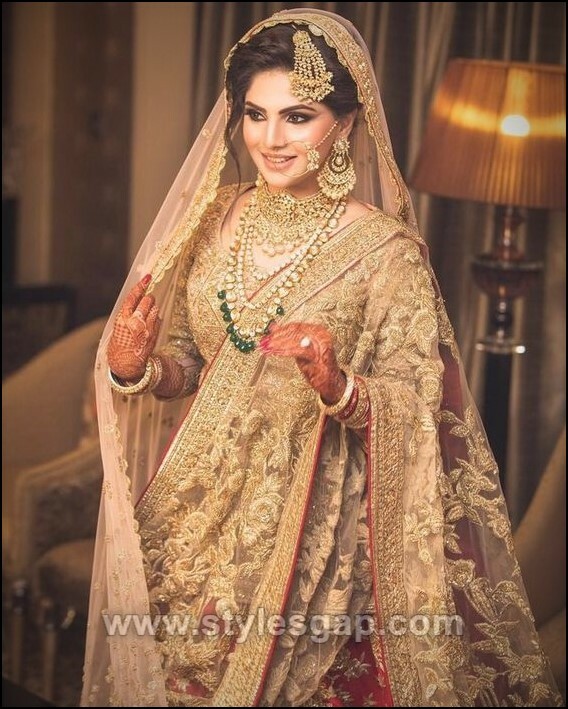 The men and women wear same cloth called as ‘Pehran.’ It is a combination of two gowns which are dressed one over another in layers. 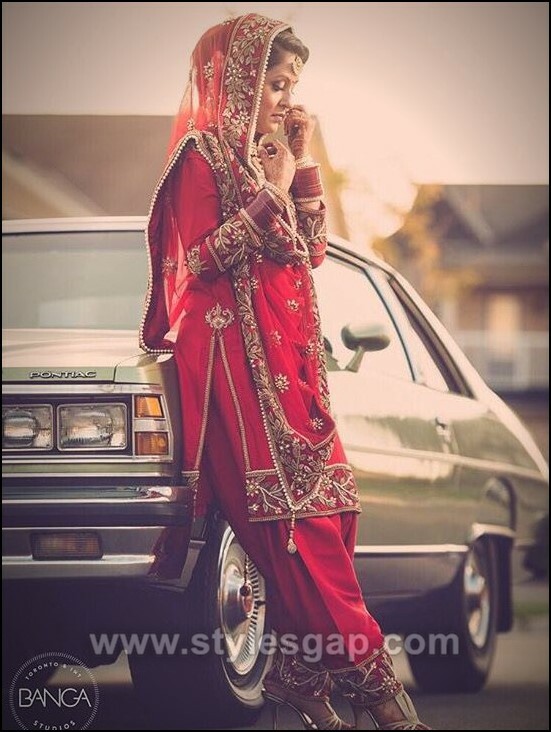 Nowadays, the Pehran is worn with a Salwar just as the Afghani women wear. However, in bygone years it was a single piece of long cloth only. 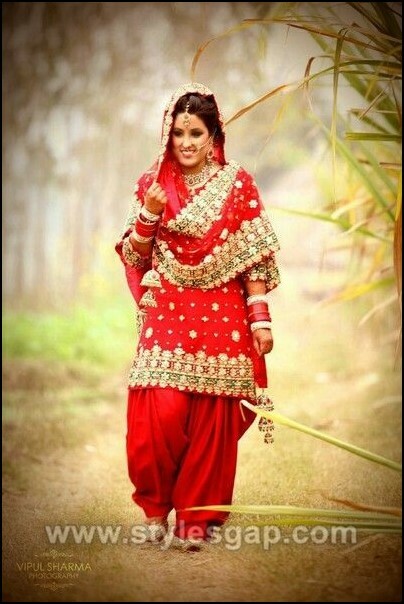 Haryanvi brides are more inclined towards vivid colors of clothes. Their traditional Indian clothing style includes ‘Damaan,’ ‘Kurti’ and ‘Chunar.’ Chunar is a cloth which is adorned with different work and it cover the back side of the head. The kurti resembles with shirt type blouses. It usually comes in white colour only. 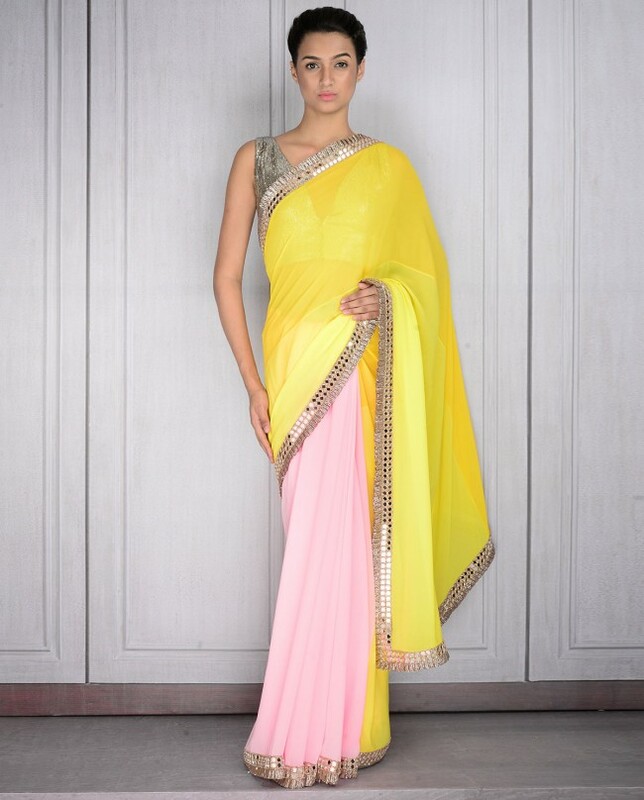 Damaan is a cloth which more akin to the skirt which comes in various colours and patterns. 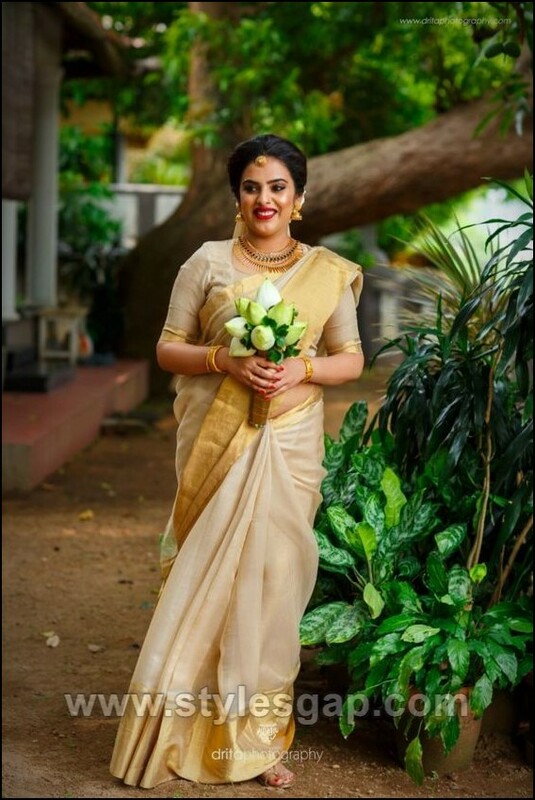 In Kerala, the customary dressing style of Indian Kerala brides is known as ‘Mundum Neriyathum.’ It is a combination of two cloth pieces. One piece of cloth called ‘Mundu’ is covered the lower part of the body while another piece of cloth covers the upper portion. The Neriyathum drapes around the blouse. You can also wear Neriyathum in a modern Saree style. 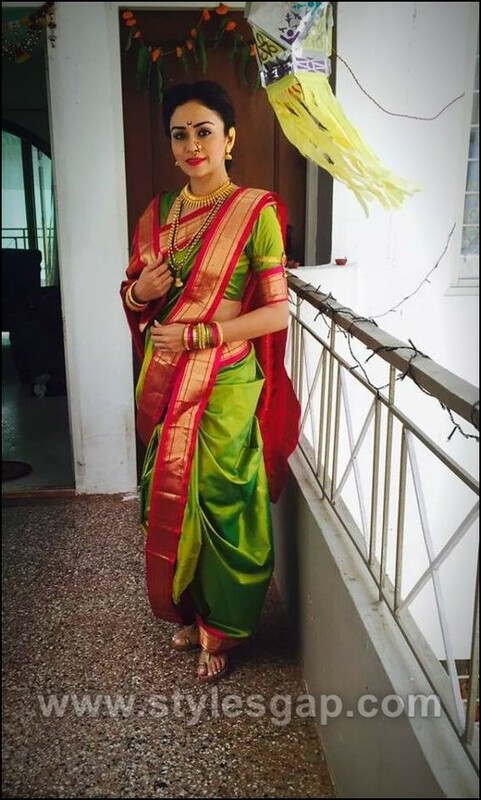 Every corner of India holds its uniqueness of dressing style. 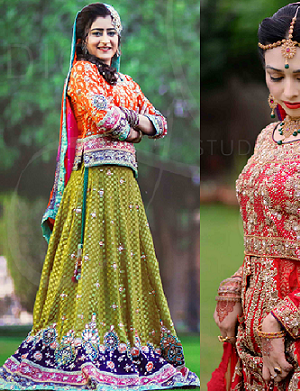 All the outfit designs reflect the culture and customs of their respective regions. Few dressing styles are still same as they were in bygone years; some have got changed with the modern age. 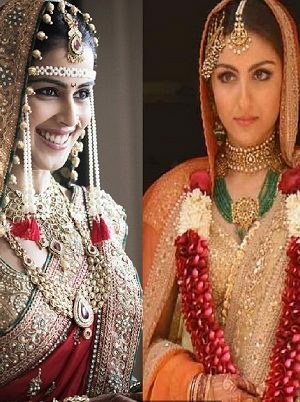 Moreover, some dressing styles such as Kanchipuram, Patiala suits, and Punjabi dresses are famous not only in India but all over the world. 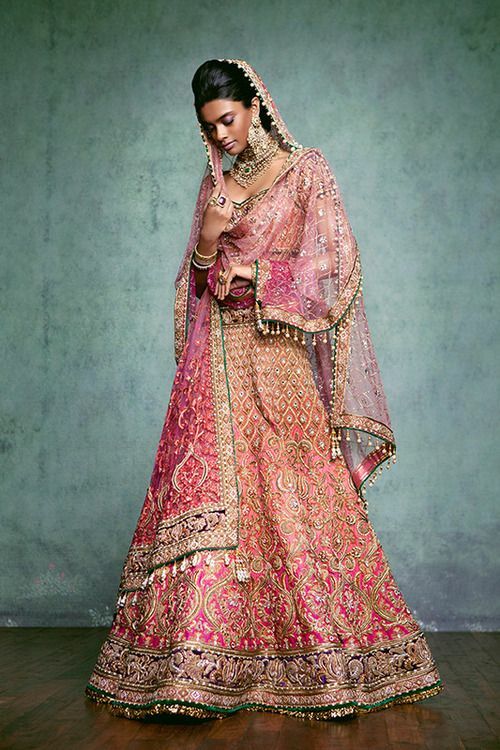 Hope you have loved the Different Cultures Indian Traditional Bridal Dresses Trends. Keep following us for more. 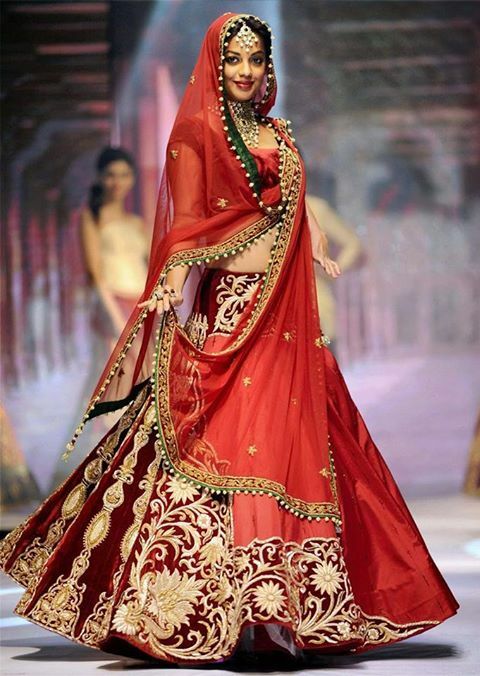 When it comes to following trends and fashion, women love to follow their favorite fashion and Bollywood divas. 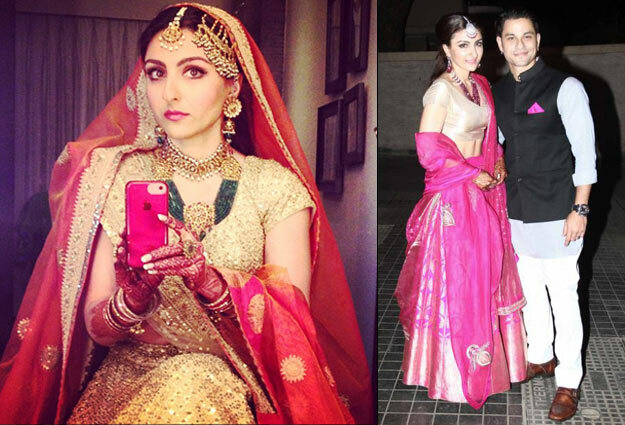 Even for the weddings, plenty of the girls copy the examples set by Bollywood actresses at their wedding reception. 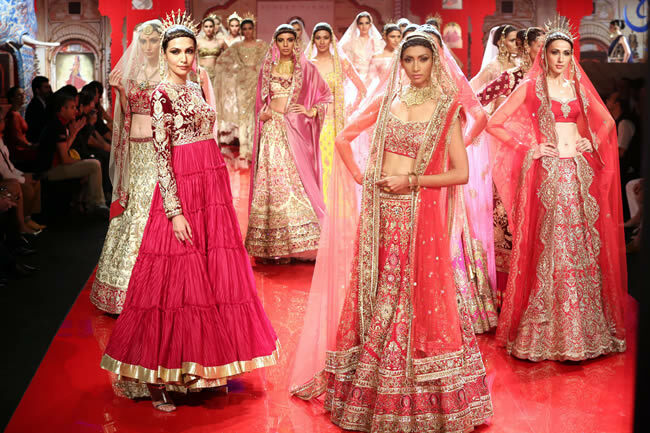 The dress they wear, the makeover and the hues selected by them are all considered as a trend. 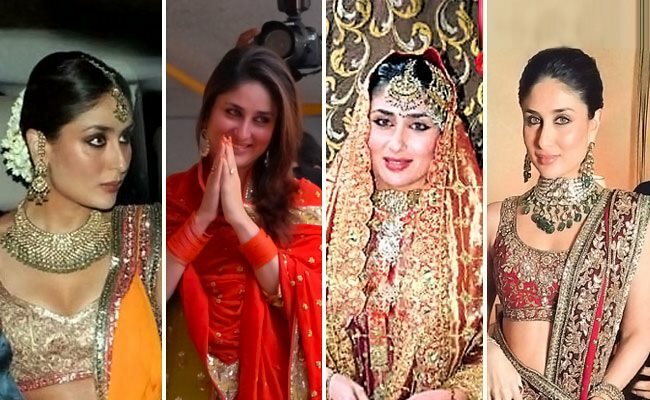 Indian Bollywood celebrities have a somewhat wider influence on the latest fashion trends in the country. 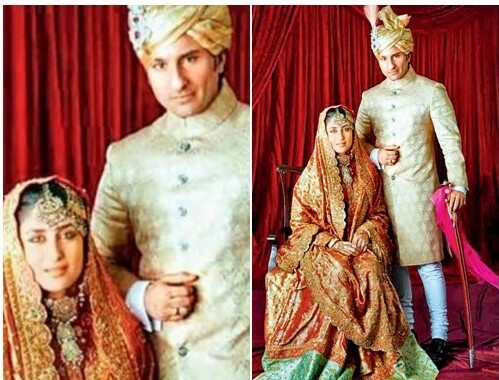 Here we are sharing the 10 Famous Indian Celebrity Wedding Dresses. 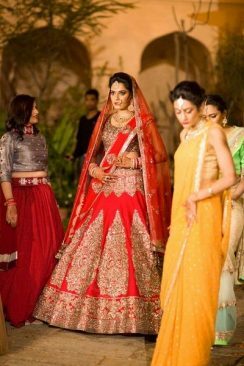 In this article, we are going to provide the best of the ten wedding dresses that were worn by the India’s finest Bollywood divas. 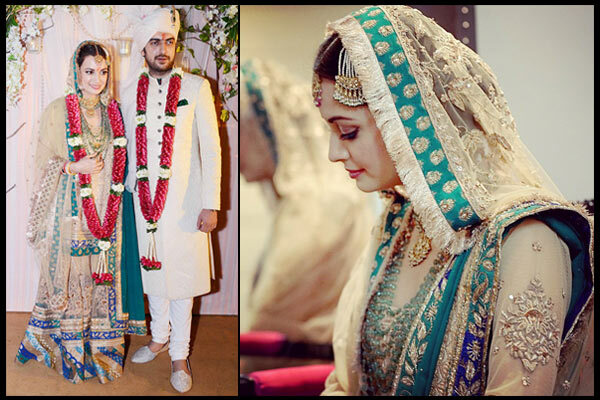 And indeed, they all looked fabulous and gorgeous in their big day dresses. The brief insight of the wedding’s couture carried by Indian celebrities will lead you in the right direction if you are looking for a perfect wedding dress for your day. 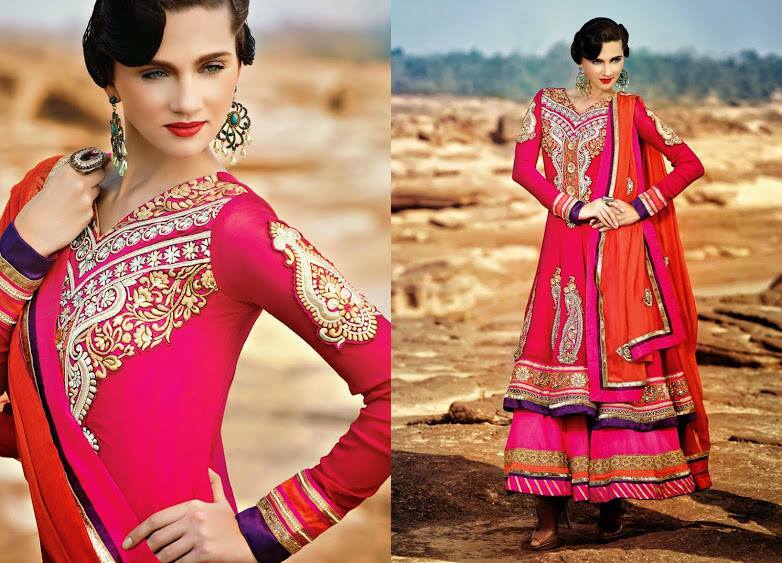 Fancy embroidery with splashes of colors will stun you. 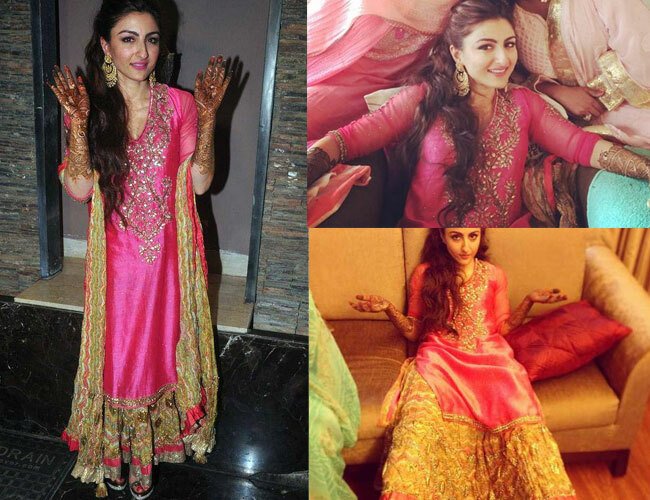 Tied in the marital bond, Soha Ali Khan amazed her fan followings even on her wedding day with her beautiful selection of the wedding dress. 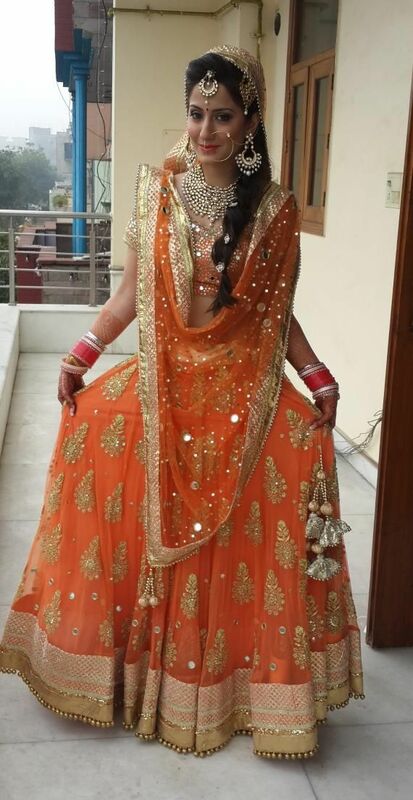 Her gold Sabyasachi lehenga with orange dupatta was looking magnificent and was complimenting her makeover. 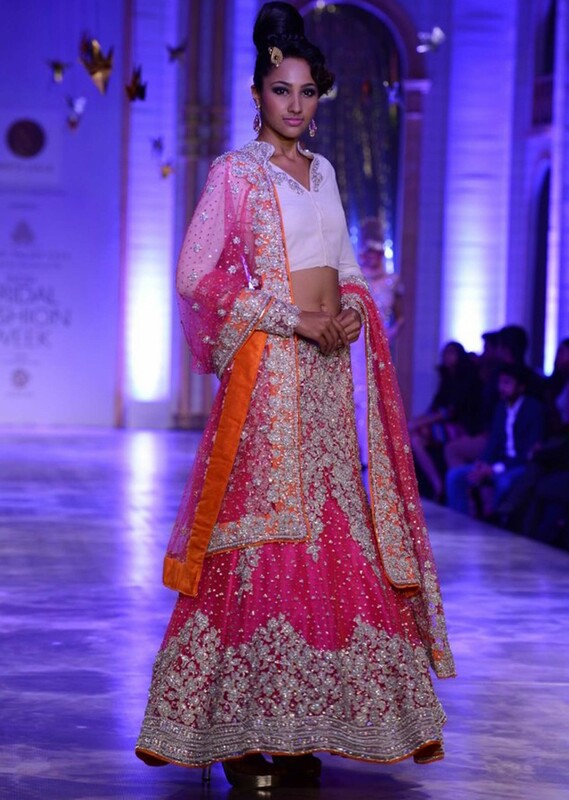 Her reception lehenga was exquisite, taken from the finest of the Sanjay Garg’s spring collection. 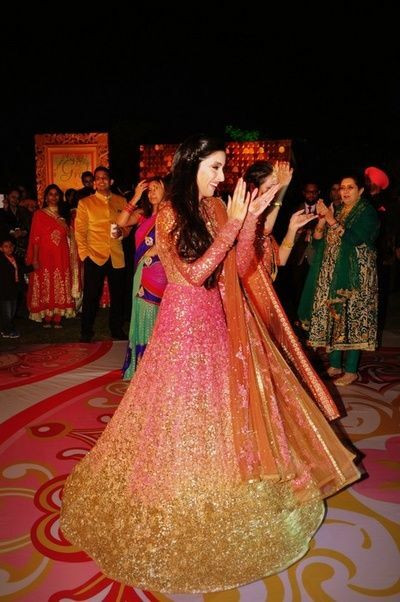 The blingy embellishments were bringing that glowing appeal in her dress. 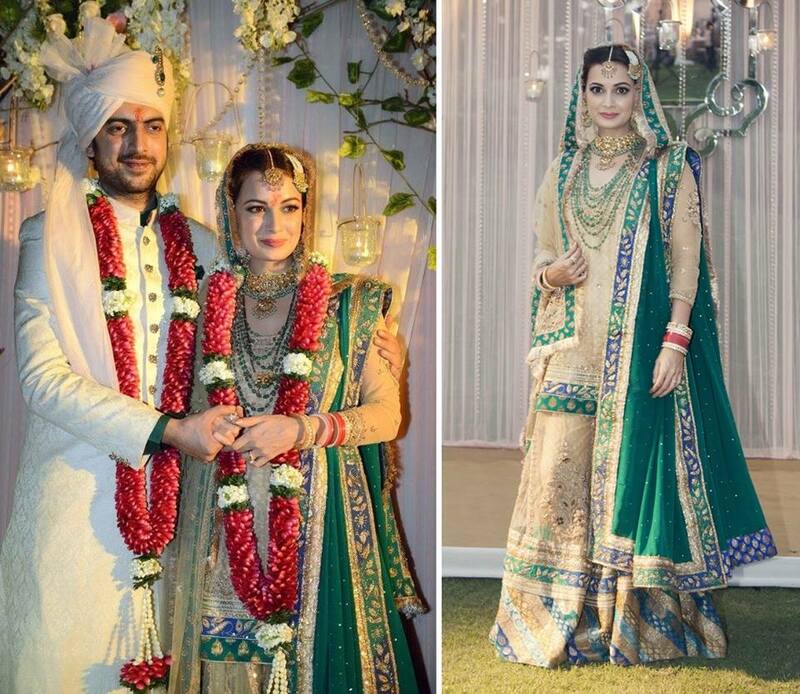 As charming as she always has been, Dia Mirza looked mesmerizing in her Hyderabadi bridal dress, spilling the glow with simplicity. 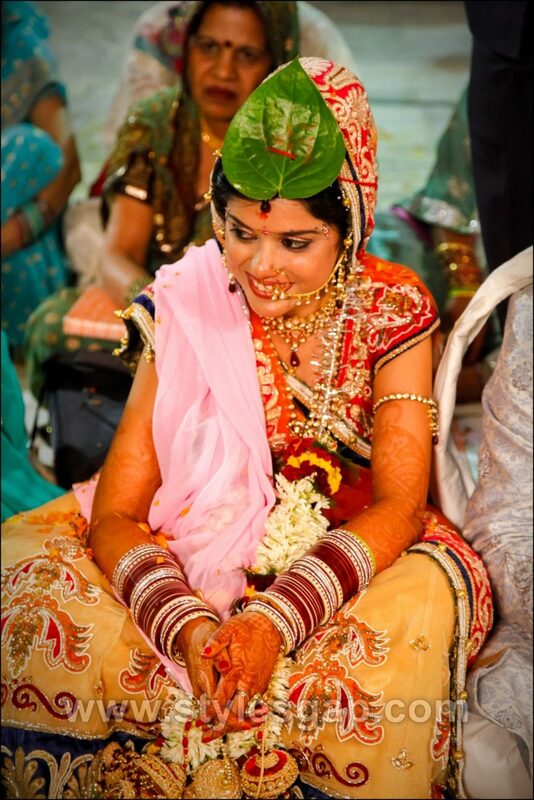 The beautiful ivory dress with the highlights of green work in her lehenga looked amazing. She stunned her fans with the grace of her wedding outfit as she walked down the wedding floor. 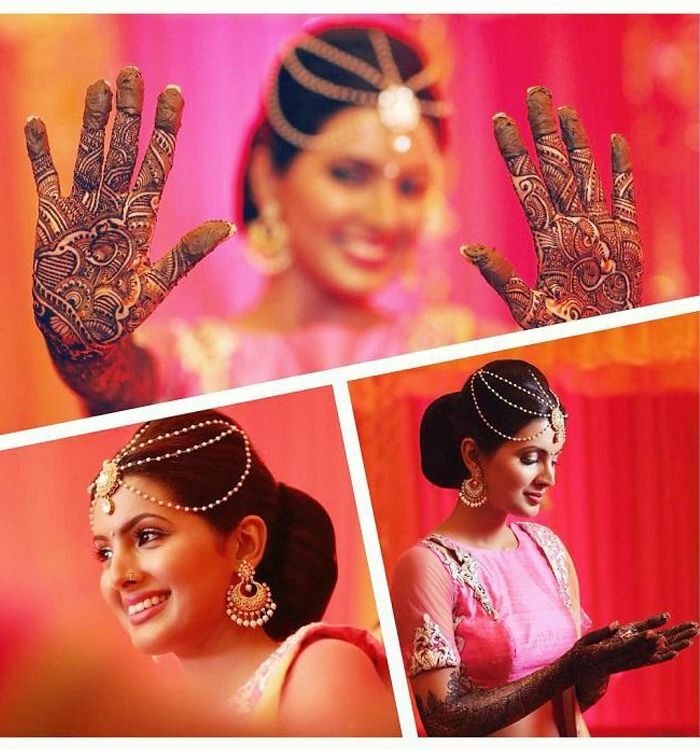 The latest buzz of the finest wedding couture of the lovely Geeta Basra was all over the news. 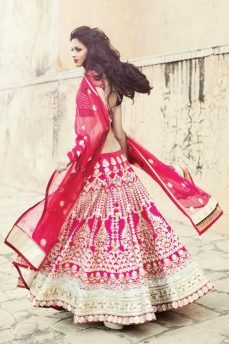 The traditional red of her lehenga was looking amazing with beautiful silver mixed gold embroidery on the tailed lehenga. 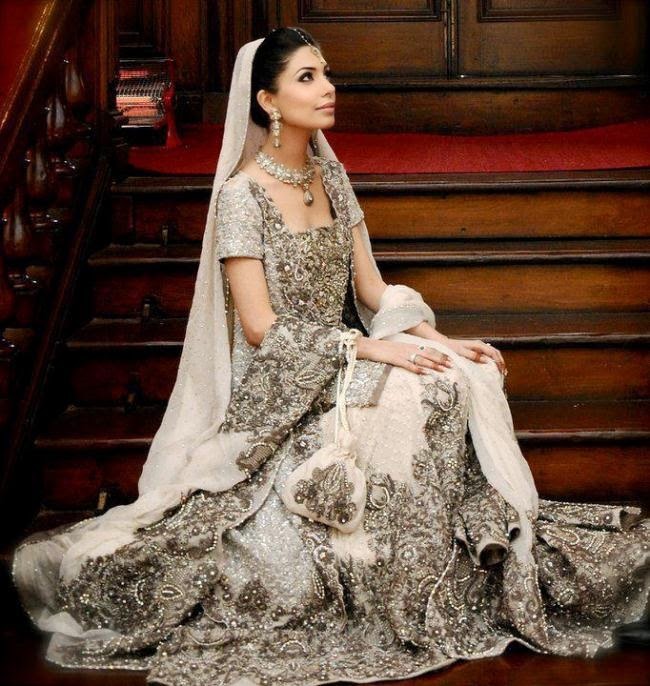 The floral patterns in shimmer were highlighting the beauty of the dress. 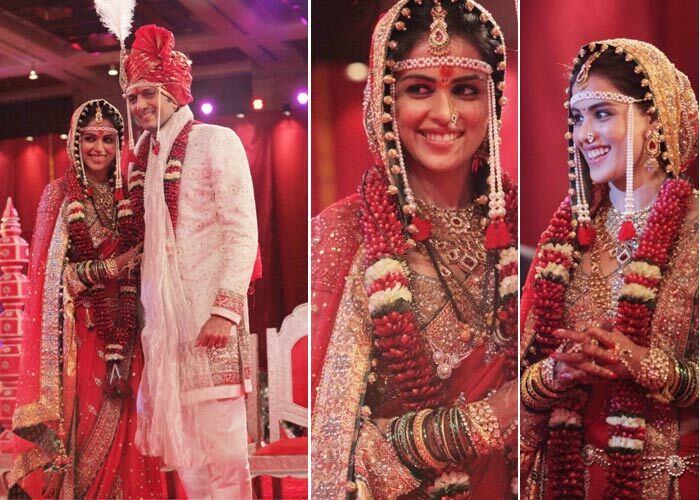 Genelia Deshmukh’s wedding was marked as one of the greatest royal wedding events in the history of Bollywood. 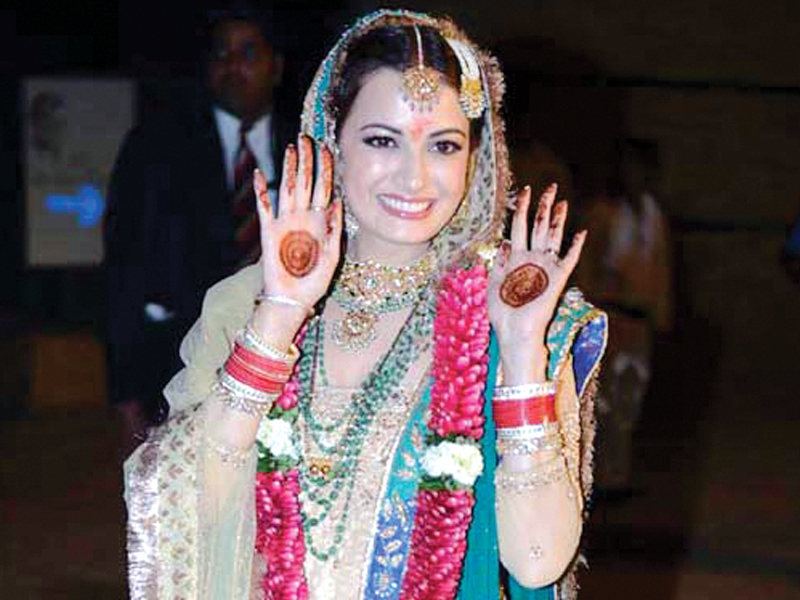 So does her wedding dress that complemented her cute and lovely looks. 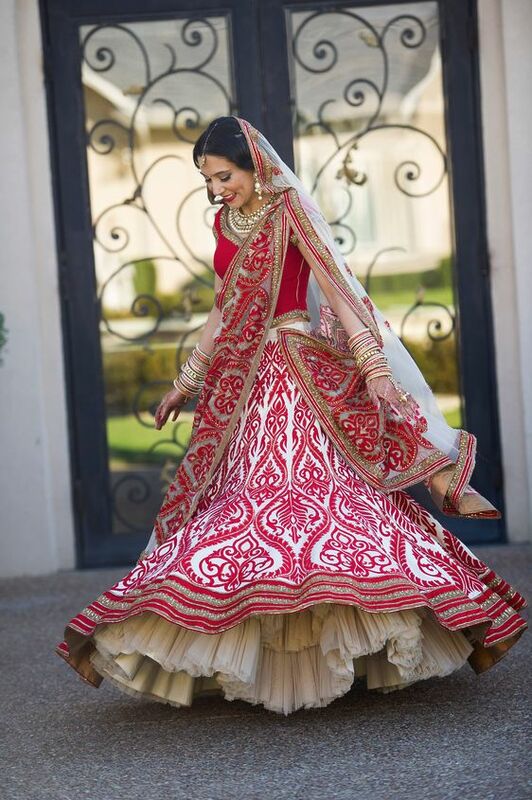 The combination of red with ivory gave her dress an elegant outlook. 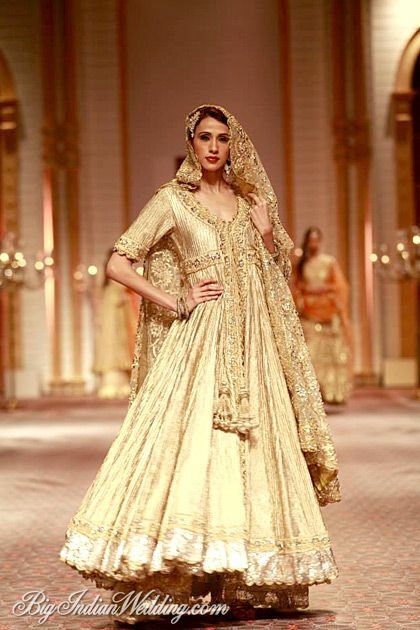 Embellished with fine embroidery, the fall of her drapes made the dress look ravishing. At her wedding event, the famous beauty queen of India, Aishwarya Rai Bachan opted for the best of the bridal saree in soft hues and shades of yellow with a more traditional Indian outlook. 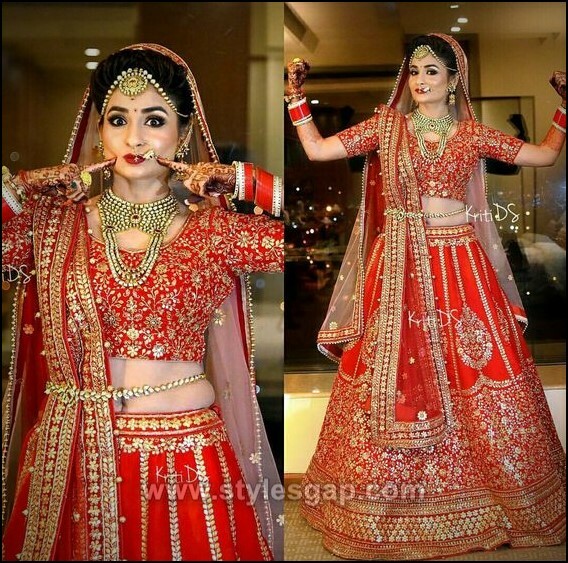 The hottie of the Indian Bollywood industry turned out to be extremely gorgeous in her bridal outfit. 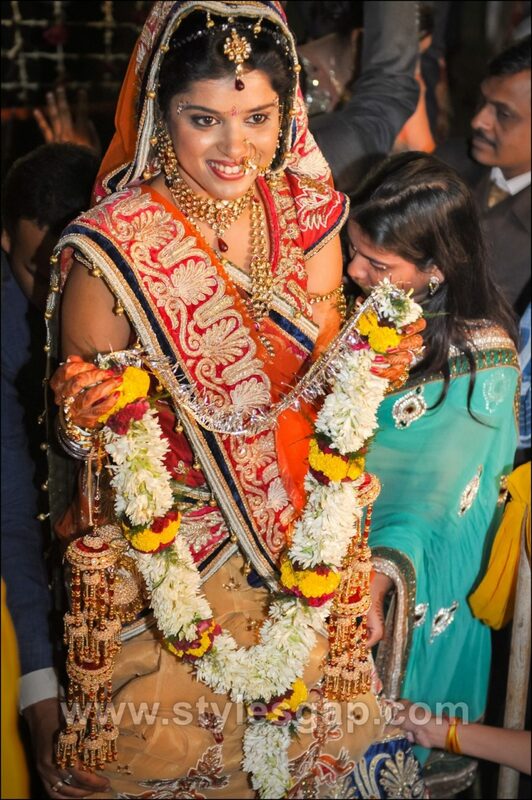 The way she carried her bridal saree, with heavy work of gold embellishments. 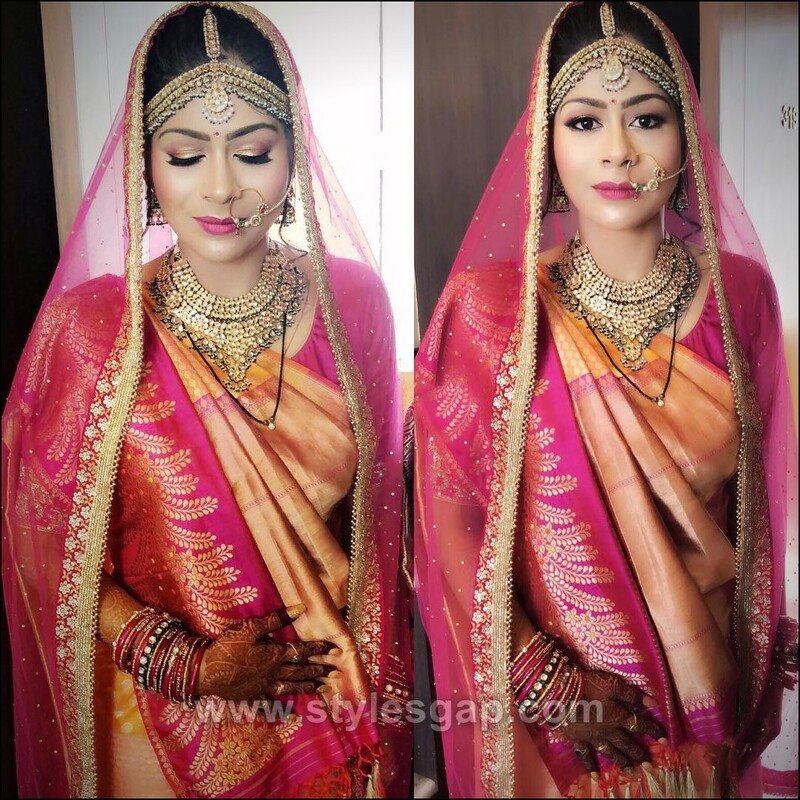 The shades of the saree were quite elegant and soft, highlighting her perfect makeover. 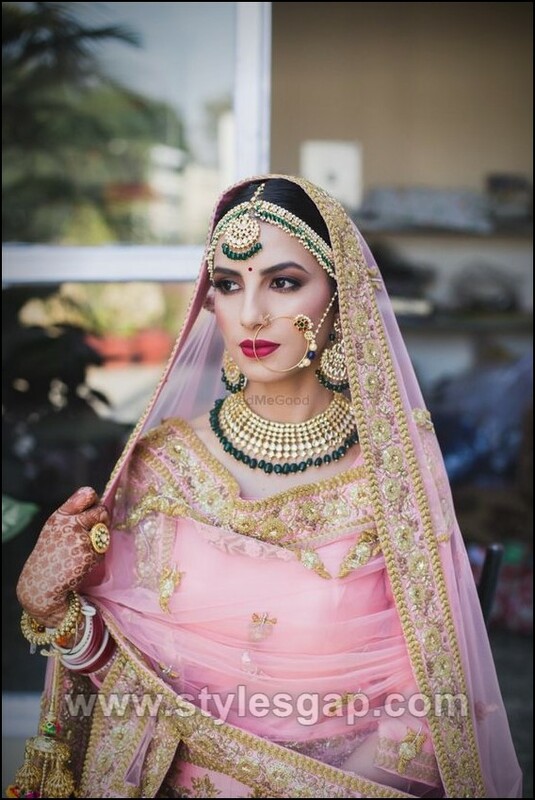 The beauty of the Deol family turned out to be a stunning bride. 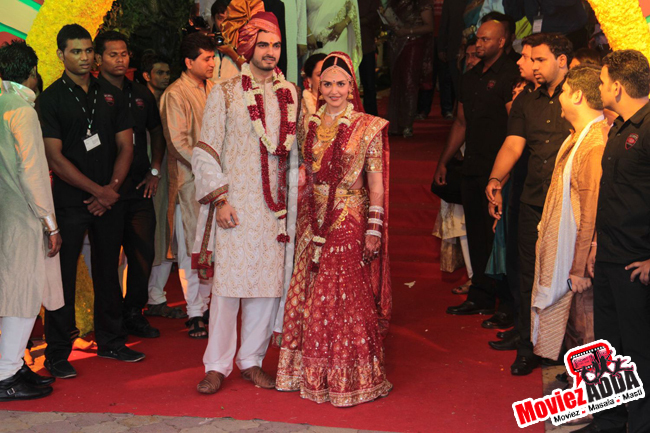 Esha Deol donned in her wedding saree with loads of flare and gold work. 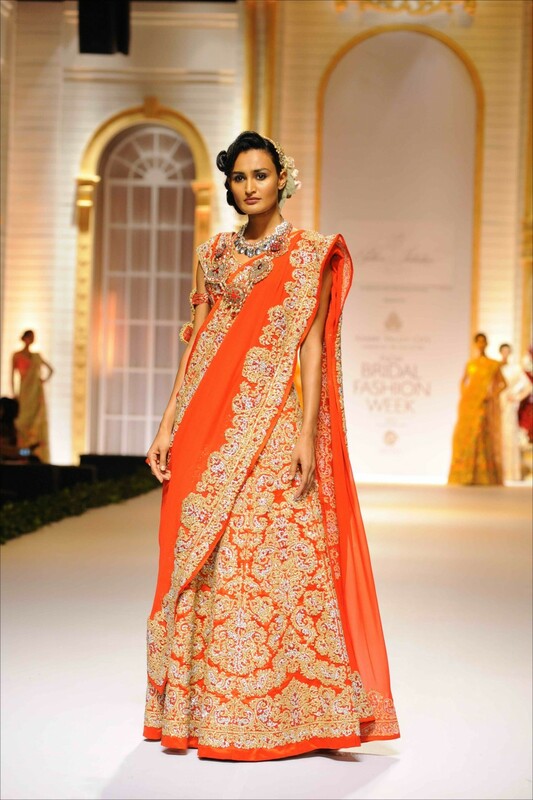 Heavy flares in the fall of her saree looked fabulous. 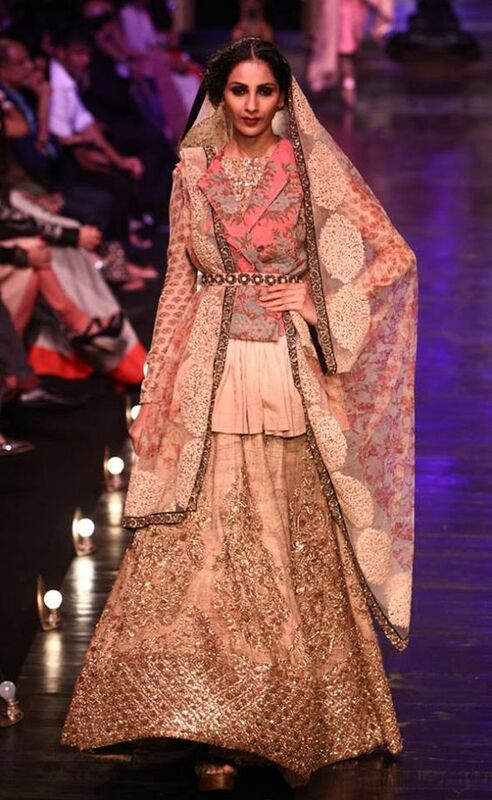 The style and beauty icon of India wore Manish Malhotra’s designed gharara with shades of pink, heavily adorned with gold embroidery work. Heavy gold jewelry along with hair in chignon was giving her a great outlook. 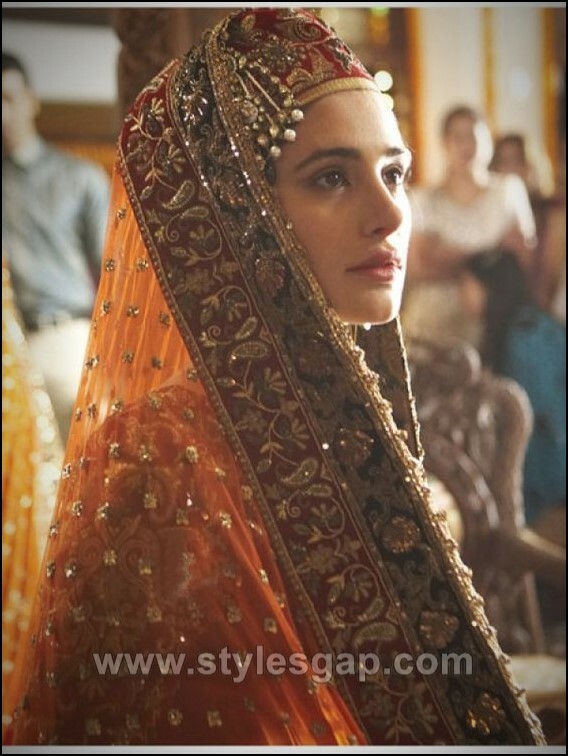 Whereas on her wedding reception at Taj Mahal she wore decades old gharara of her mother-in-law. 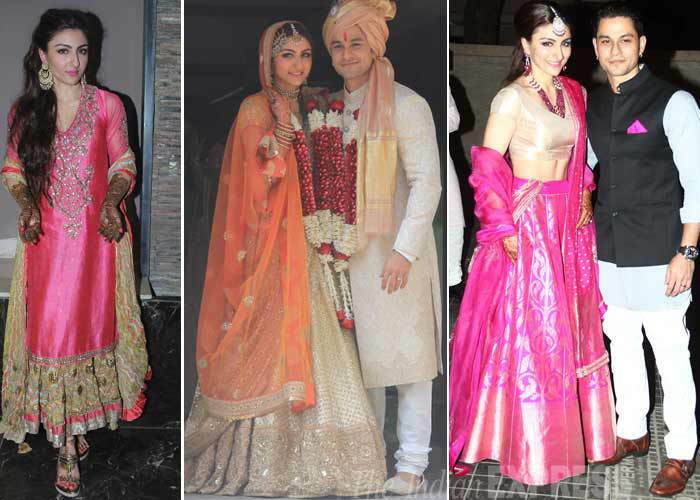 Another name of the Indian Bollywood industry, Shilpa Shetty carried a beautiful saree with heavy embellishments, on her wedding day. 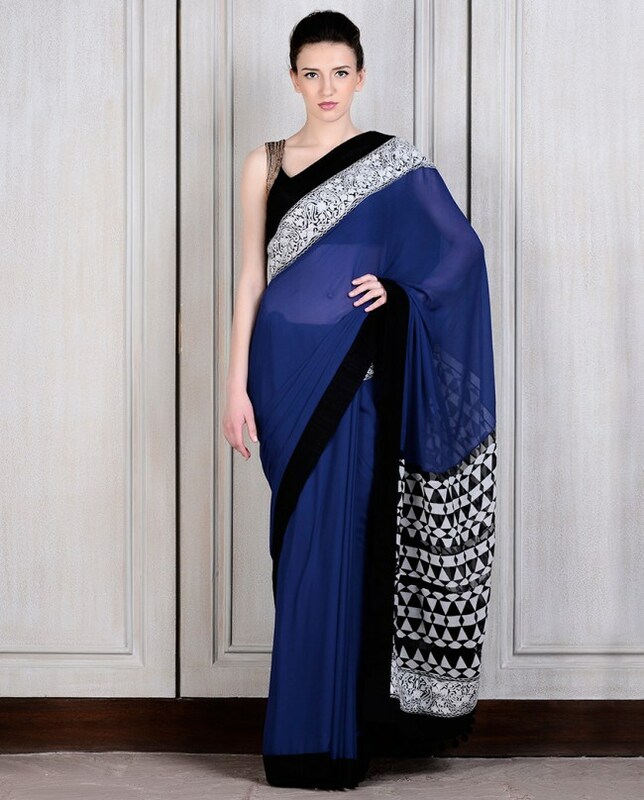 This traditional style Indian saree adorned with heavy embroidery work all over it. 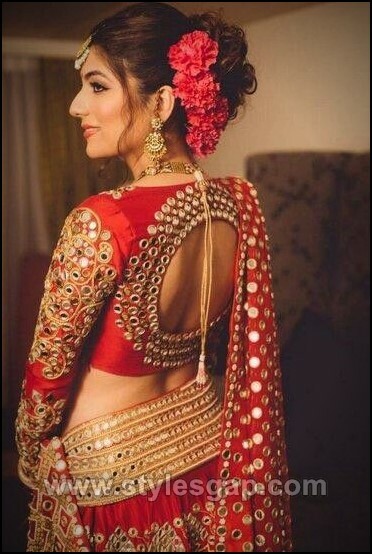 The drape of the saree was decorated with intricate patterns of embroidery, keeping the base colors red. 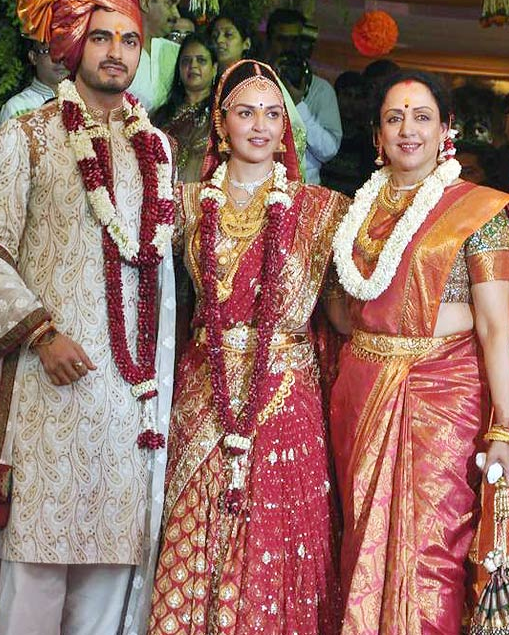 Sameera Reddy is another Bollywood celebrity who got tied in the bond of marriage in the recent past. 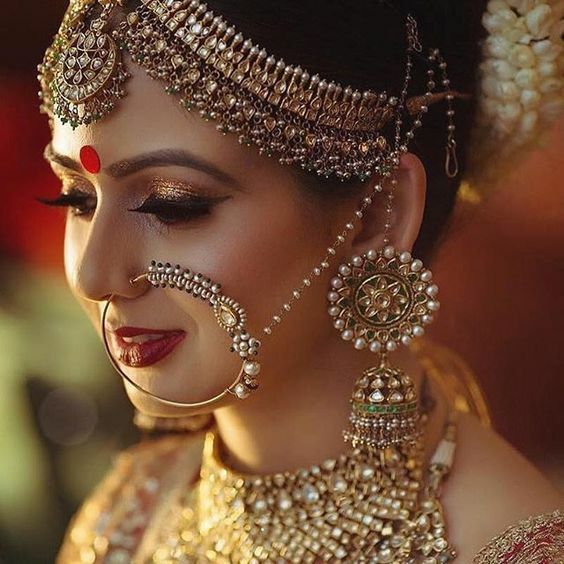 She carried her traditional Indian bridal look. 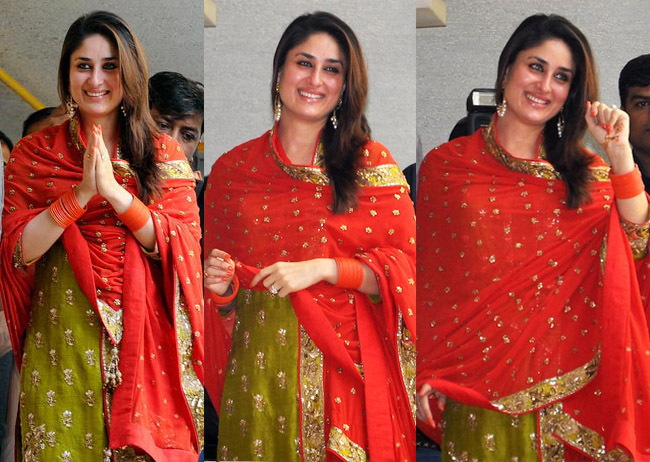 Her shimmering saree dress made her glow in the big event. 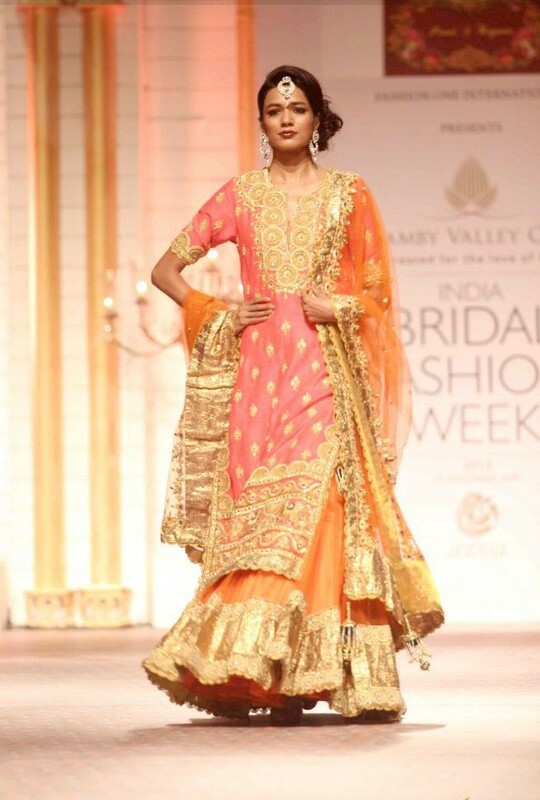 The shades of orange with rust and red were all combined in this dress, along with the work of gold at the borders. 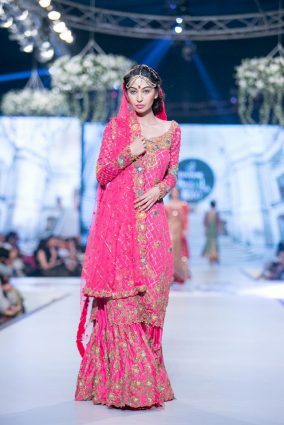 Fashion has its unique form prevailing in the southeastern part of Asia especially in India and Pakistan. 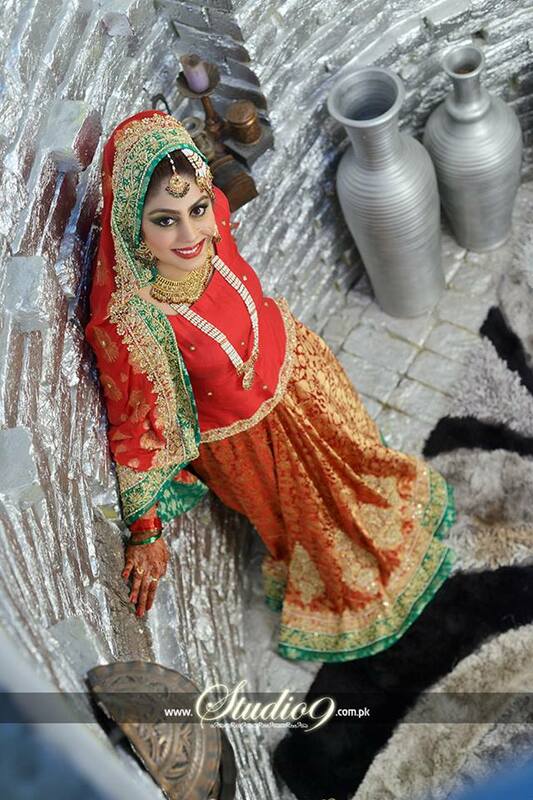 Our eccentric and distinctive culture is reflected in our various styles of dresses and customs or traditions existing in our society. When we carry our traditional apparels we are not just giving style but we carry our long forgotten customs that are the true assets of this region. 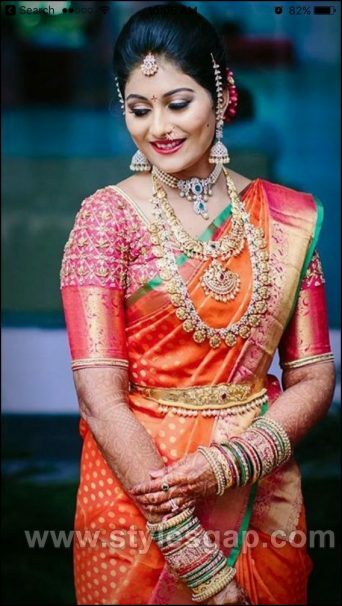 Whether it’s our sarees with long drapes or the lehenga’s with heavy flares, they all simply add up the beauty and elegance of the Indian women. 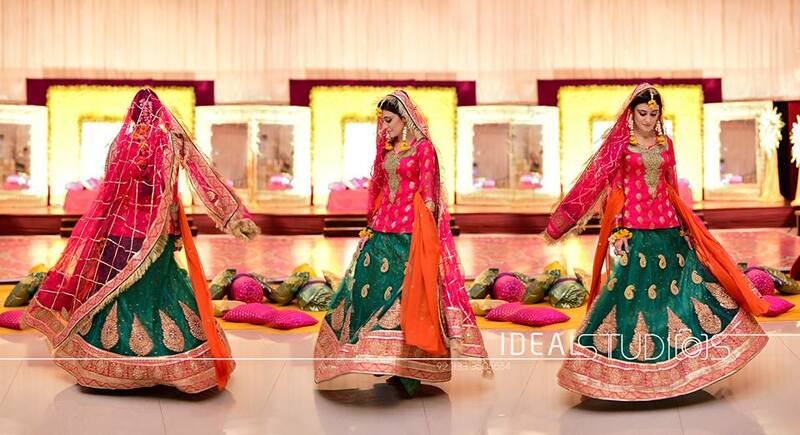 Ghagra/ lehenga choli is also considered as the important part of our eastern attires specifically for all the traditional wedding events in India and Pakistan. 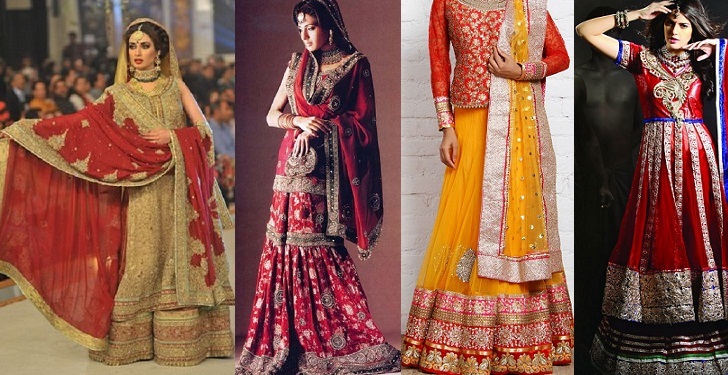 Here we are sharing the Indian Pakistani Ghagra/ Lehenga Choli Designs Collection. 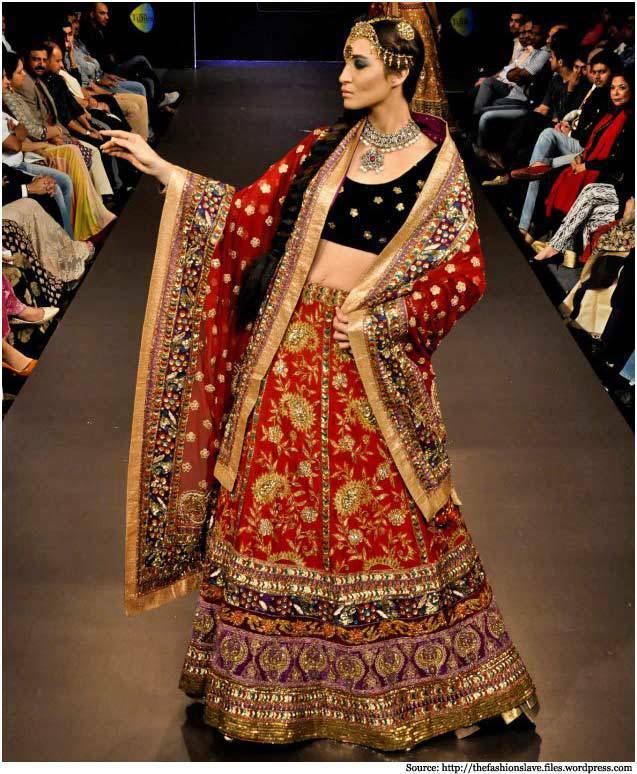 Originated from the soils of India, Ghagra choli is now equally popular across many eastern countries. In fact, even plenty of western women, love to try it every once in a life on some particular occasion. 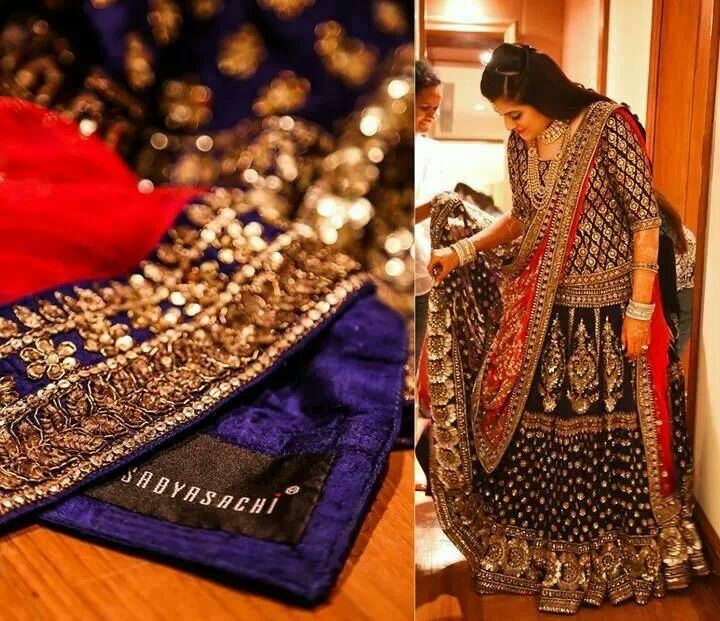 Ghagra choli is preferred over many dresses as they give you a lovely appeal and alluring outlook with its smart and gorgeous cholis coupled with heavy ghagra. 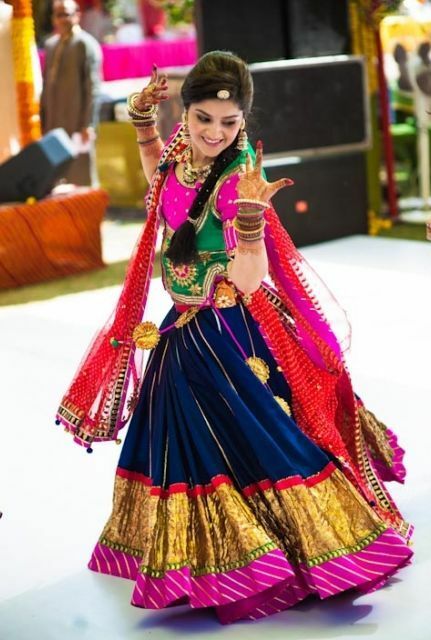 An extremely variant in its styles and forms ghagra cholis are available in various combinations of hues, cuts, and fabrics. 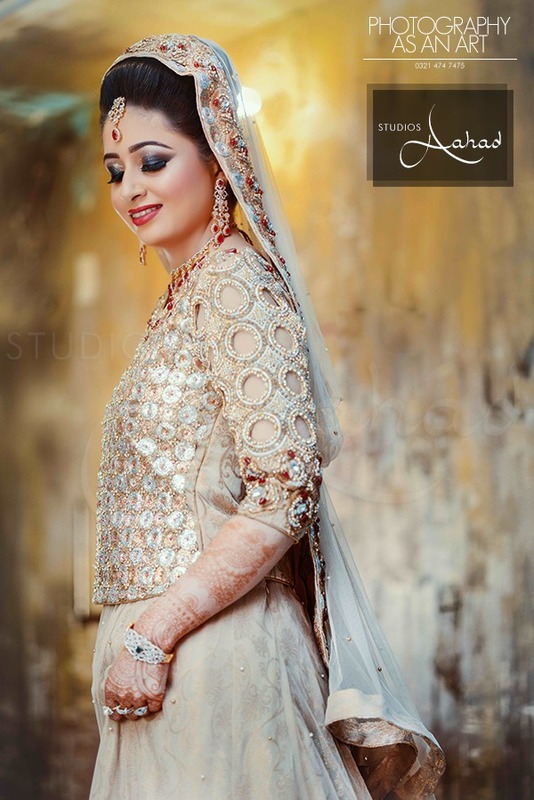 A great blouse complements the beauty of your Ghagra just as the great makeover, therefore the selection of the blouse is equally important and can be tacky to enhance the outlook of your ghagra choli dress. Here is a detailed insight of various forms and styles of its blouses. 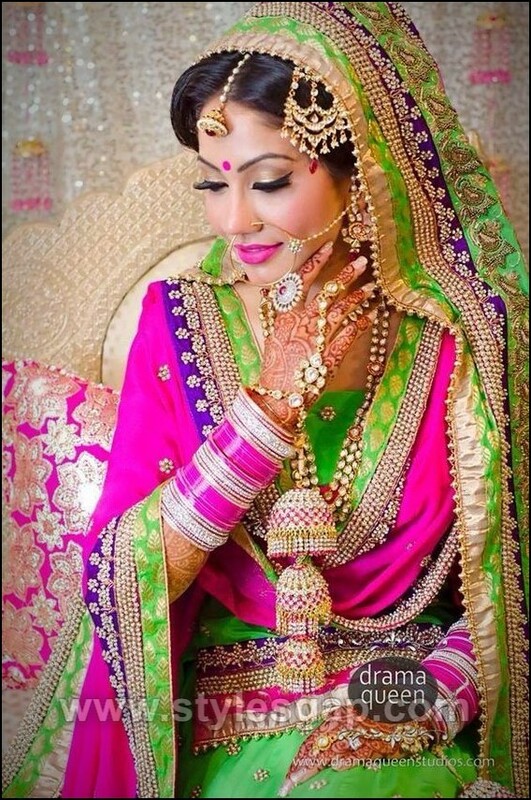 The colour combinations are very beautiful and appealing. 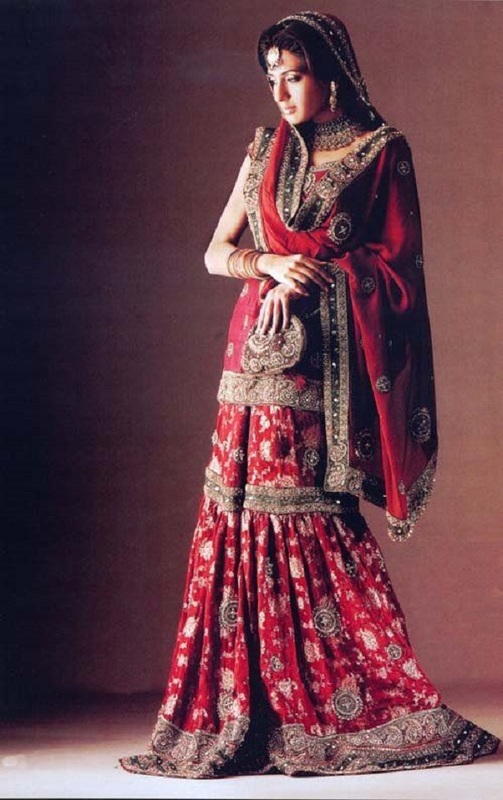 Have a look on the Indian Pakistani Ghagra/ Lehenga Choli Designs Collection. 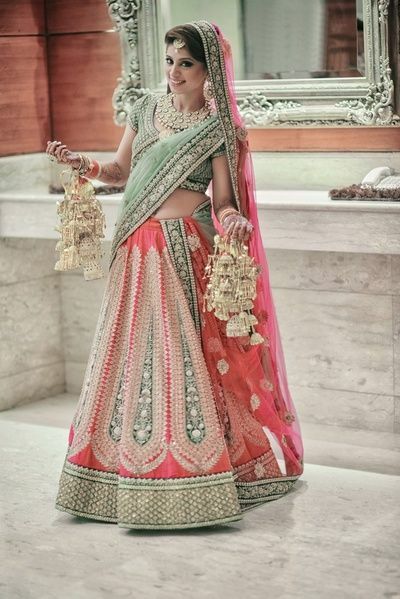 These blouses look fabulous with plain ghagra. 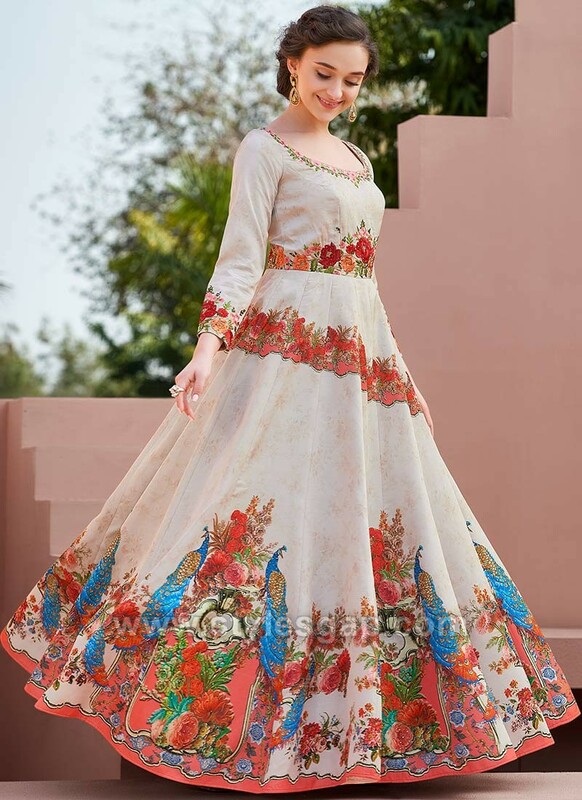 Intricately embroidered either with cutwork or thread work around the neck of the blouse or over the sides of the sleeves gives your dress a peculiar spark. Motifs of floral embroidery spread over the entire fabric of the blouse are also seen in latest series of launched ghagra cholis. If you are opting for the heavily embroidered ghagra, then you need to keep your blouses simple and plain in soft yet decent hues. May have embellished laces around the neck, or the Daman will look even more glaring. As the jackets are invariably in trend these days as can be seen in a collection of several clothing lines, ghagra choli blouses also do carry the jacket style in them, these jackets are kept small with high necks or with Ban collars designed in net fabrics or chiffon. 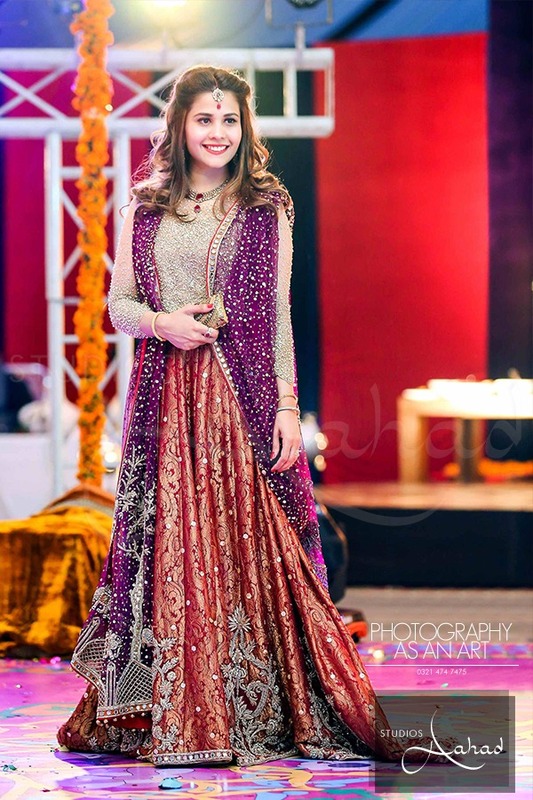 In Pakistan as most of the women don’t like to wear short blouses, therefore, the trend of long blouses with ghagras are more in trend and are quite prevalent in the country. They look completely decent yet fabulous. 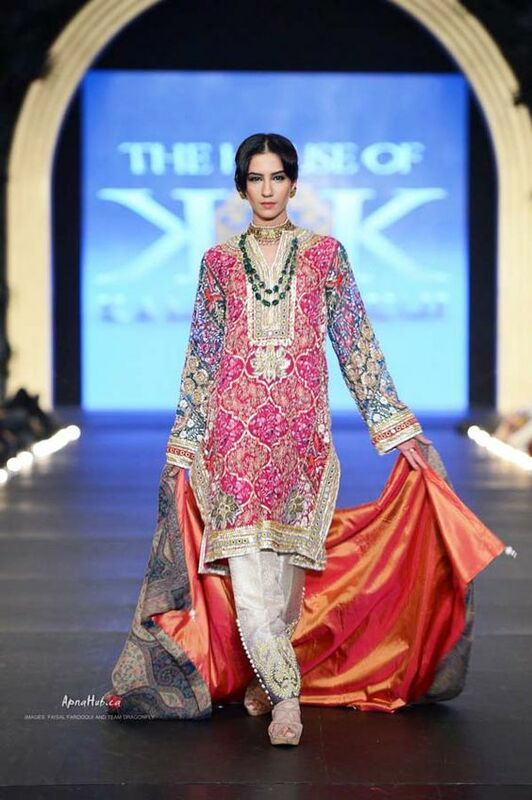 For rather more casual and less formal occasions you can opt for the printed blouses in fantastic contrasting hues. As printed shirts give you the ease of carrying the dress with no substantial embellishment many women of upper ages like to carry them on special occasions. These blouses are one of a kind; they look ravishing and refreshing in all the beautiful funky shades of hues in every style and size. 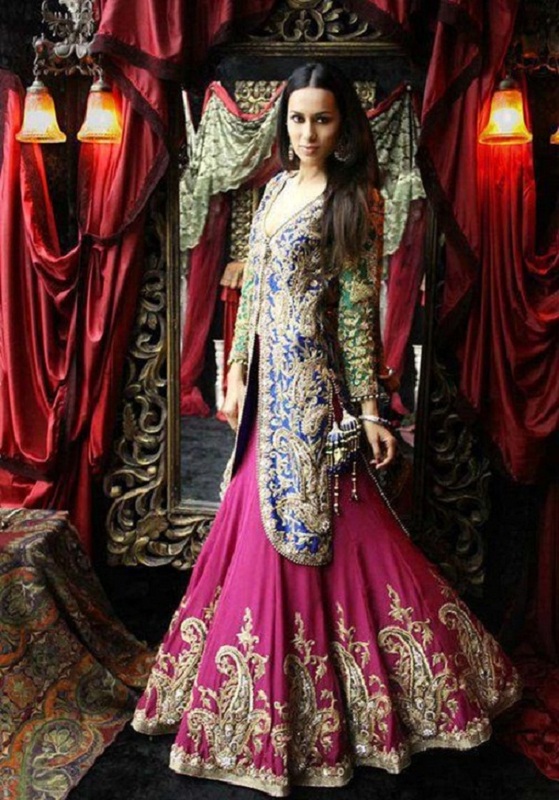 Here we have collected some of the best Ghagra Choli designs by the Pakistani designers and brands. Some of the pieces are custom made. 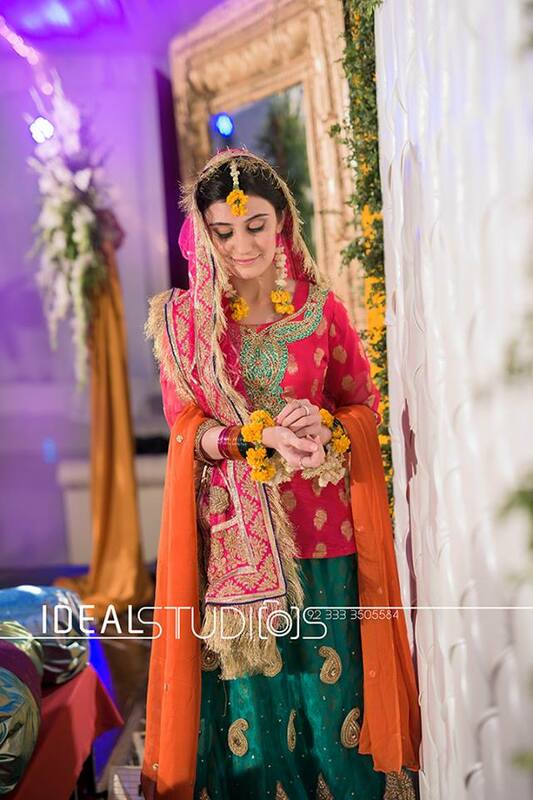 They are perfect to wear at weddings, mehndi functions, barat, walima and other events. 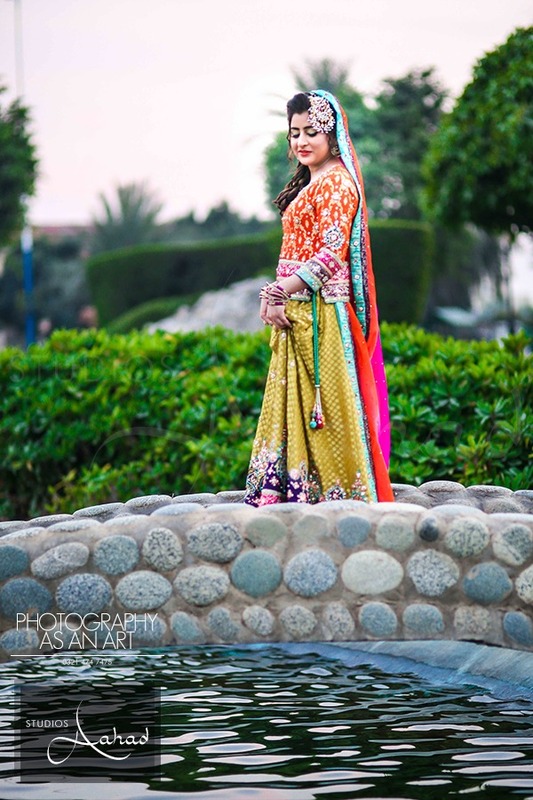 Mostly full blouse ghagras are preferred in Pakistan by the women. Here we have collected some of the best India Ghagra Choli designs from different designers and labels. 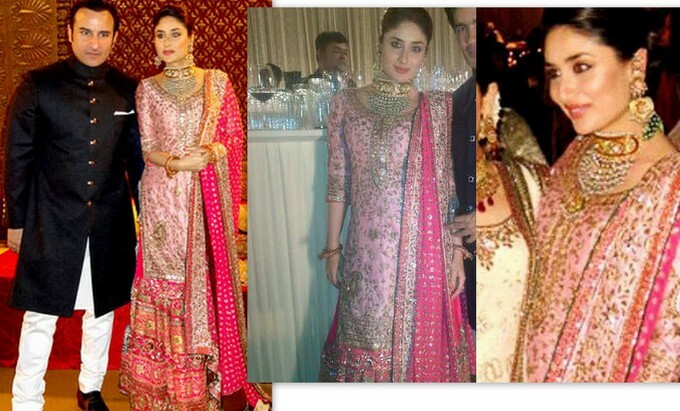 You can wear them at Dewali, Holi, Weddings, Mehndi functions and other rasams. I hope you will fall in love with each piece posted below. Women fashion trends change time to time with additional styles and traits. Many variations are made to improve and to provide the ladies with the best things to catch. Day by day the fashion changes and sometimes get repeated after a regular period. 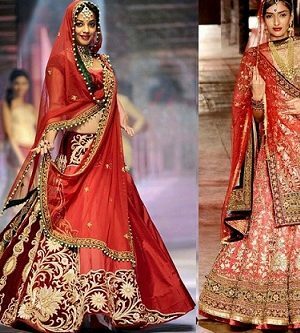 Talking about the Indian fashion, which is most vast and broad not only in Indian but covering the major part of the world. America, United Kingdom, England, Dubai, Franc, Italy and other big countries include a huge population of Indians community, so none of the parts of this world is missing from the Indian Cultures. 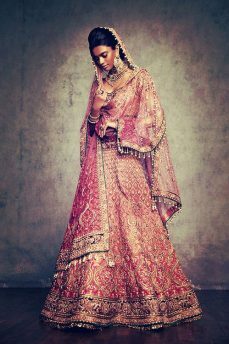 Indian fashion, lifestyles, customs, traditions, values, etc. are always regarded to be attracting for other communities of the world too. 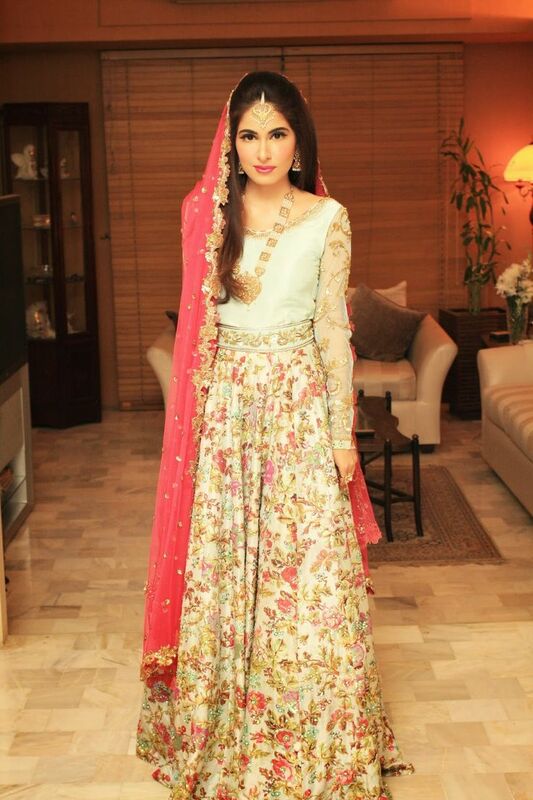 We will discuss today the Beautiful Indian Party Wear Anarkali Dresses Collection. 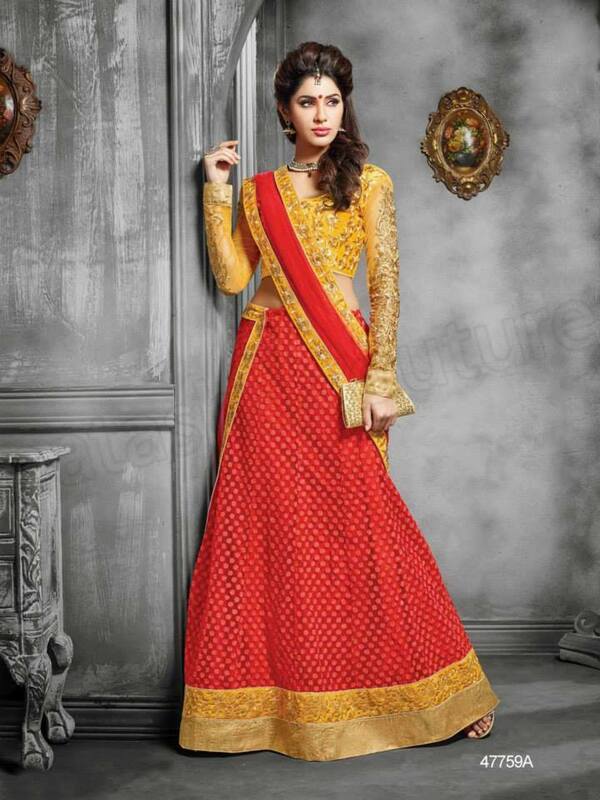 Indian Dresses includes Anarkalis, Kalidar Suits, Shalwar Kameez, Punjabi Patiala Suits, Pishwas frocks, Sarees, etc. 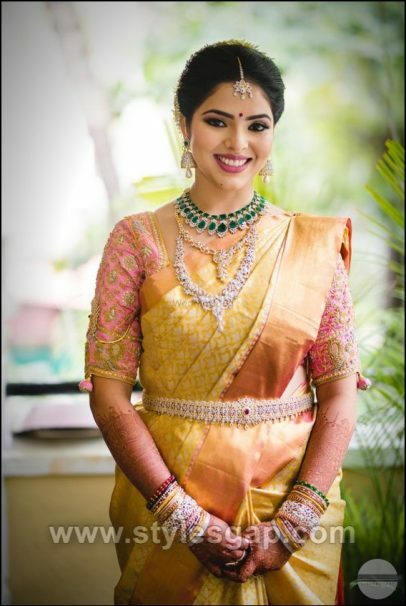 Today we will talk about the formal dressing of Indian ladies going for a party, event, occasion or to attend the wedding ceremony. 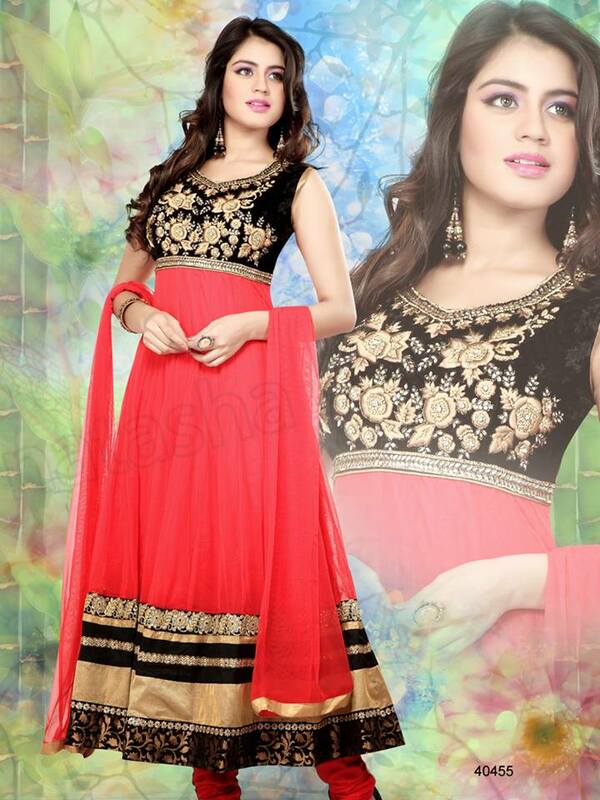 Formally mostly girls choose Special Anarkali Dresses which looks trendy to wear. 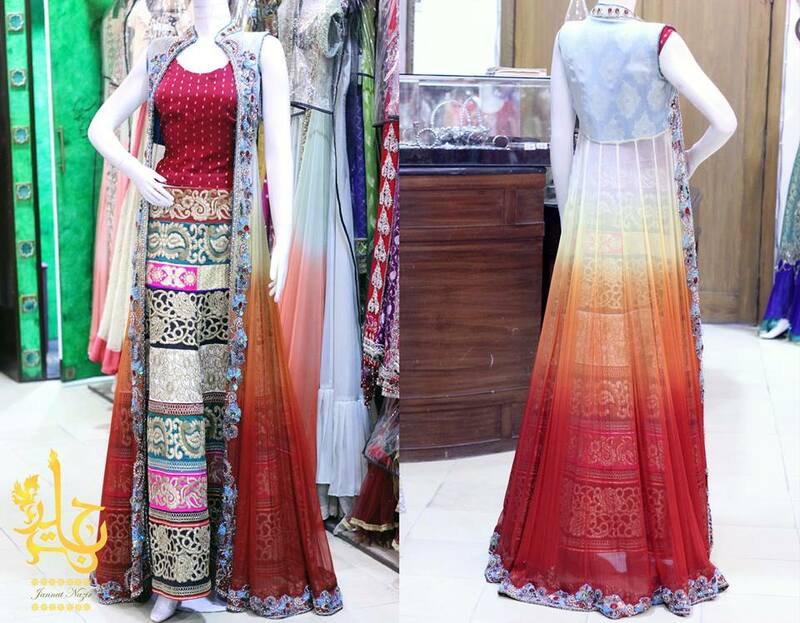 Married women and girls also get choose embroidered saree dresses. 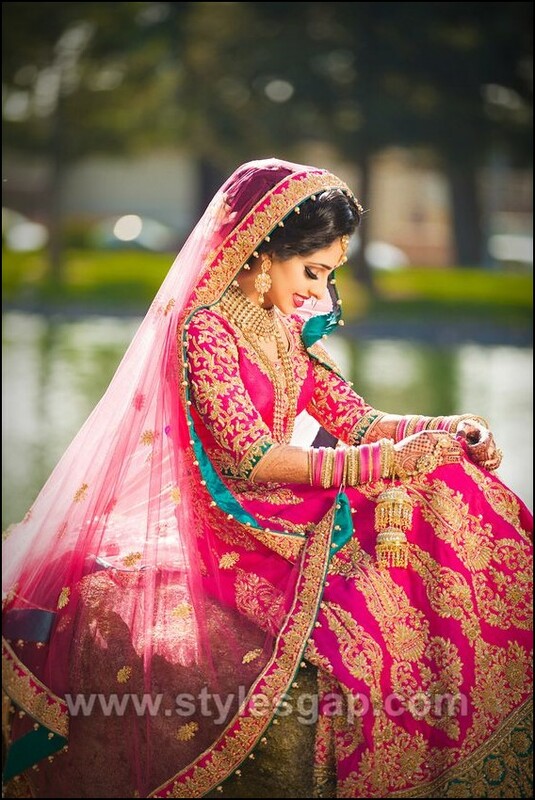 As Saree is the national dress of India, so women prefer to wear it to maintain their traditions and cultures. Fashion designers and brands layout their party wear formal dress collections every year for every occasion and season. 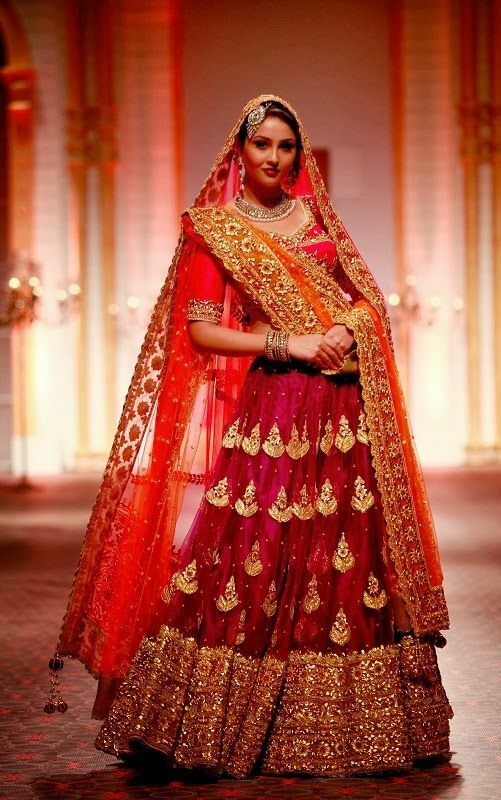 Natasha Couture, Manish Malhotra, Ritu Kumar, Tarun Tahiliani, Rohit Bal and many others design their special assortments of party wear dresses for women. 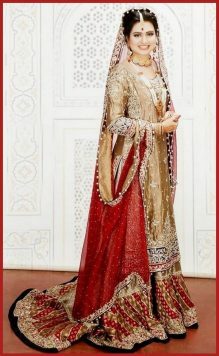 Here we will discuss the formal embroidered Anarkali suits by famous designers. 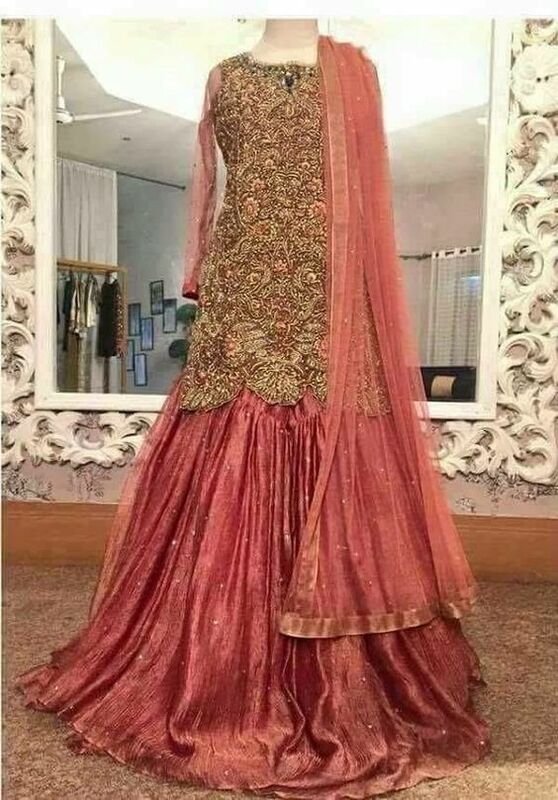 Beautiful Indian Party Wear Anarkali Dresses Collection 2018-2019. 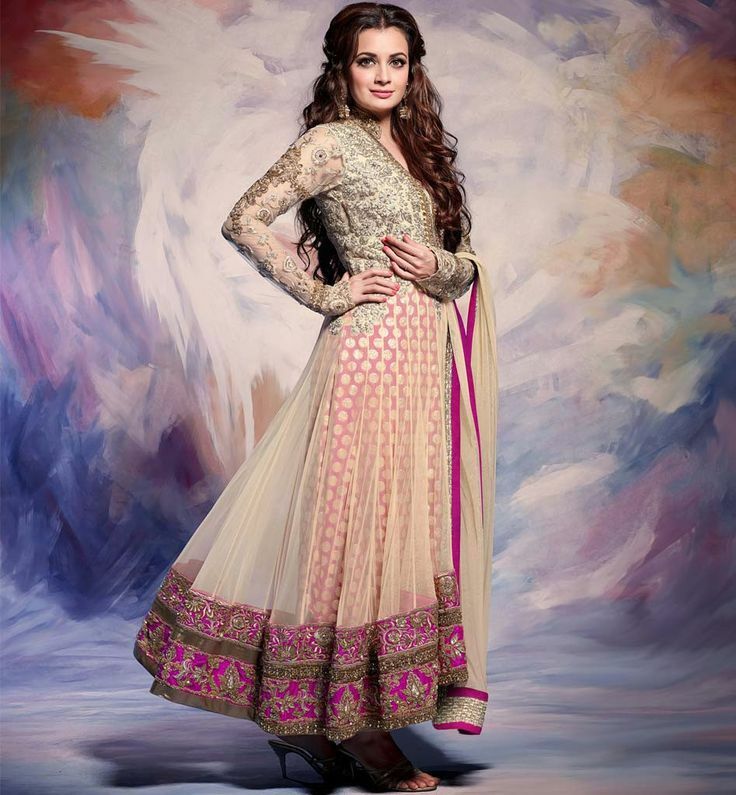 Consists of party wear Anarkali suits in a wide variety. 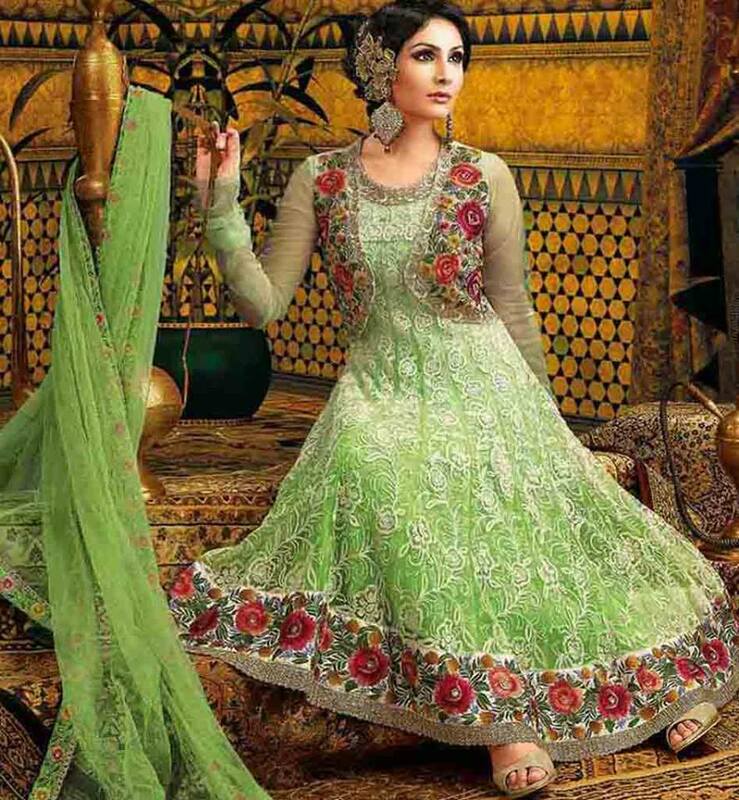 The Anarkali dress is designed in a variety of ways by decorating with laces, motifs, patches and much more. 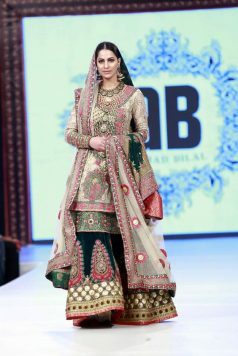 Various types of embroidery works like dabka, zari, motifs, sequence, gotta, tilla are done upon the fabrics to enhance the traditional beauty of attire. 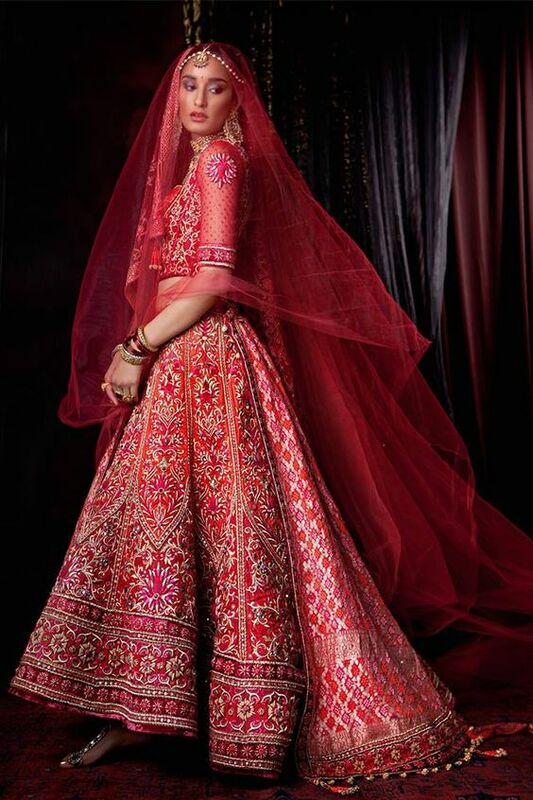 Banarsi Patti fashion is very famous and is done at the front end panels of the frock with the wide bottom patches. 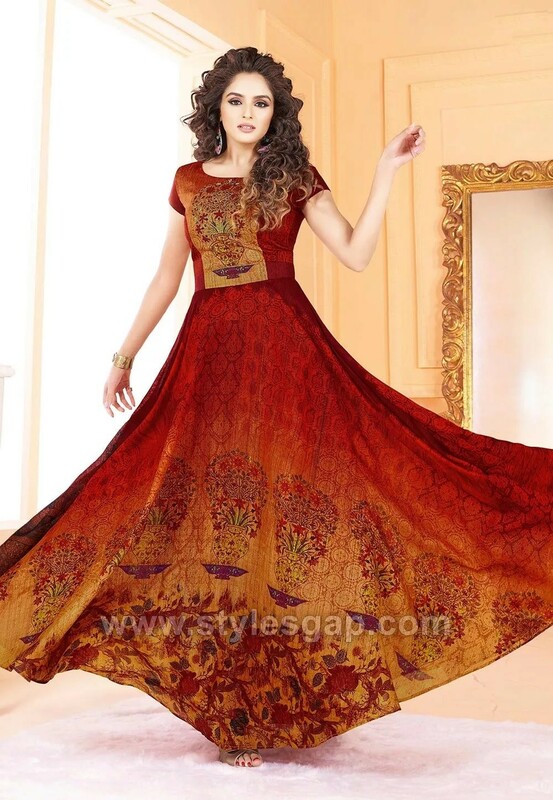 Fabrics like Chiffon, Crinkle, Silk, Jacquard, Net, Georgette are used in making these dresses. 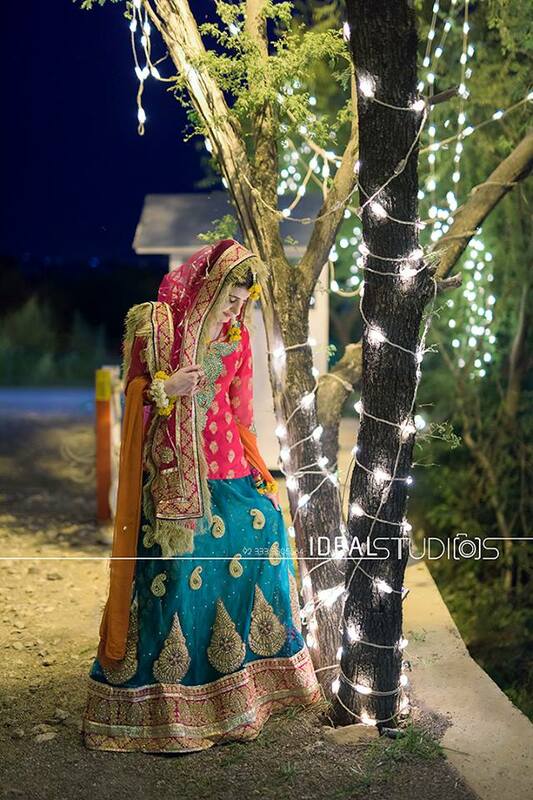 Dupattas are also added with these suits, and they may be adorned type or simple. 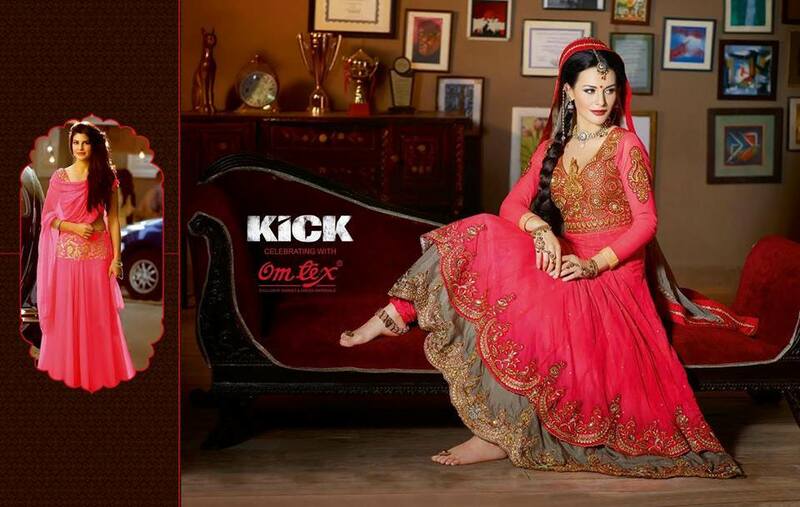 Anarkali dress forms the umbrella type frock that is best to pair with Churidar Pajamas. Impressive Bold colors like navy blue, orange, black, brown, fresh red, dark green, shocking pink contrasted with light ones like off white, yellow, peach, sea green, etc. These outfits are best for your all types of functions, parties, and events. They are perfect to fit in your formal wardrobes. 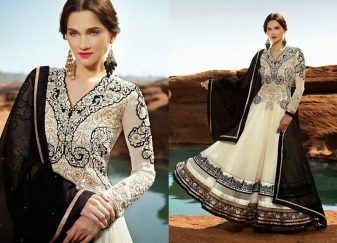 Now it’s the time to stand out from the party by making yourself glamorous with this enchanting series of party wear Anarkali suits. 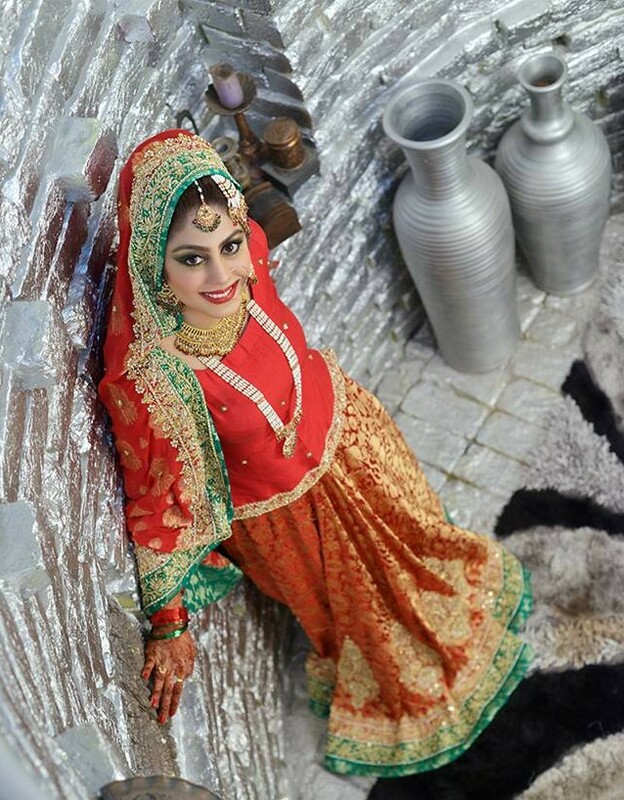 Have a look at the fantastic image/ picture gallery just posted below and get inspired by the latest patterns and designs. 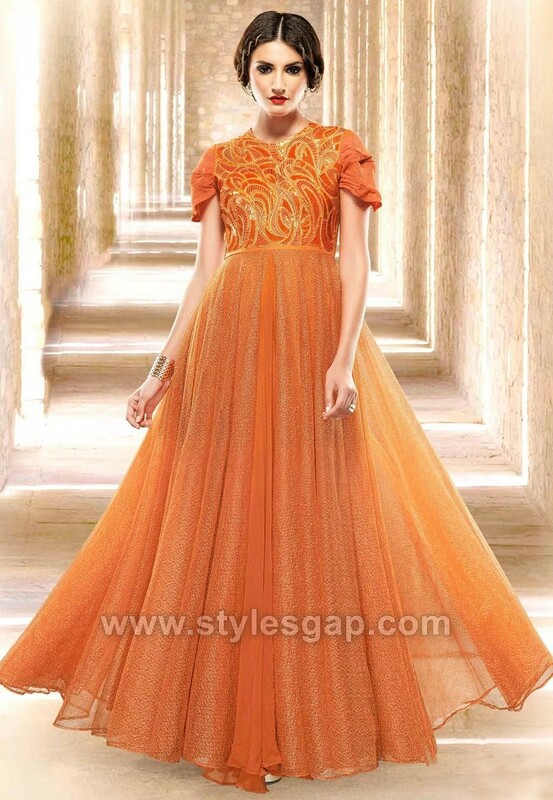 The fresh orange and pink color Anarkali design posted below is the one you can die for. You can further pair it with a lehenga or a churidar pajama. Some people love it to wear it with trousers and palazzo pants. 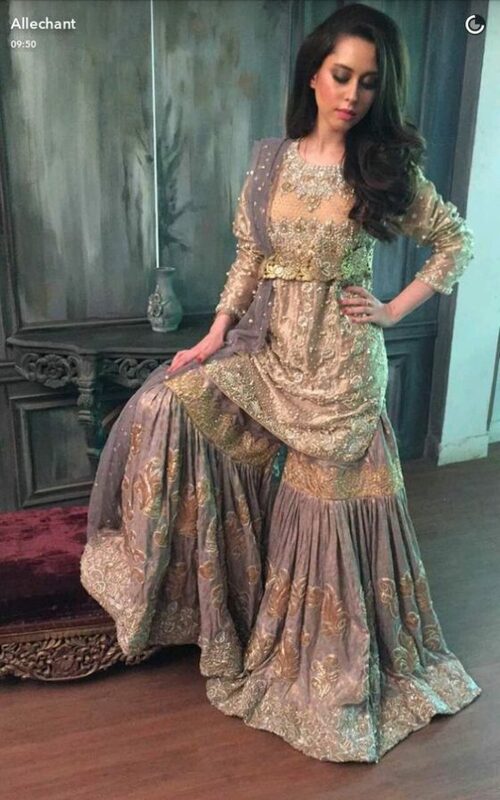 The golden embroidery along with the purple patch makes it look more appealing. 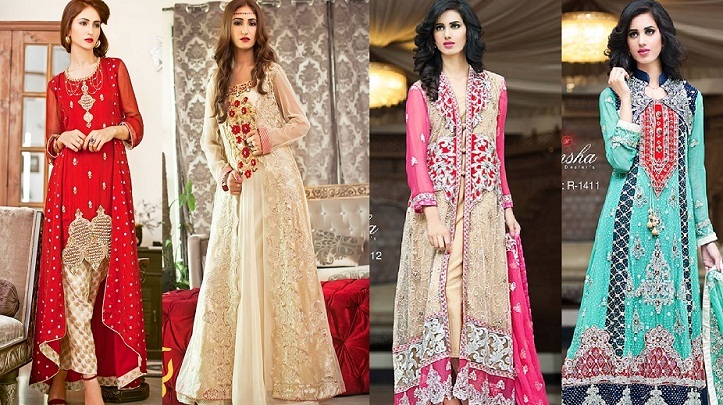 Hope you will fall in love with these stylish attires! 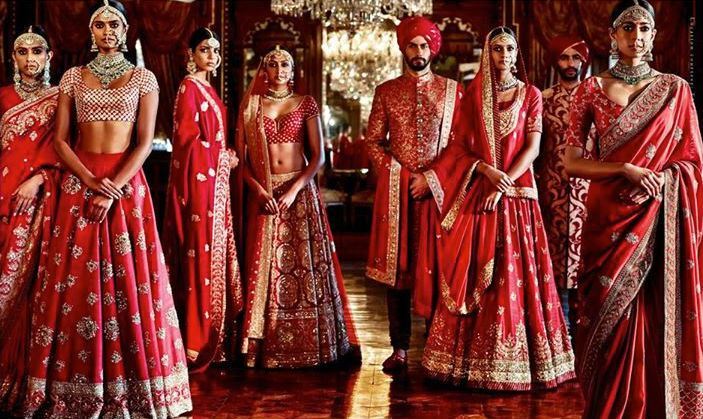 Here we have gathered the amazing collection of Asian anarkalis. They consist of umbrella style, maxi design, kalidar and many more. 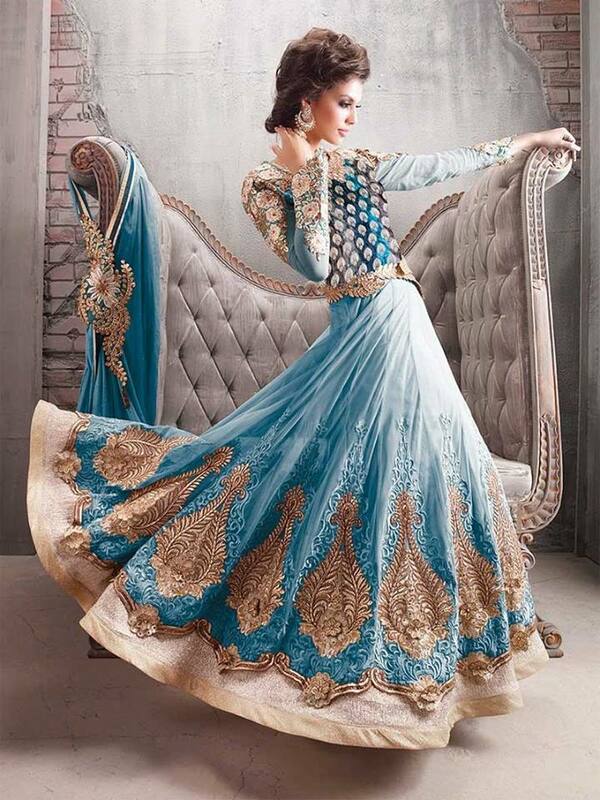 It comes up in fabrics like net, chiffon, organza, jacquard, crape, lace, etc. 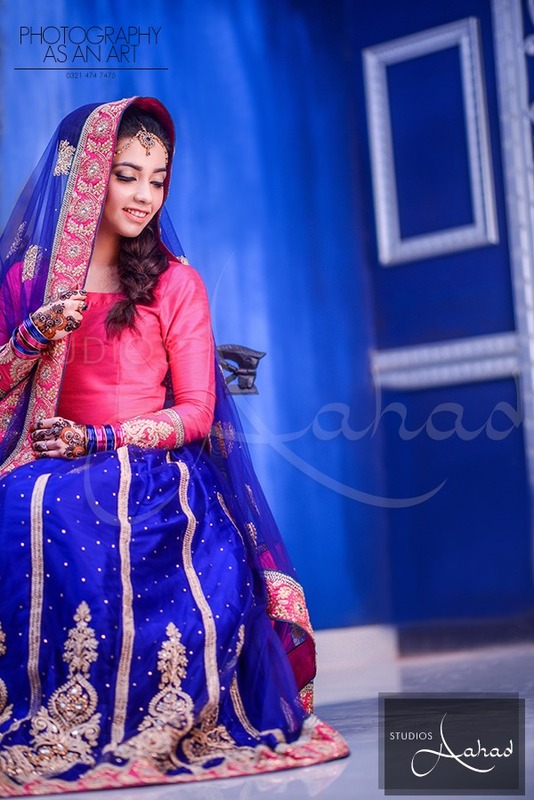 We have posted casual as well as formal wear anarkalis. You can wear them in daily routines as well as in events. I hope you will love each and every design that is posted below. Keep following us for more fashion and beauty tips. As our blog always provides you with the best western and eastern fashion. So that you need not visit markets in this busy life routines and just search for the updated trends among clothing, makeup etc. via online platforms. 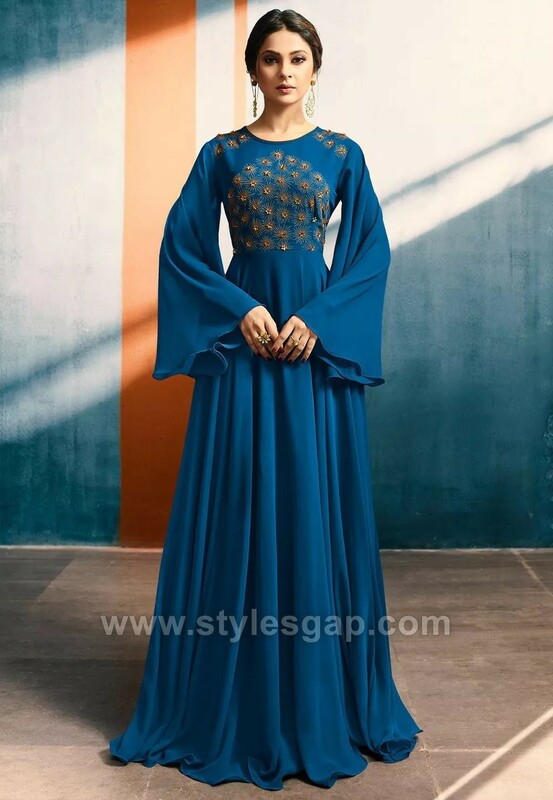 Recently we were discussing Indian fashion and traditions so while continuing the discussion of Asian fashion, here today we have come across with Latest Party Wear Long frocks for Ladies Collection for the year. 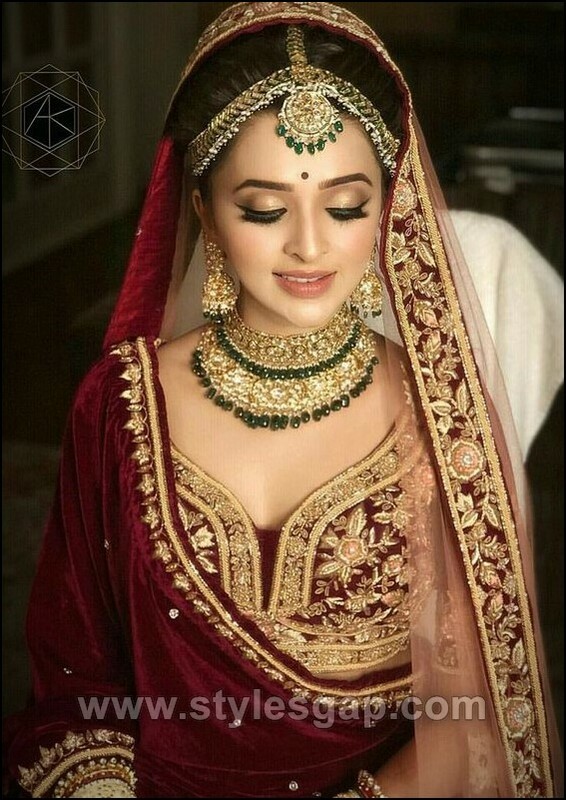 Asian beauty is most celebrated, desired, admired and dreamed of and when these beauties are attired with embellished and fancy traditional outfits. Like sarees, salwar kameez, pishwas, Churidar Pajamas, length chiffon dupattas and most of all the frocks adorned with stones and motifs. 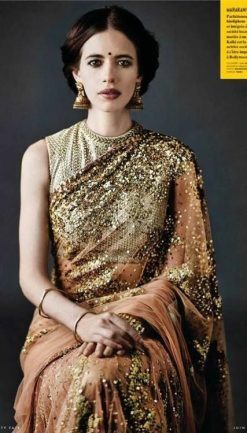 These days, Asian frock sartorial attitude is quite in fashion but not in the way they were designed before instead innovative modifications & vintage experimentations are added in this wear. 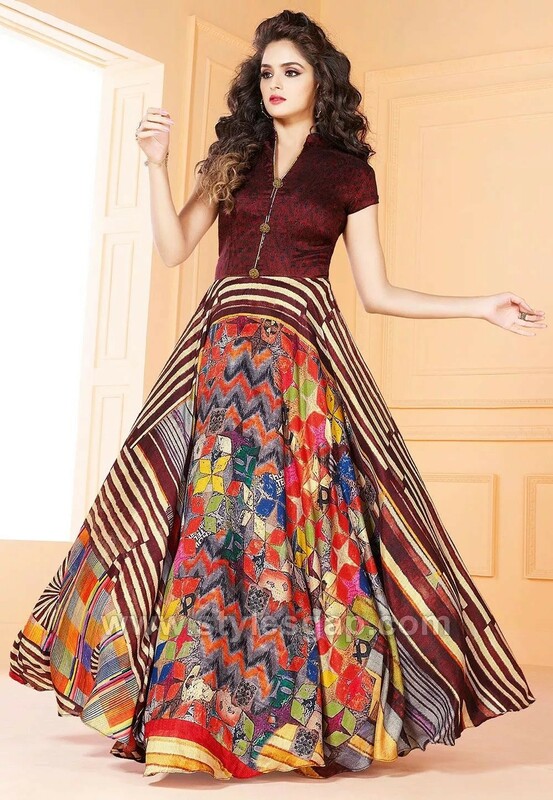 Frocks are available in various varieties either formal or semi-formal, yeah fashion lover girls wear this dress in their daily routines to look pretty and gorgeous. This stunning dress when comes into the category of party wears, it’s beyond words how designers have managed to design stunningly amazing party wear frocks. 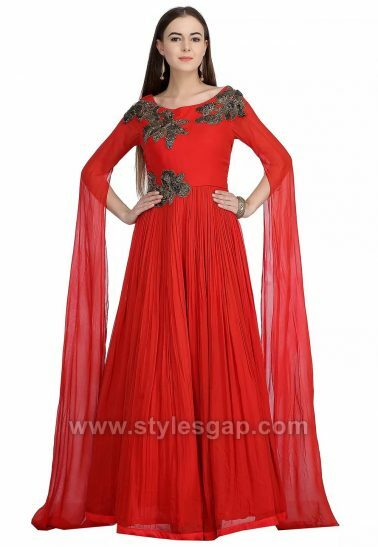 A-line, Anarkali, and other floor-length frocks are so trendy these days. 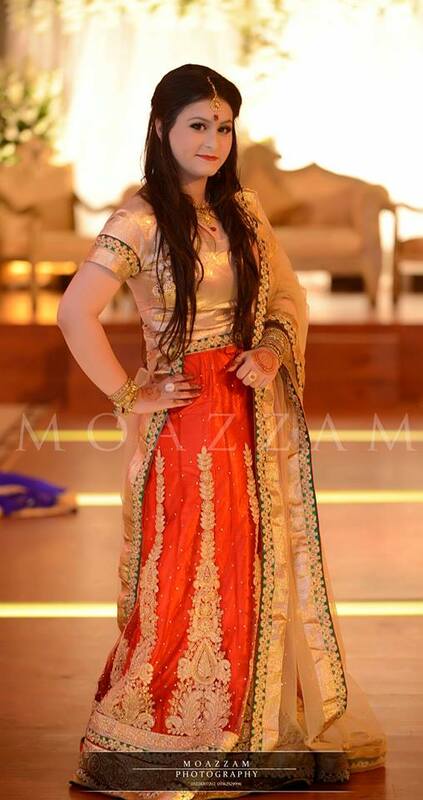 Indian party dresses have been designed in different manners. 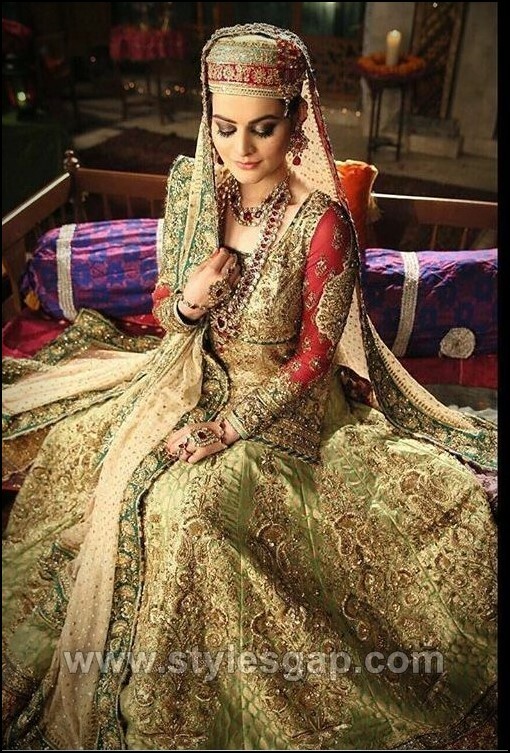 Some are light embroidered; some have heavy embroidered necklines with adornments. Here we have posted the amazing collection of Latest Indian Party Wear Dresses that consists of elegant designs and patterns of Anarkali suits, churidars, salwar kameez, and kalidars. 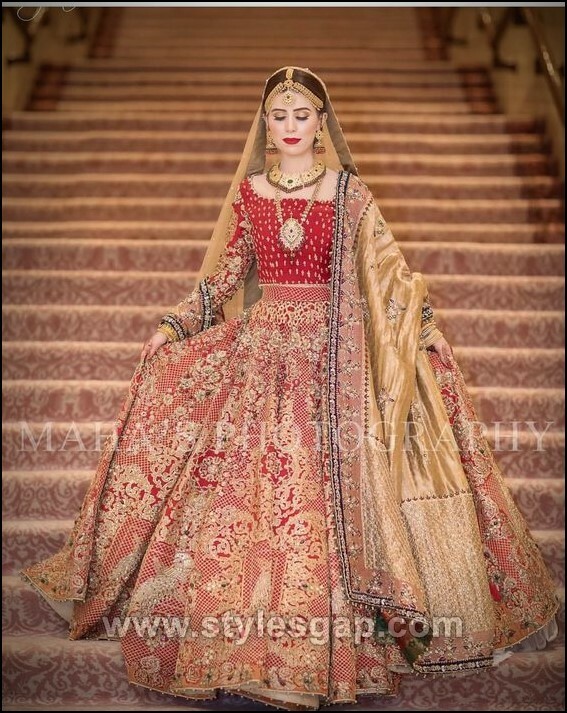 The fabric stuff used mostly is chiffon, net, georgette, jamawar, and tissue because this stuff has a huge capability of looking elegant and fancy. 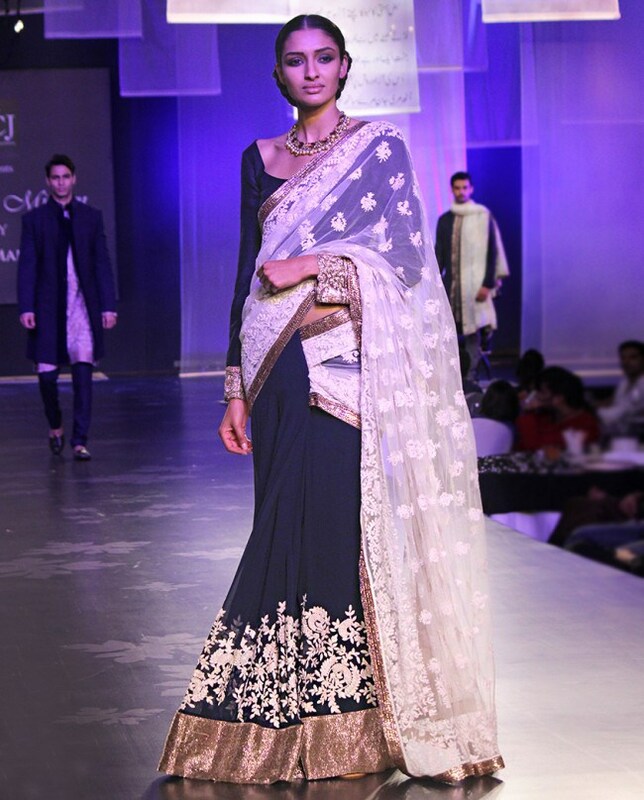 Fancy embellishments are made on the necklines and sleeves border, also on the daman so-called ‘ghaira’ of the frock. 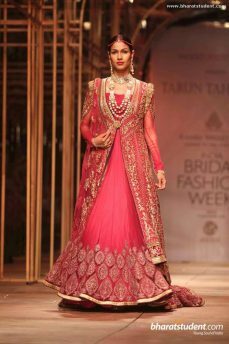 These frocks according to the latest trends are paired with Churidar Pajamas or Capri; straight cigarette pants these days. Look at this pretty black maxi style long frock. 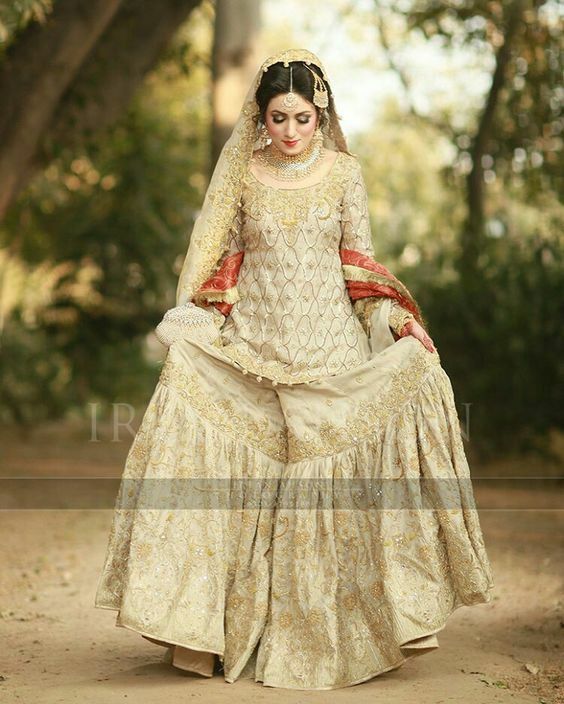 The beige color front is embroidered in black giving the amazing contrast. 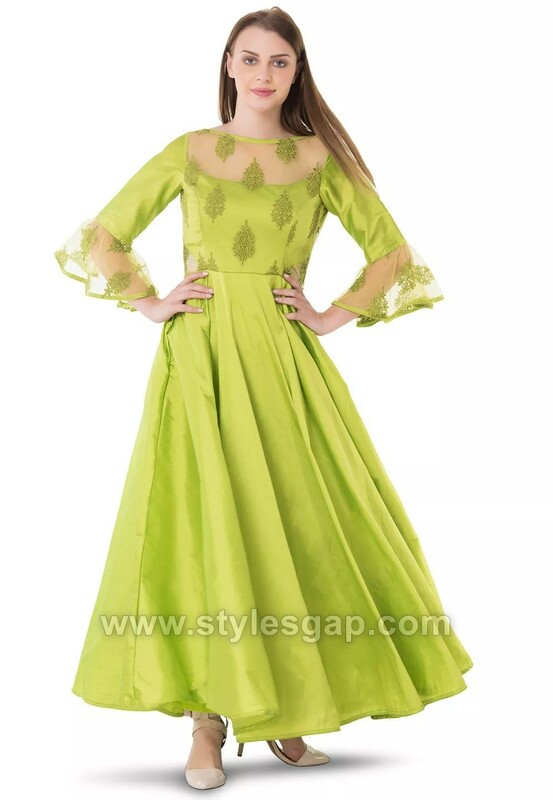 This front open long frock is the best option for parties and wedding functions. 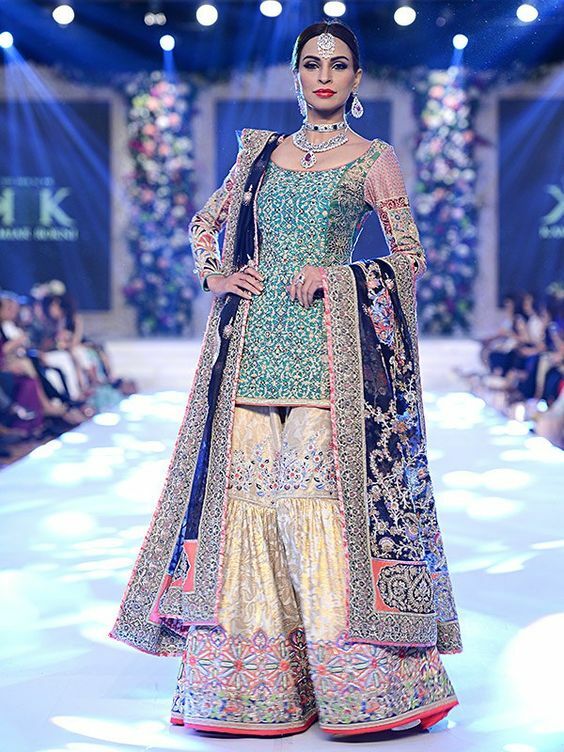 The front is adorned with 3-D flowers, pearls and beads that look so pretty. Loving the lace details and shimmery fabric. 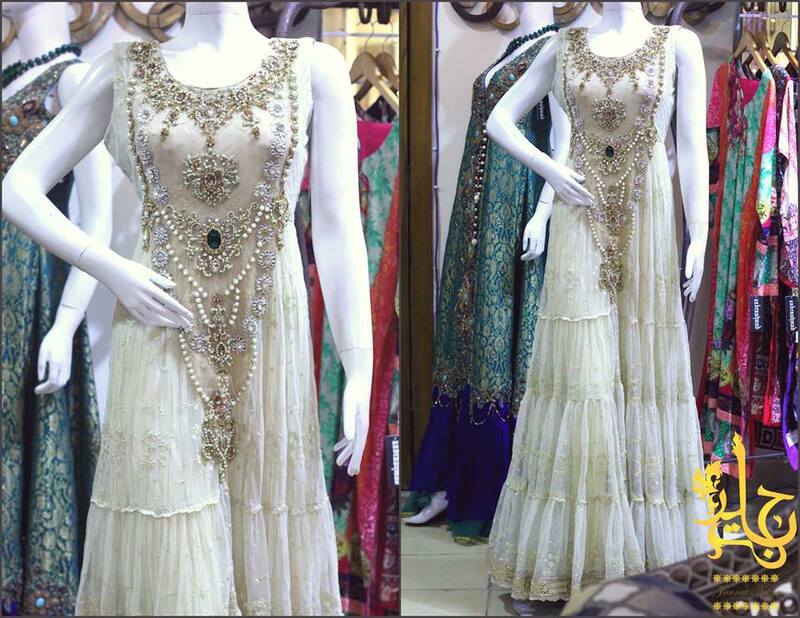 This heavy embellished front open gown style long frock having banarsi inner is good for walima functions or barat. Different type of work is done on the fancy fabric. It is the combination of light purple lilac shade with red. 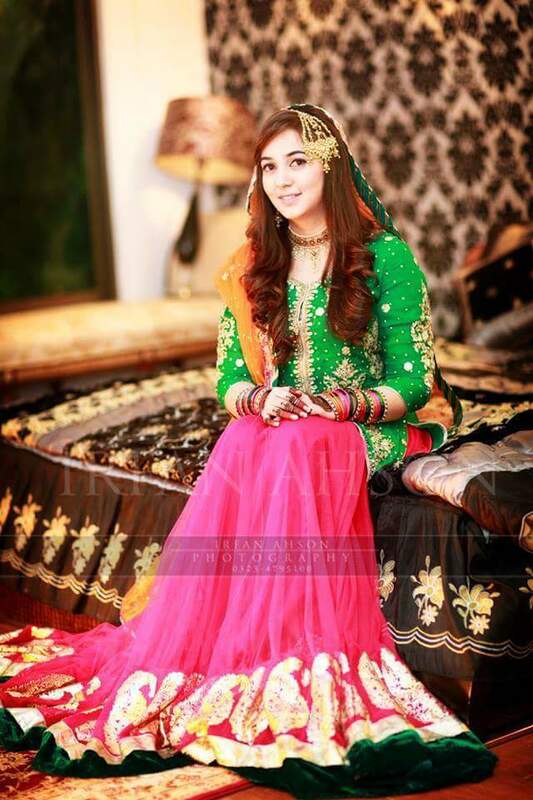 Pakistani Latest Party Wear Long frocks for Ladies Collection comprises of a very fine array of hottest designs. The selection includes double shirt dresses, party wear frocks, gowns, long pishwas and umbrella frocks. The colour combination used is so appealing and eye-catching. Colors such as black, blue, red, orange, pink, green, yellow, peach brown, off-white, etc. are being used. The color scheme has left no limits this time. Approximately every shade is in trend now especially purple, green, black, red, orange, peach, skin, and navy blue, off-white. 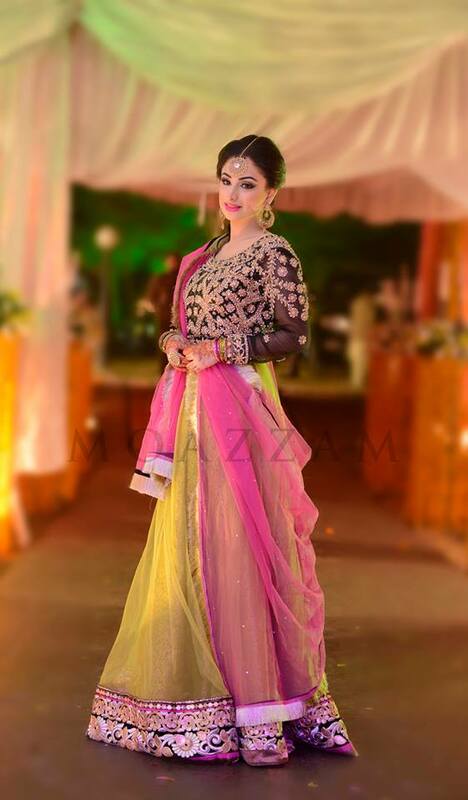 Other than that multi-color thread work is so fashionable these days with a contrast bright chiffon dupatta like shocking pink or red, purple. Double lined net frocks are also so up to date according to the latest fashion. 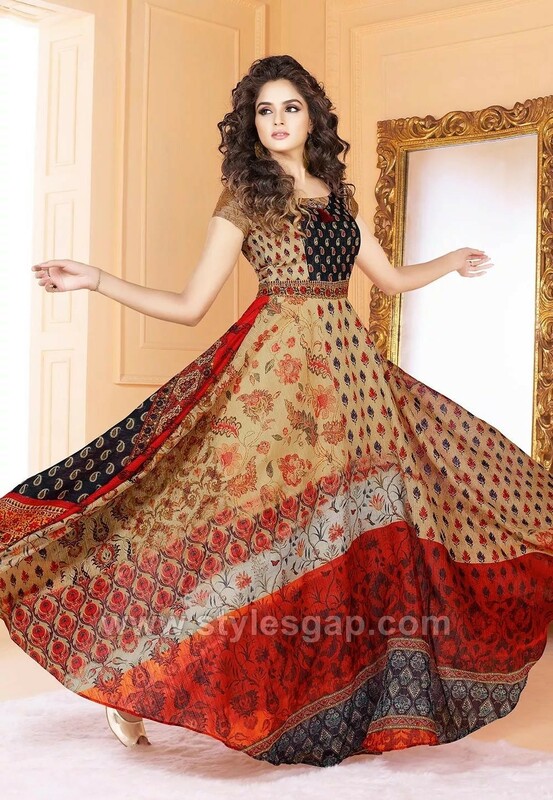 Like printed silk cloth is used as a lining of frock having the huge width just according to that of the dress and net above it all with embroidery o the whole or just on the neckline or border of it. The latest frocks are perfect to wear at parties, weddings, etc. Furthermore, you can get any of it from the outlets nearby or via online shopping portals due to a facility of internet. Hope you will love them all. Ladies! 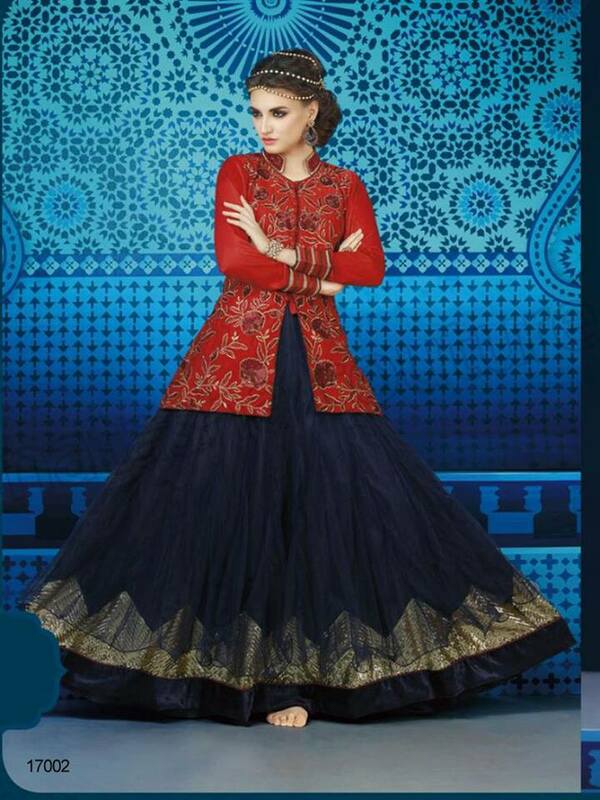 Get ready for the ultimate blast of all traditional apparels for this season. 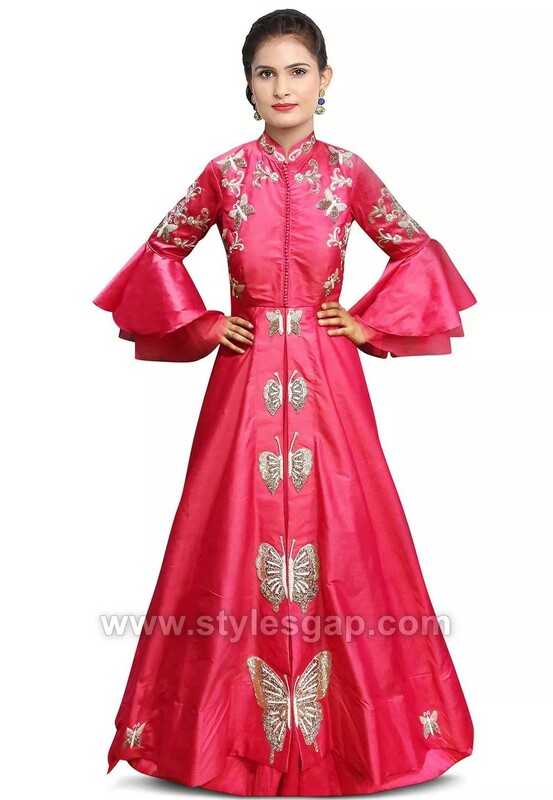 As this article will lead you to the world of Eastern epic styles of umbrella frocks. 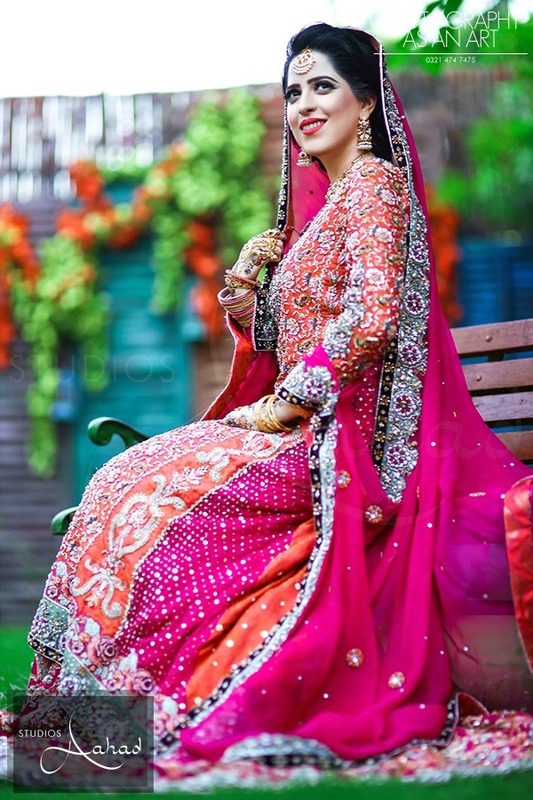 Pakistani and Indian culture with all its beauty seems to be greatly influenced by its traditional norms, values, and customs. 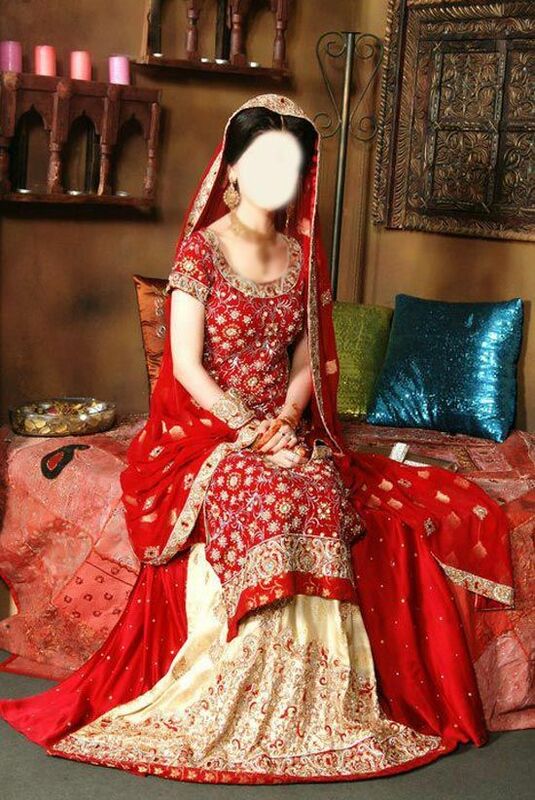 Among the key elements, clothing is another factor that heavily depicts our cultural values. 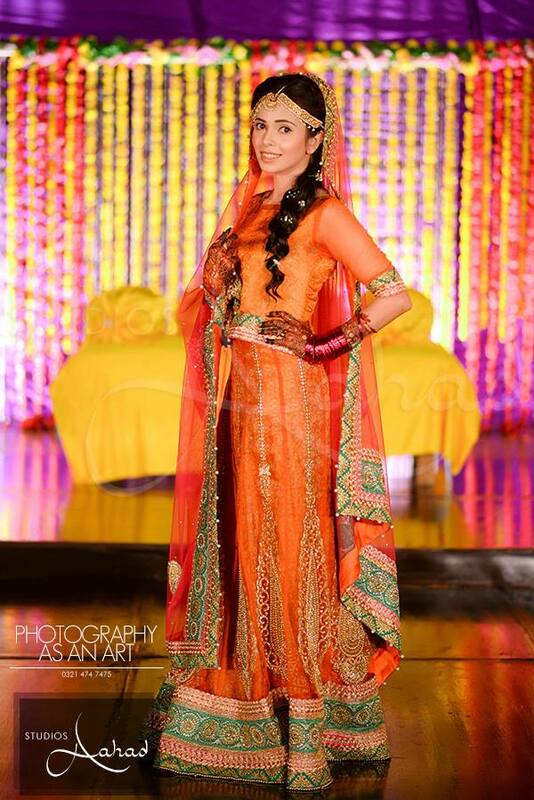 And when it comes to wedding events we all prefer to have that desi look, wearing all those lehngas and frocks. The latest of trends includes Umbrella Frocks for girls of all ages. 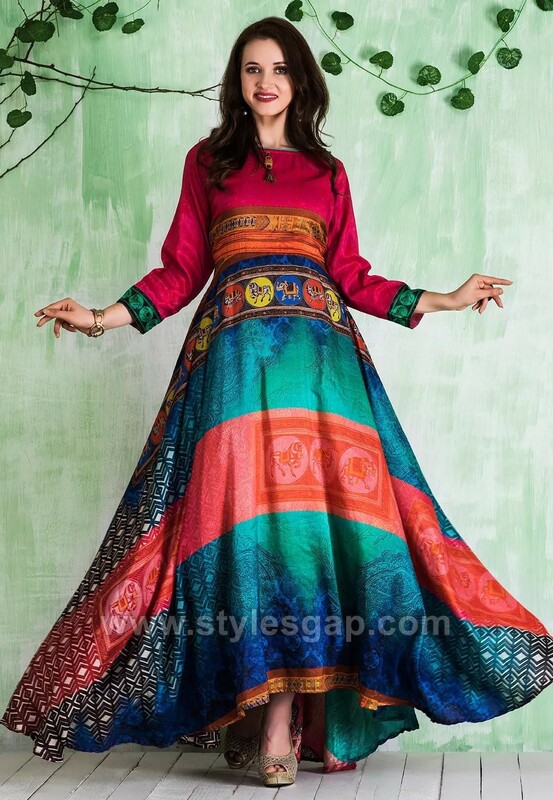 Long frocks with flares in great colors and fancy designs are ever loved by girls. 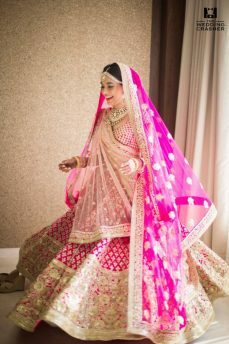 Here we are going to share the latest Umbrella Cut Dress Designs & Frocks Styles 2018-19 Collection. The latest collection of wide umbrellas’ bottom dresses is full of fancy fine work on some variant hues with the variety of styles and designs. The collection varies from casual to formal, from simple to designer wear umbrella frocks. 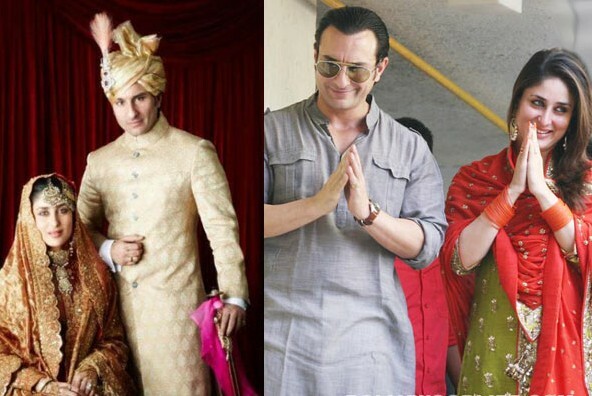 Though they have been in fashion for decades for traditional events they never went out of fashion. 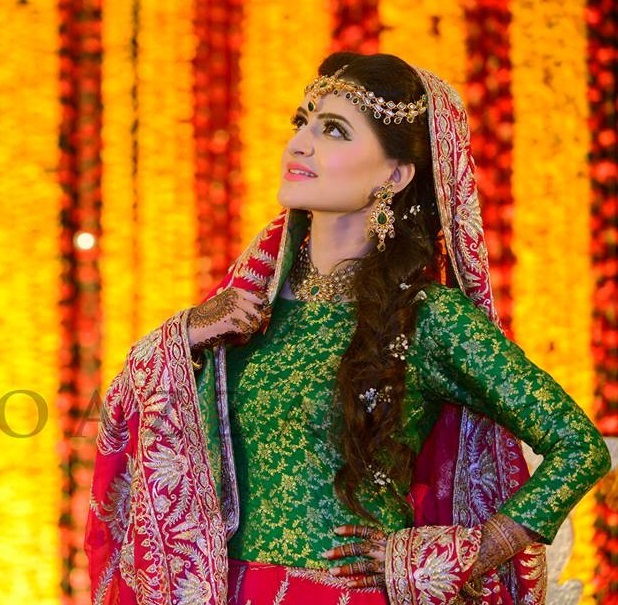 Each year the style evolves into newer, brighter, elegant and amazing styles. 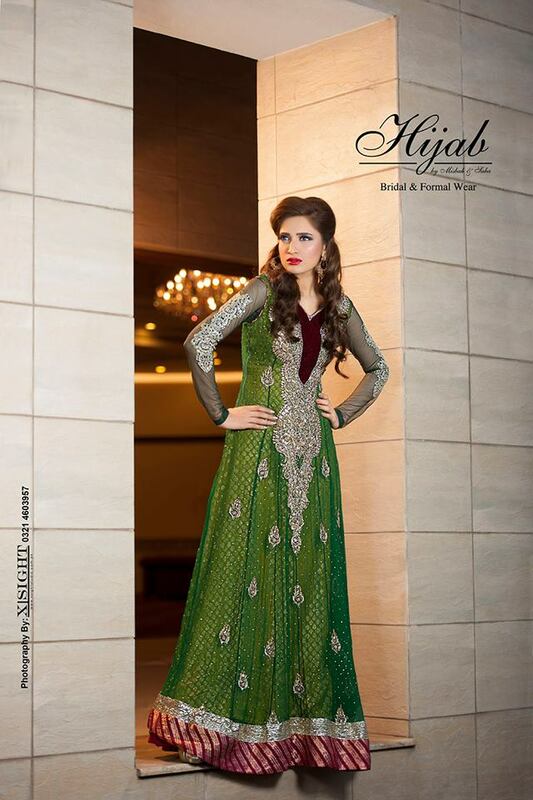 The lovely fall of these dresses looks great when its lower portion is crafted in different colors. The umbrella type frocks vary in style and neck cuts and designs. Some designers prefer to keep it simple with a touch of embroidery work on the neck. 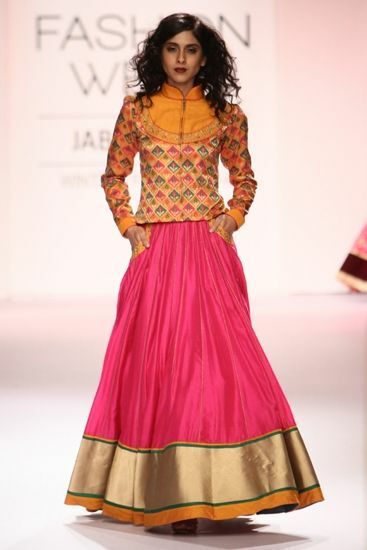 Whereas other designers give a little Anarkali touch to the frock with the side neck design with embroidery on it. 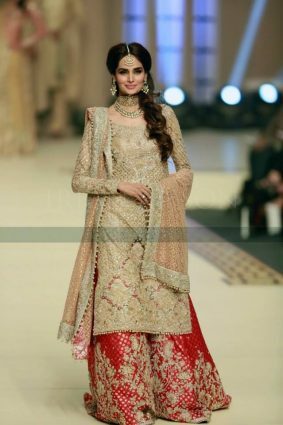 The border of the frock is always given the heavier look, sometimes with embroidery or sometimes with the broad heavy lacework. Keeping the dress prominent and vibrant the contrasts are carefully selected this year. 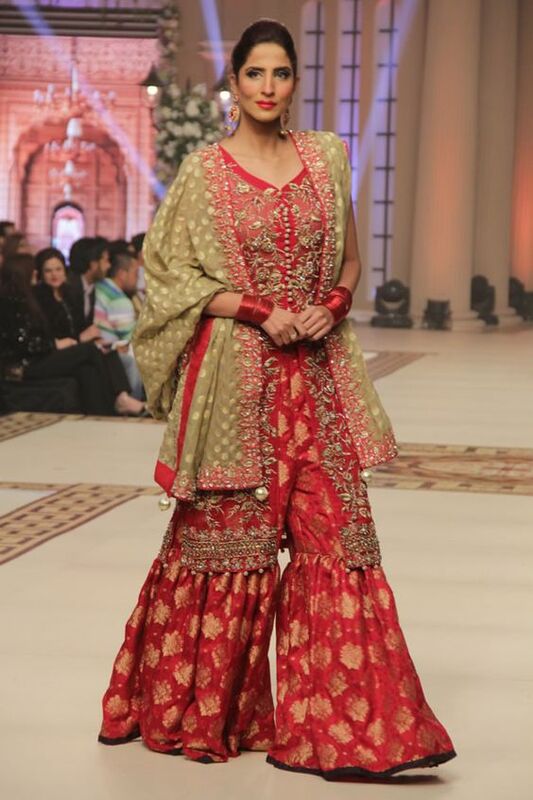 They can be worn with or without the dupatta. 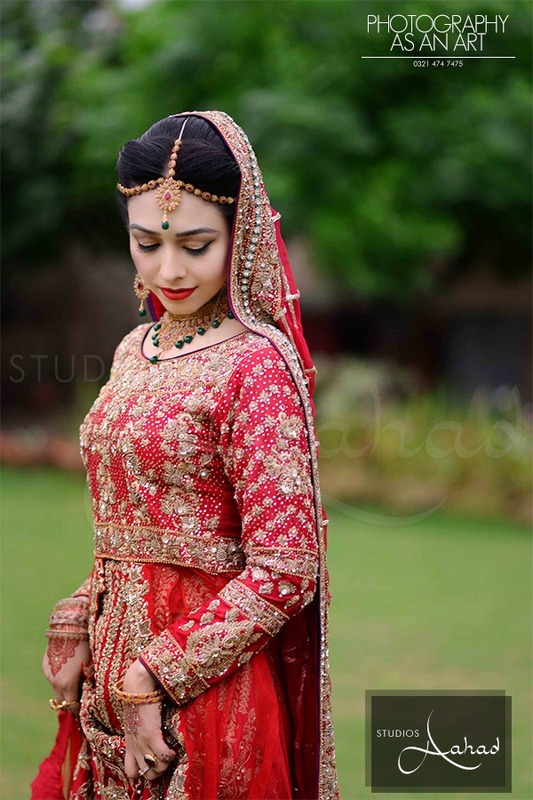 Those frocks that are full of flares or with jackets are mostly carried without any dupatta, whereas for others dupatta completes and compliments the dress. 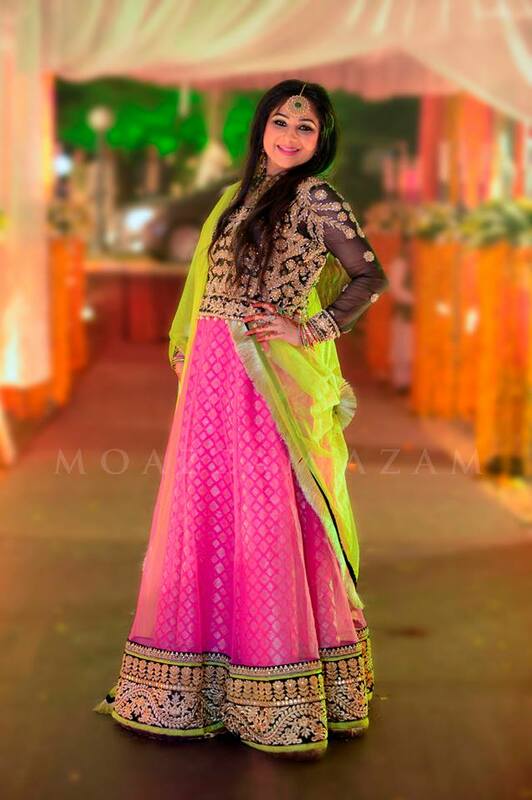 The more formal umbrella style dresses are going to be embellished with the fine work of tilla, dapka, zari, zardozi and many more. 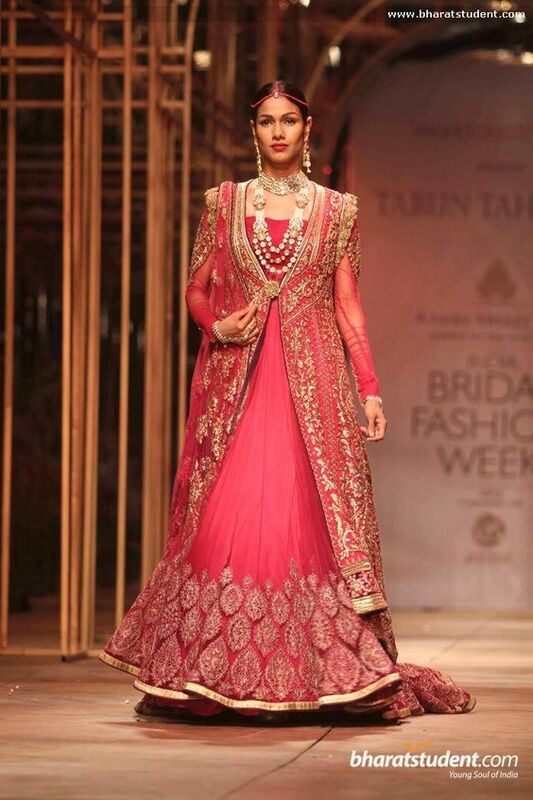 These dresses are also beautifully adorned with thread work. 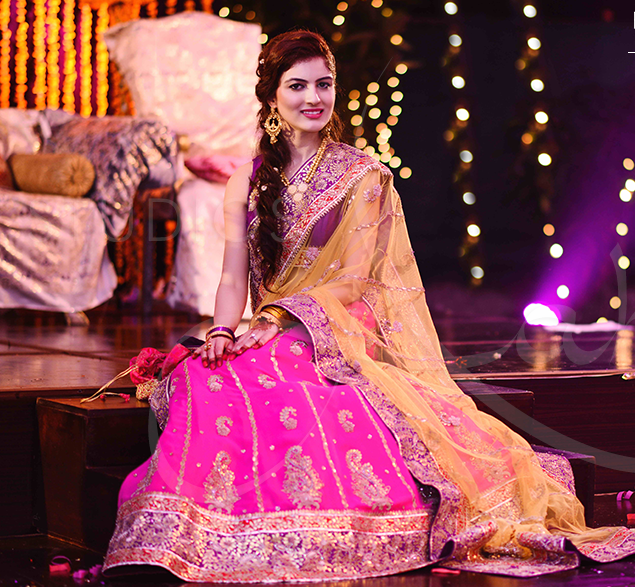 Keeping in mind the volume of the gehra of your umbrella frock, the bottom wears should be selected accordingly. The most commonly worn bottoms are churidar pajamas. They look stunning and elegant. These days’ tights, cigarette pants, and pencils trousers are also in demand with these frocks. But with such bottoms, the length of your frock should be kept low. Last week the trend of short length umbrella cut frocks buzzed in, with the appearance of many of the actresses wearing short length umbrella frocks on television. So now the experts are of the view that the trend might be prevailing in the next year. However, ankle length umbrella frocks will also remain the center of attention. What we need to do is to bring out our variant of the colors and fabrics according to the design that we desire, to have a smart and gorgeous look with traditional appeal. Here we are sharing the two amazing designs. First one georgette purple Anarkali attire with Poly Shantoon Lining is Enhanced with Zari and Sequins Work and is Crafted in U Neck and Full Sleeve. 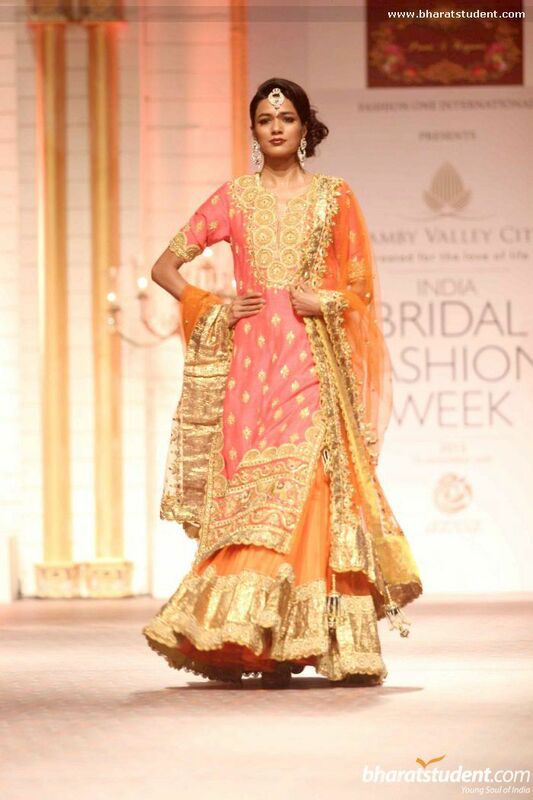 The 2nd one is a peach-colored Anarkali in Faux Georgette with Satin Lining. 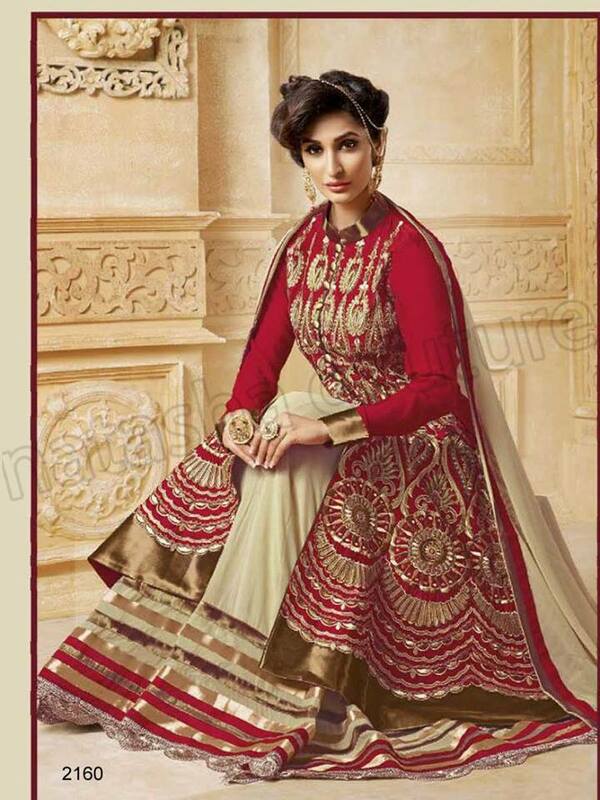 It is Enhanced with Digital Print, Resham, Zari, Stone and Patch Border Work. Crafted in Round Neck and Full Sleeves. We all know that digital prints are very famous these days. They are very light to carry plus they look so chic to wear. different color combinations in prints can be chosen at the same time. Printed umbrella dress fashion is also very noticeable these days. Look at these two trendy designs posted below. 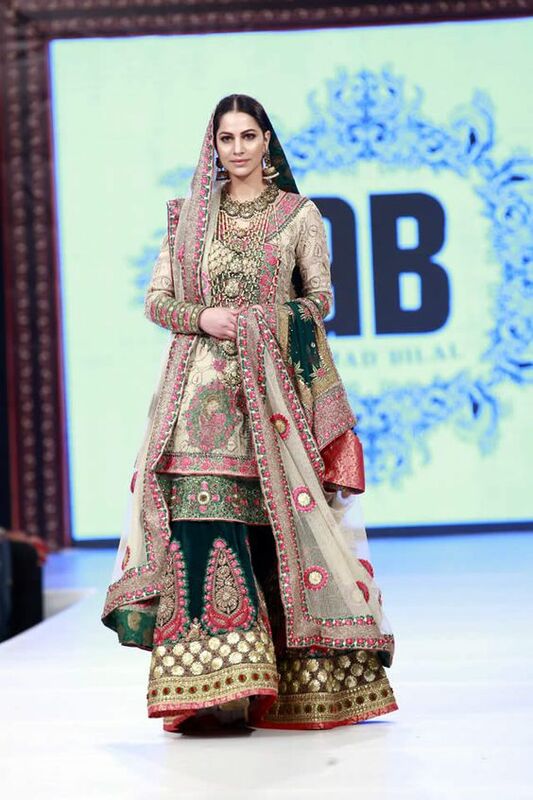 Look at this pretty wide bottom Light Olive Green attire with Poly Shantoon lining, embroidered with Resham, Zari, Stone, Beads and Patch Border Work. 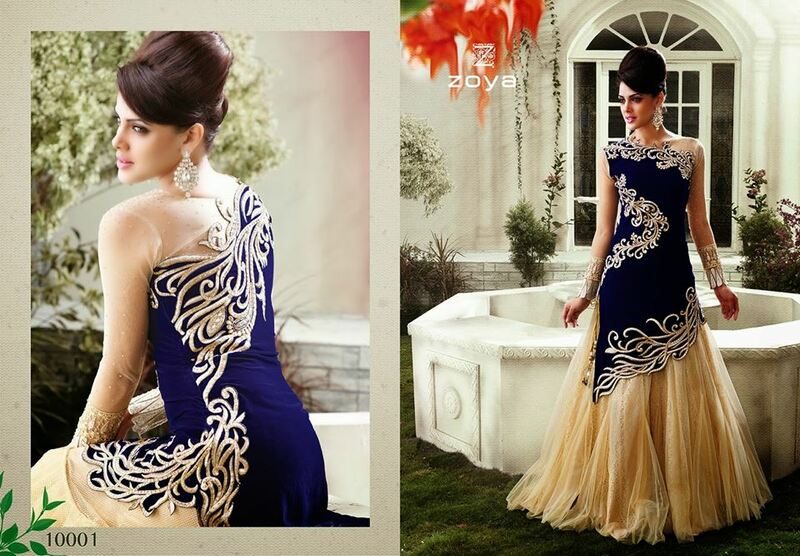 The 2nd one is royal blue pleated umbrella frock with embroidered lace details at chest. We are loving both of them. 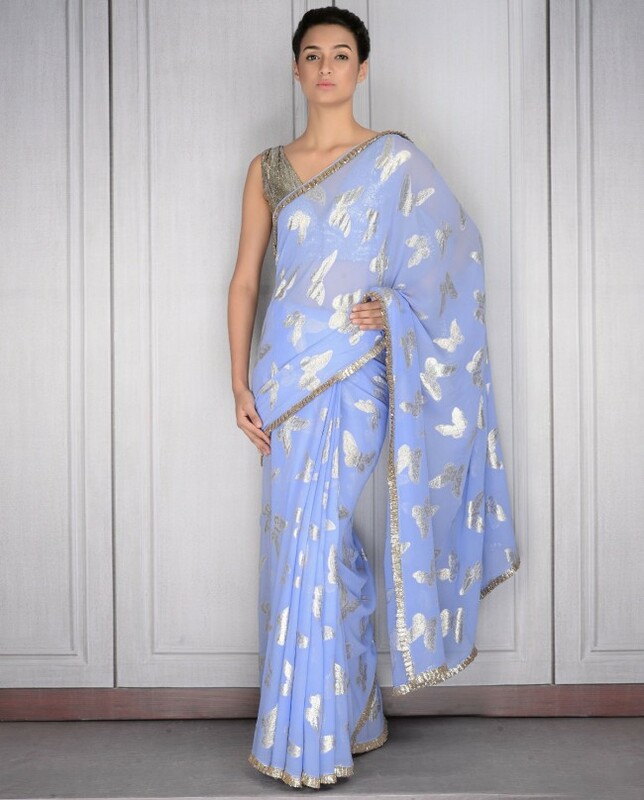 Silk is one of the most luxurious and famous fabric. 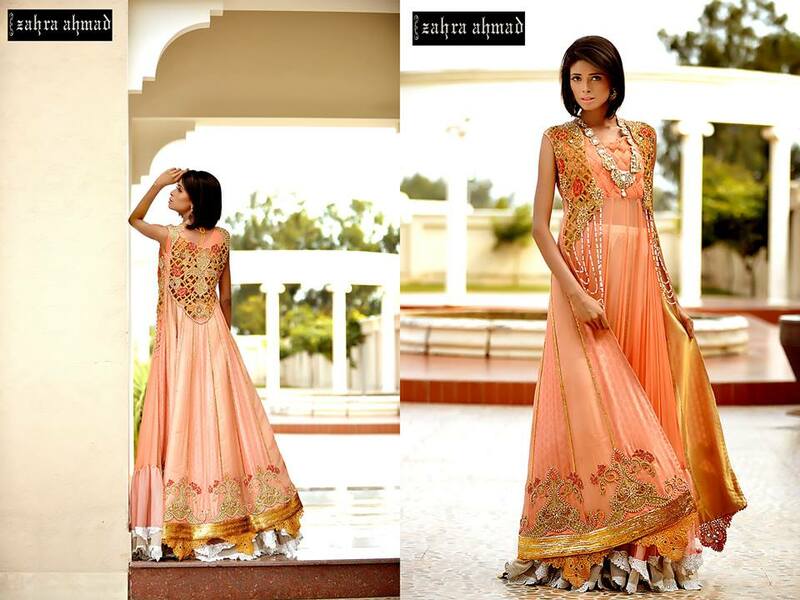 Many designers and brands their exclusive silk dresses collections. Printed and embroidered silk frocks are very loved by the women. You can easily carry them on your formal and party events. 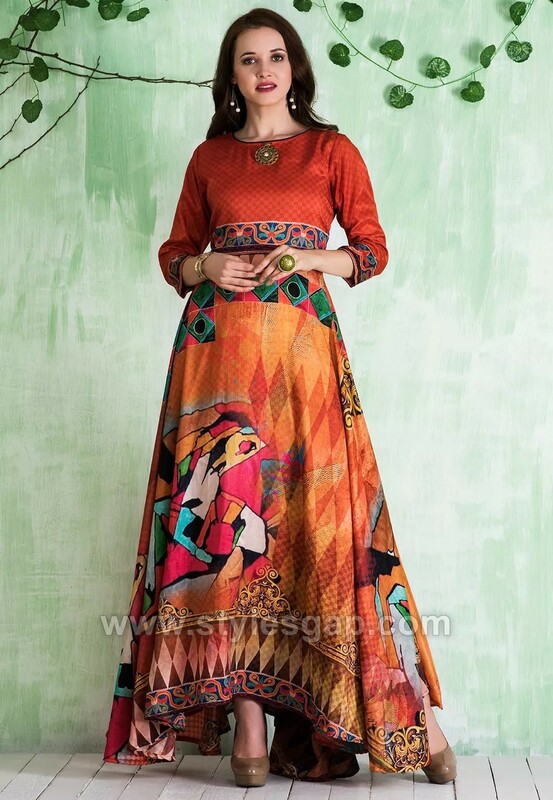 Digital printed wide bottom silk dresses look so stylish and trendy at the same time. Nothing in the world is better than a simple plain attire. Look at these two stunning designs first one is a black attire with boat neckline and pleats. 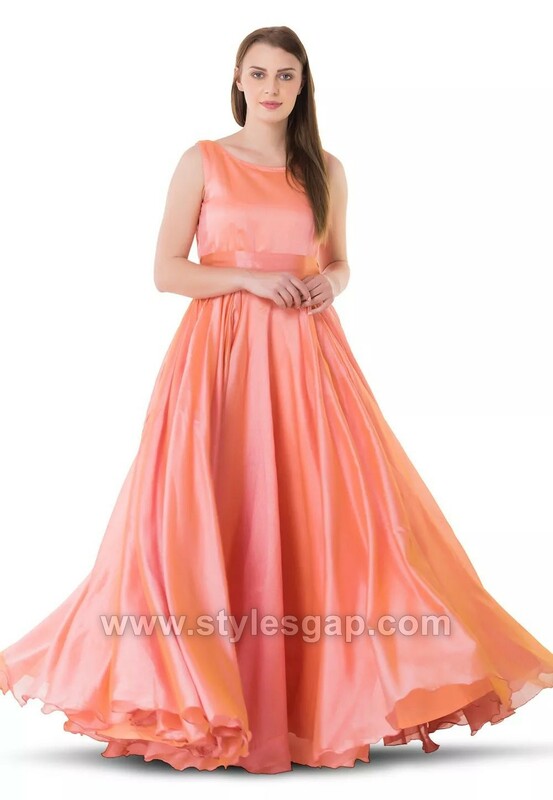 The other one is a sleeveless peach color floor-length frock with wide bottom flare. The wide bell shape sleeves so fancier. They give the outfit a decent look. We have posted two designs with this type of sleeves. I hope you will love viewing and creating them. Long floor length net frocks are always in fashion. Plus if they have wide bottom then they seem prettier. 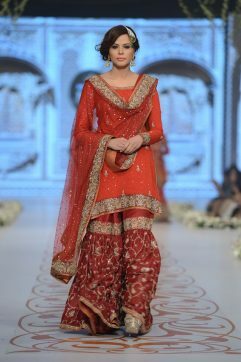 The front is kept embroidered or light embellished and the lower part will be a simple net fabric. You can also add a patch towards the ghera. Capes are now in high demand. They add a special grace to a boring outfit. 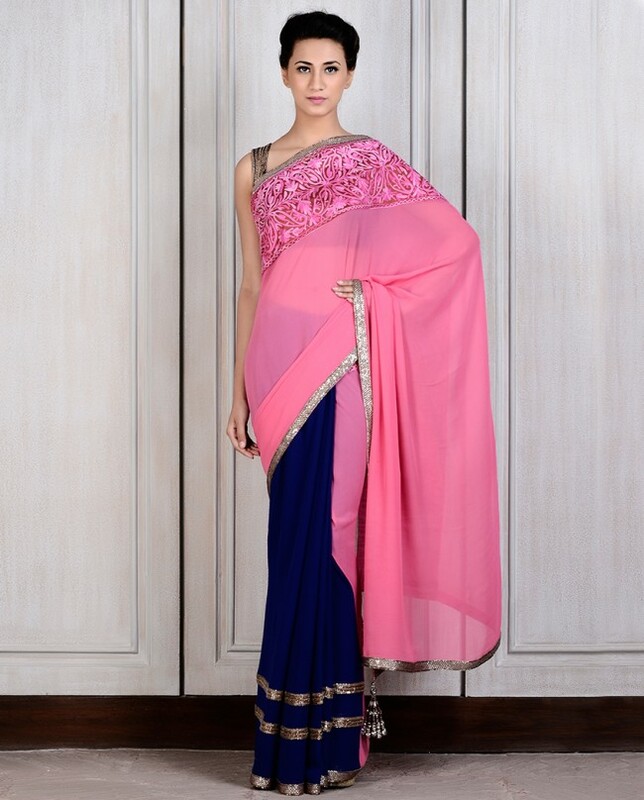 This embroidered fuchsia art silk cape dress is perfect for your night functions and evening wear. 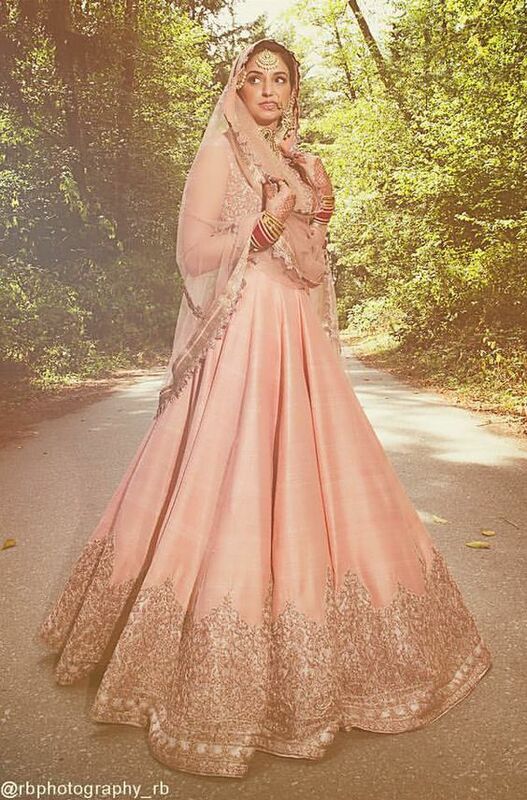 The baby pink cape style dress is enhanced with zari, sequins and bullion work and is carved in boat neck. For casual wear, you can go for these two styles. 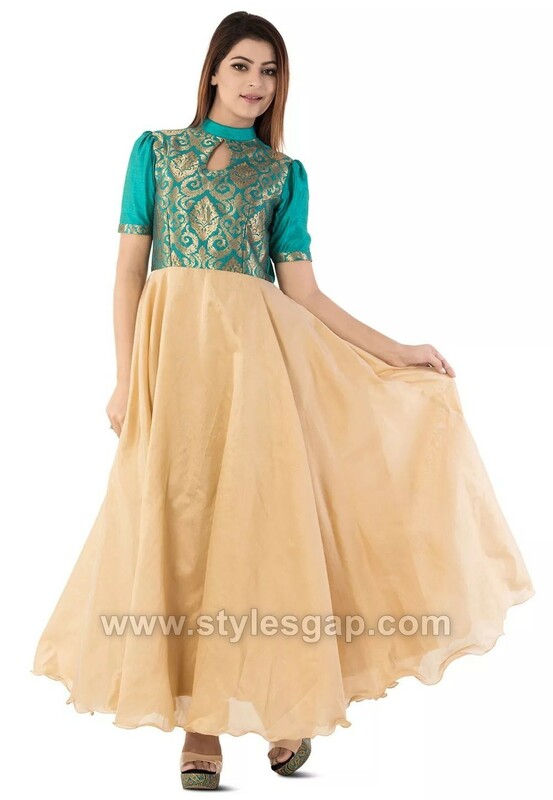 Sea green and beige dress with banarsi chest and plain flare is perfect for casual day outs. 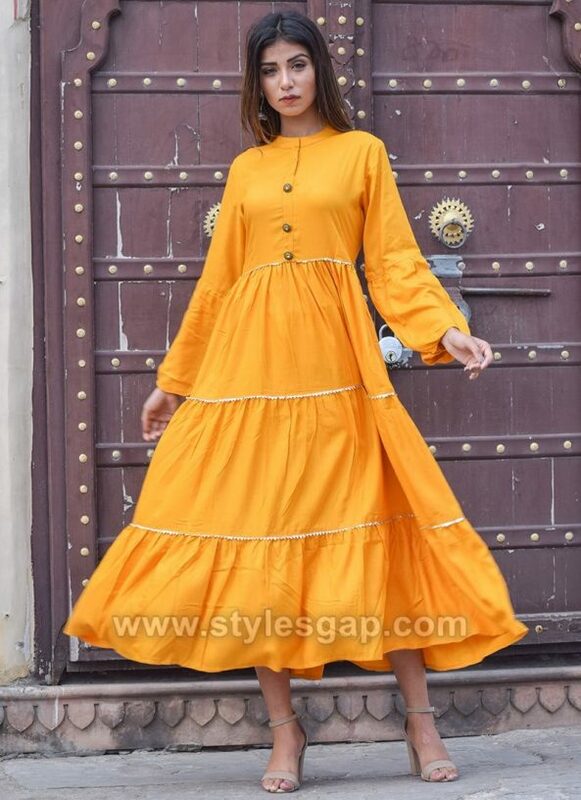 The other one is ankle length sunflower yellow frock with triple frills having a wide bottom. Asymmetric dresses have their own charm. Most people wore it casually. 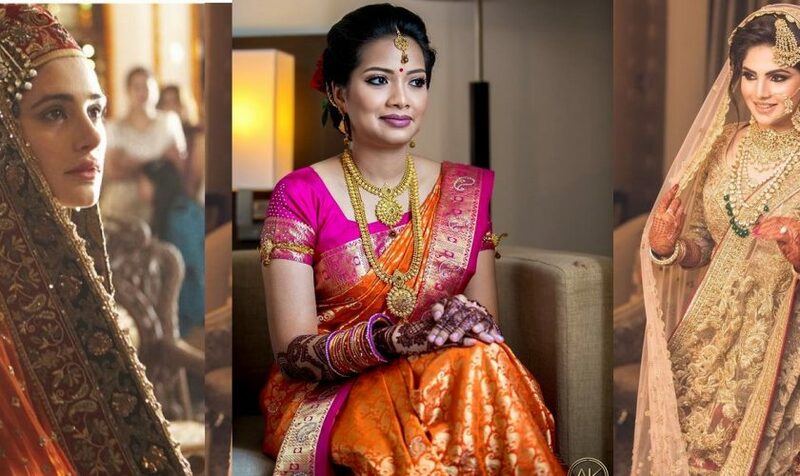 But you can also go for formal by making it look fancier with use of the right accessories like bag, jewelry, heels, etc. 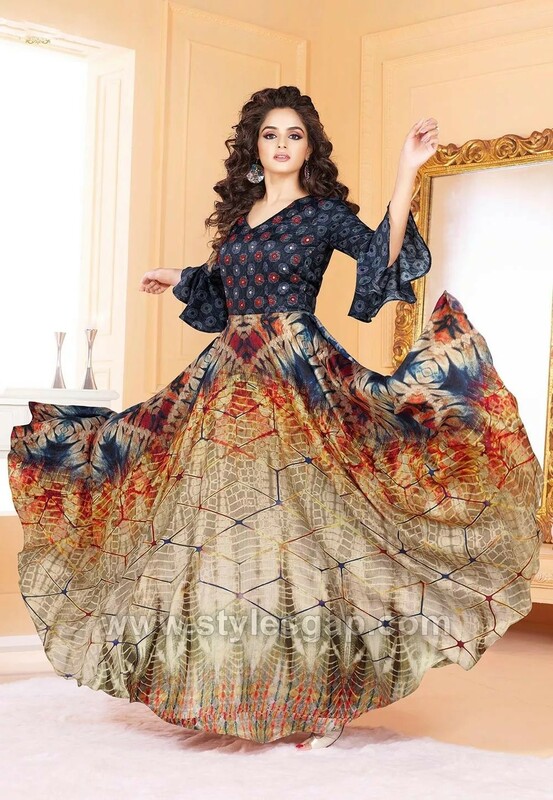 Posting these two beautiful art silk frock designs. 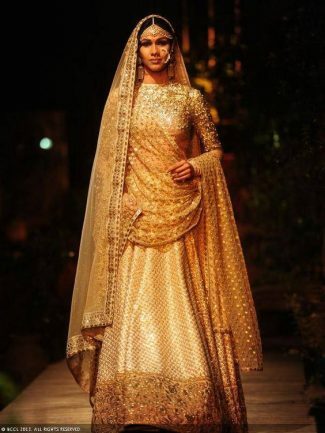 Fashion trends in Southeast Asia are still connected to the roots of its Mughal emperors. Even after many years, our culture reflects their influence. 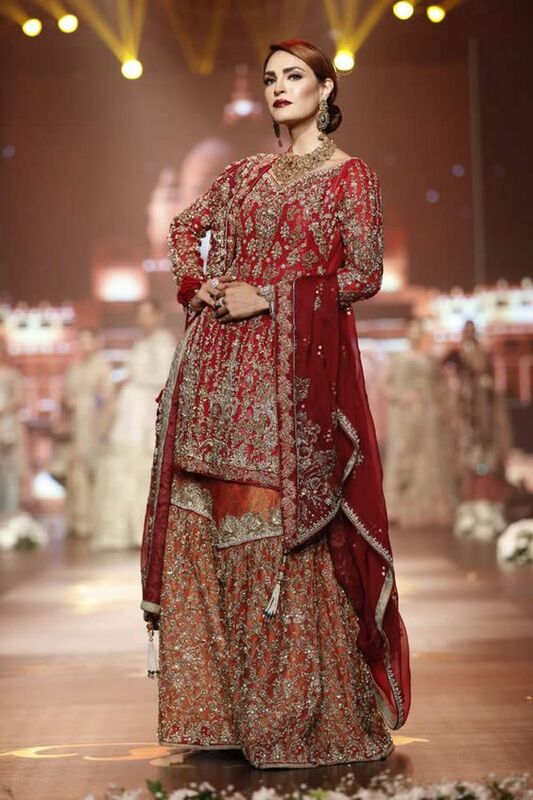 Especially when it comes to apparels, there is a variety of dresses which clearly remind us of Mughal’s era. 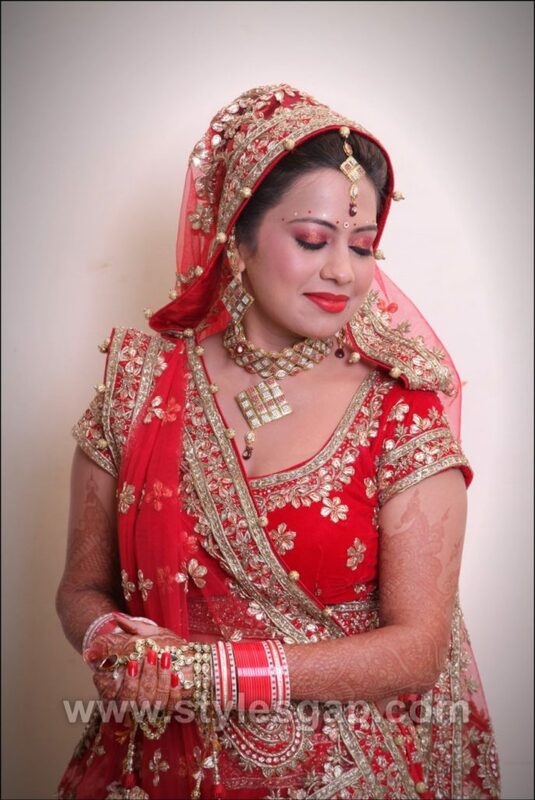 The traditional Anarkalis also take us back to the old times. 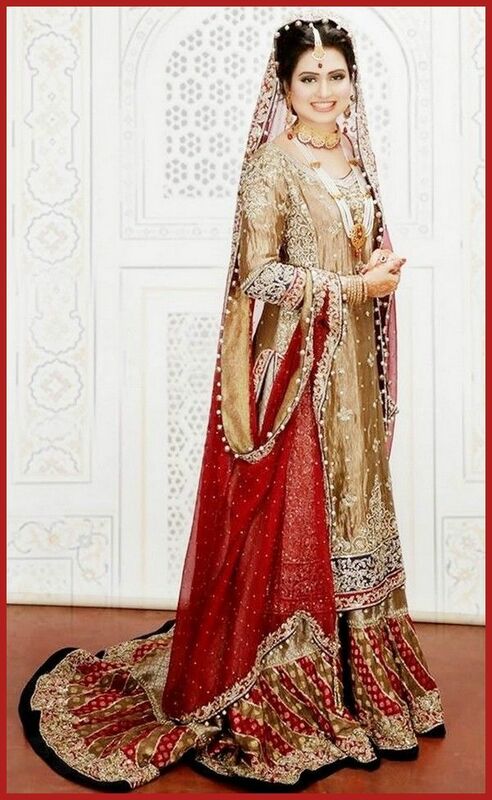 Long beautiful Anarkalis with elegant churidars look too pretty. They simply magnify the beauty of eastern women. 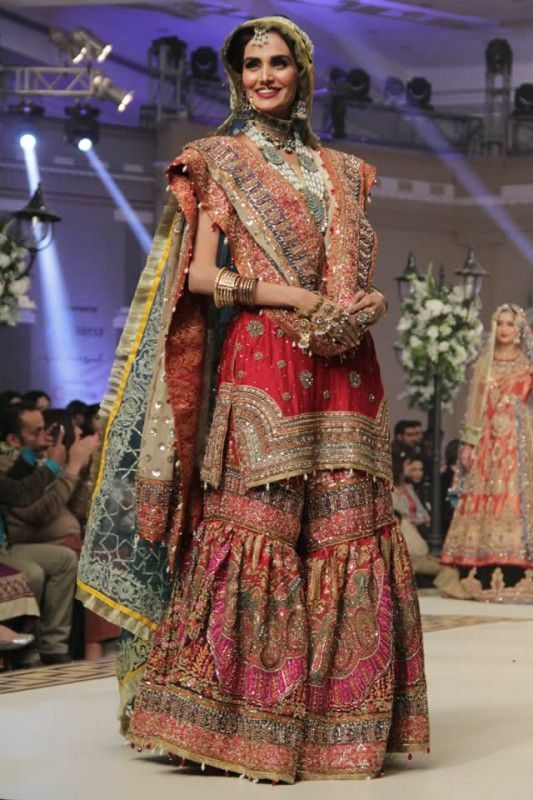 Dresses like these are worth to keep on trend to preserve our cultural heritage. 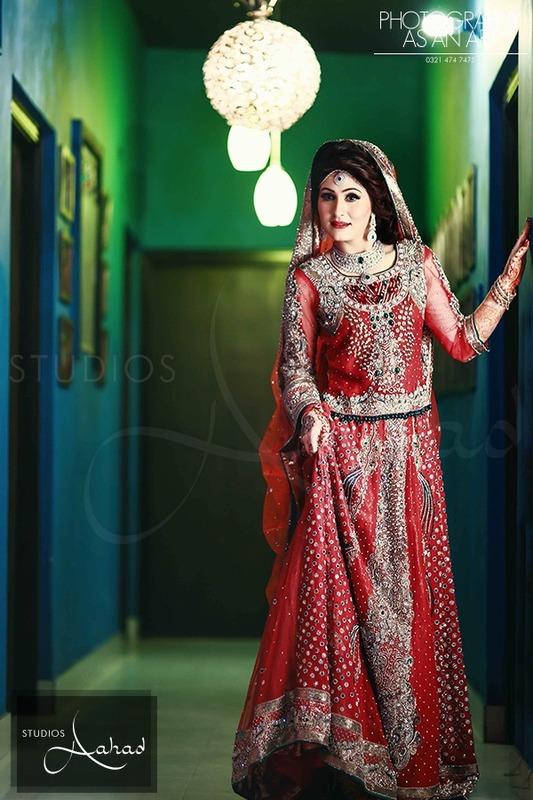 Today we are sharing the Latest Anarkali Suits & Dresses Designs. 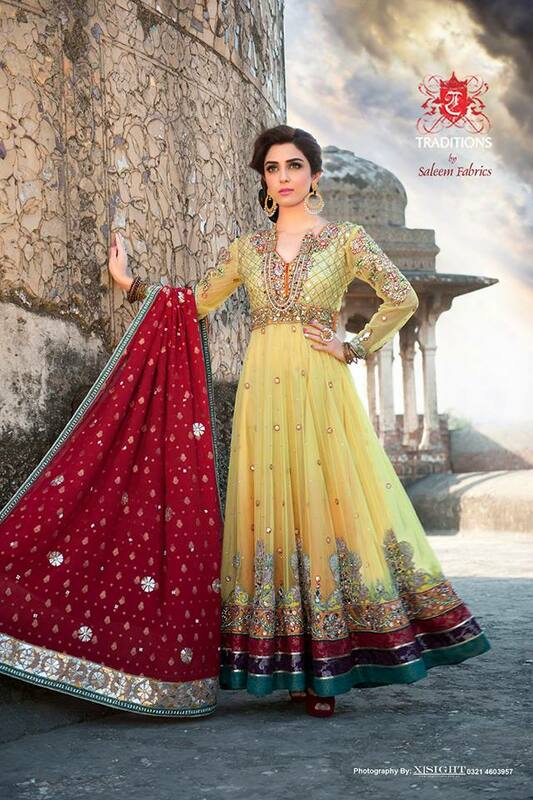 Natasha Couture is one of the best fashion selling brands that provides you the variety of apparels including salwar kameez, sarees, kurtas and Anarkalis. 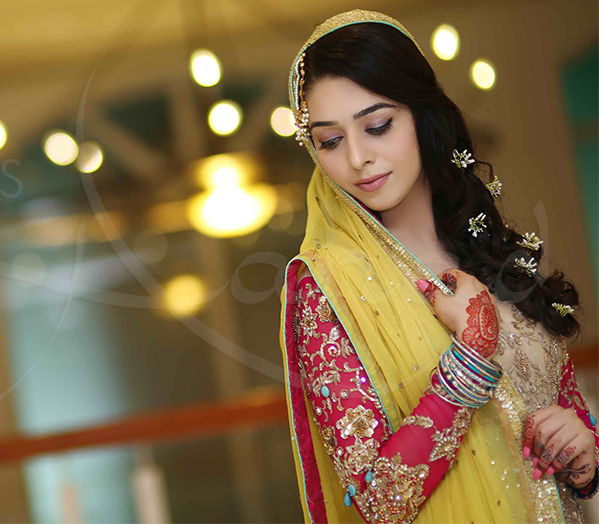 Their collection is indeed the finest to wear and to carry on all types of occasions. 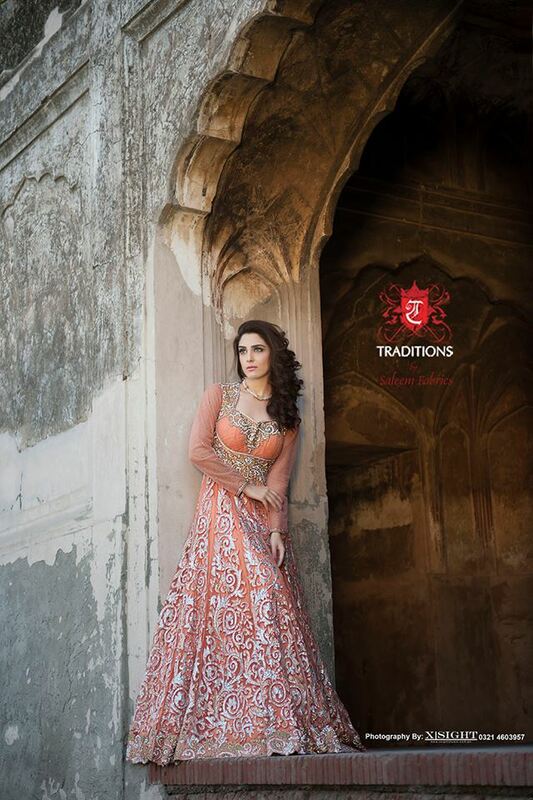 Like every year, this brand brings you the latest of its collection for Anarkali dresses for this year. 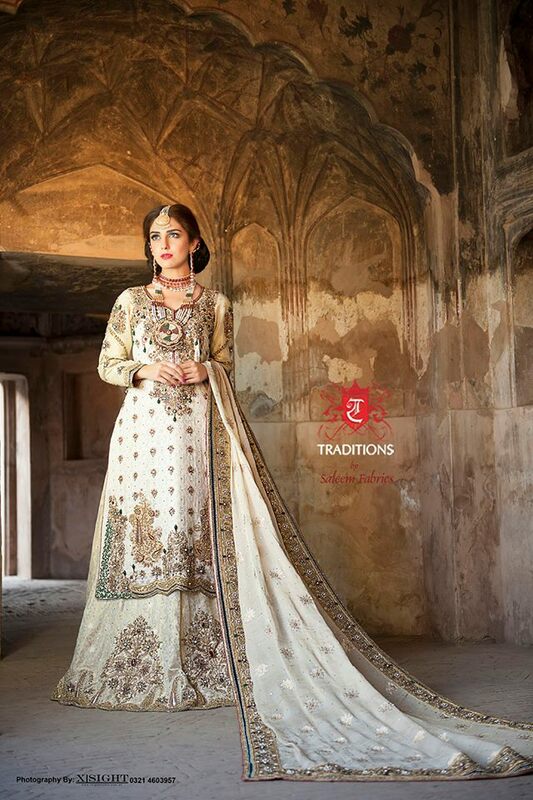 It will take you by no surprise that Natasha Couture has created a bold, fancy, elegant and incredibly gorgeous range of Anarkali suits designs collection. It has made its name not only in India, but it also has made its customers in many other countries. 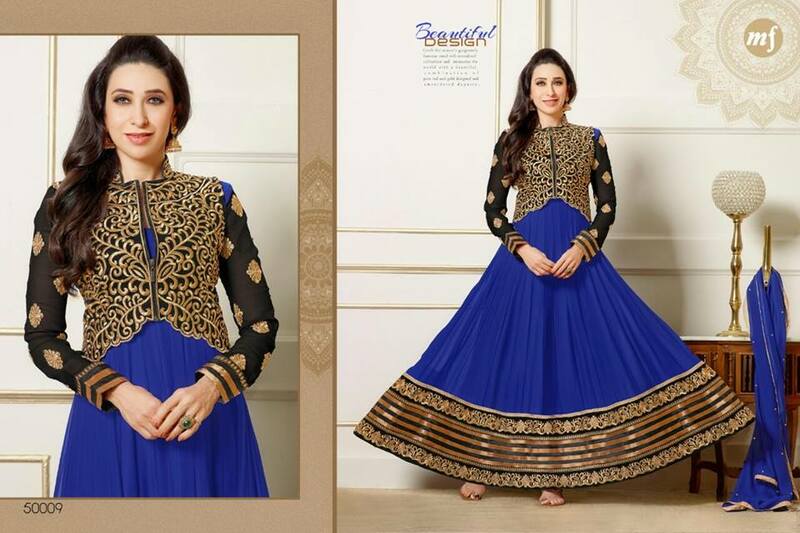 The Latest Anarkali Suits & Dresses Designs Indian Collection contains beautiful designs of Anarkalis. Natasha Couture is going to provide yo with the best deals with the best prices. The color scheme is kept highly surprising carrying the variation of green, blues, red, rust, ivory, beige, metallicgreyss and purple. From the old traditional styles to the newest wedding trends of Anarkali suits, you can get all under the label of Natasha Couture. 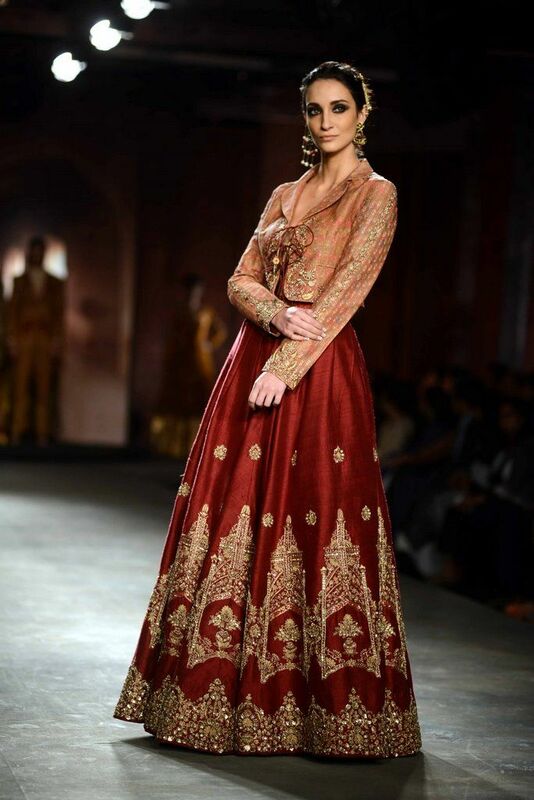 These Anarkali frocks are full of classy flares. Few of the dresses even carry half or full jackets over the dress. 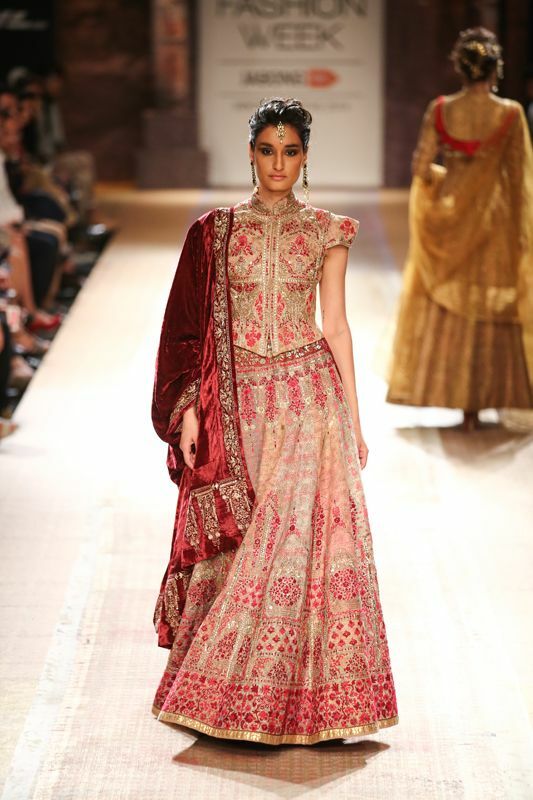 The dresses carry the extravagant piece of art in the form of fine thread work with such a skilful weaving. 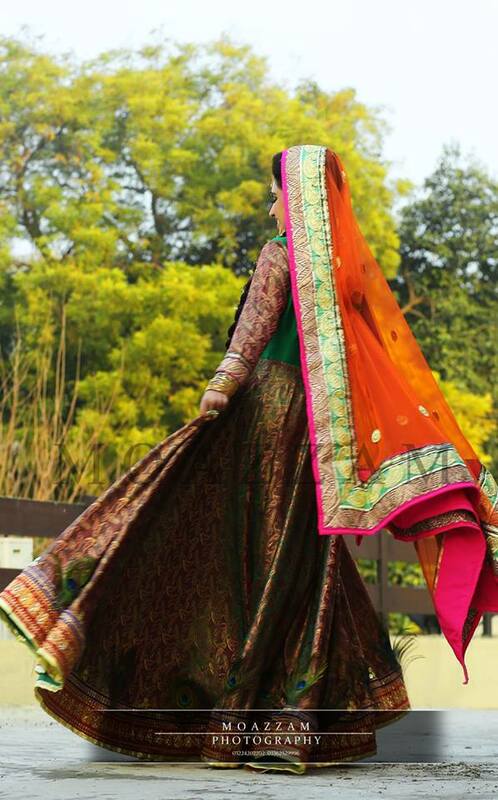 The cholis of these Anarkalis are given a perfect volume with pleats and flare. The neck designs are kept in traditional style. 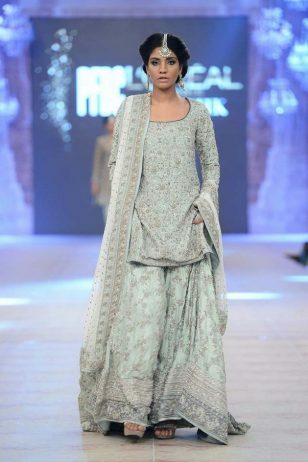 While of the few dresses are embellished with pretty floral patterns over the shoulders and sleeves. Light crinkle chiffon is mostly used in the cholis of these Anarkali frocks. 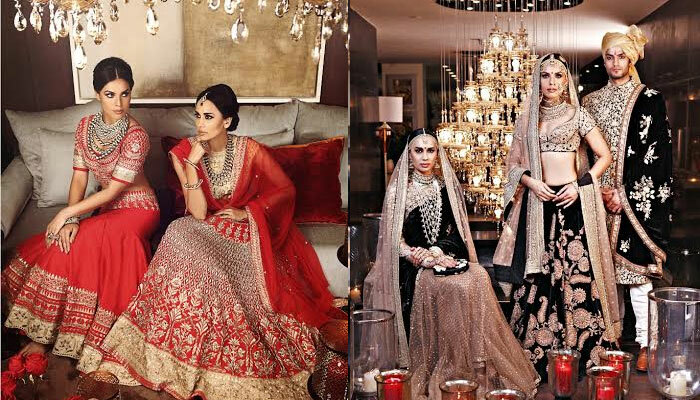 There are two types of cholis that remained in focus while creating this collection. 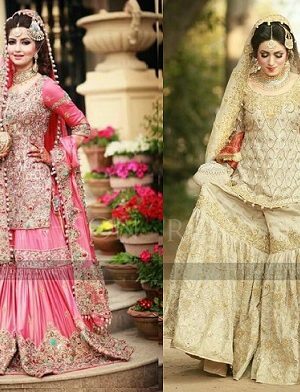 One carries plain chiffon whereas other carries double layers of chiffons with the inner one carrying some prints or the outer one with heavy embellishments. 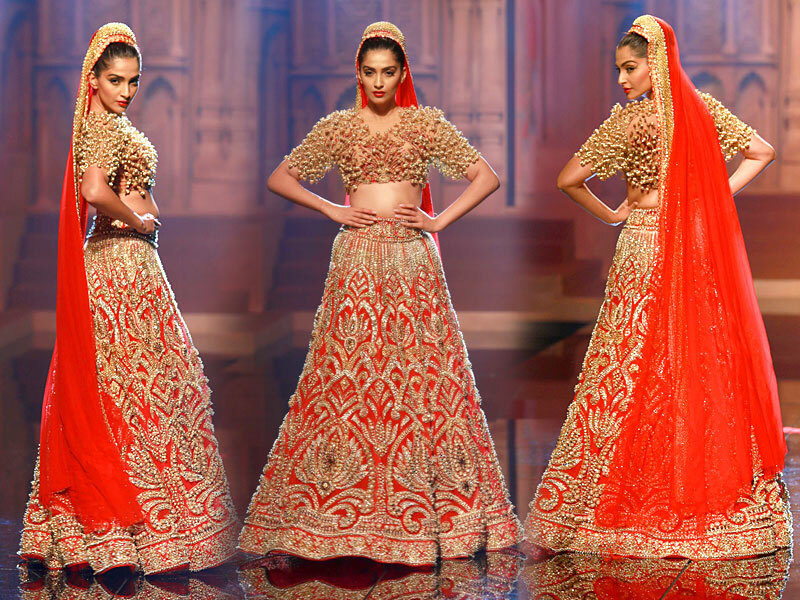 Natasha Couture has no doubt mixed up the staggering styles with stunning designs. 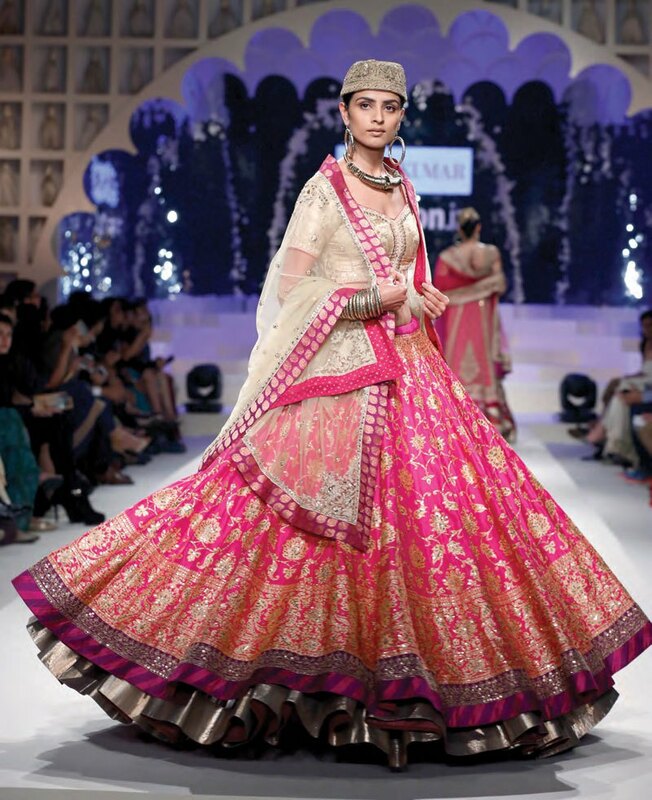 The whole couture is divided into party wear Anarkali suits and formal wear suits. It gives you the ease of selecting the desired one according to the function and occasion. NC has brought out such a fine collection of traditional Anarkali dresses that various Bollywood Divas and celebrities are even seen in these Anarkalis ramping or carrying them on wedding occasions. So either you want to keep it casual or want to keep it glamorous and glitzy.